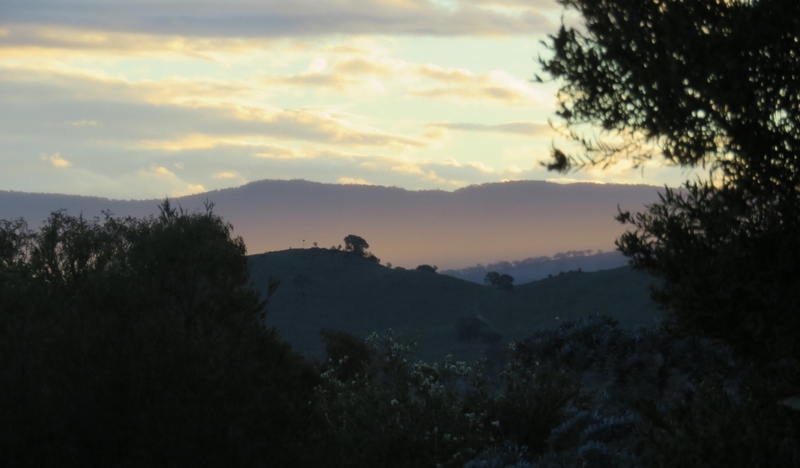 The shadows of the trees are longer in the evening light, the air is cooler, and sweeter..
…autumn is on its way. 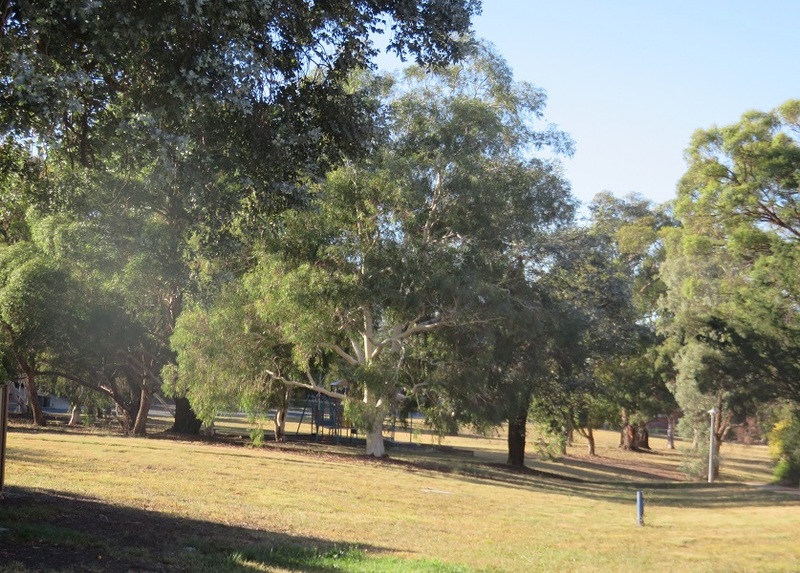 The lovely green (watered) lawns of Lennox Gardens are deceiving, after this long hot summer, the landscape of Canberra is looking very dry. At the end of summer there is a changing of the guard with our local birds. 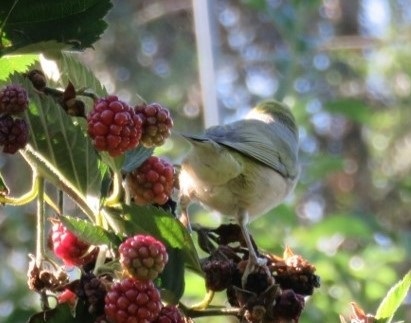 In autumn the tiny Silver-Eyes venture out to feed from our neighbour’s blackberry bushes. 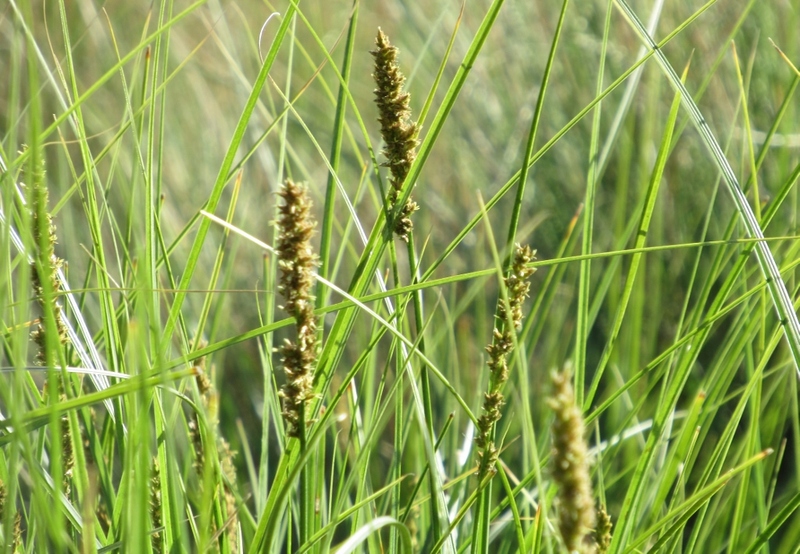 They are a welcome sight. 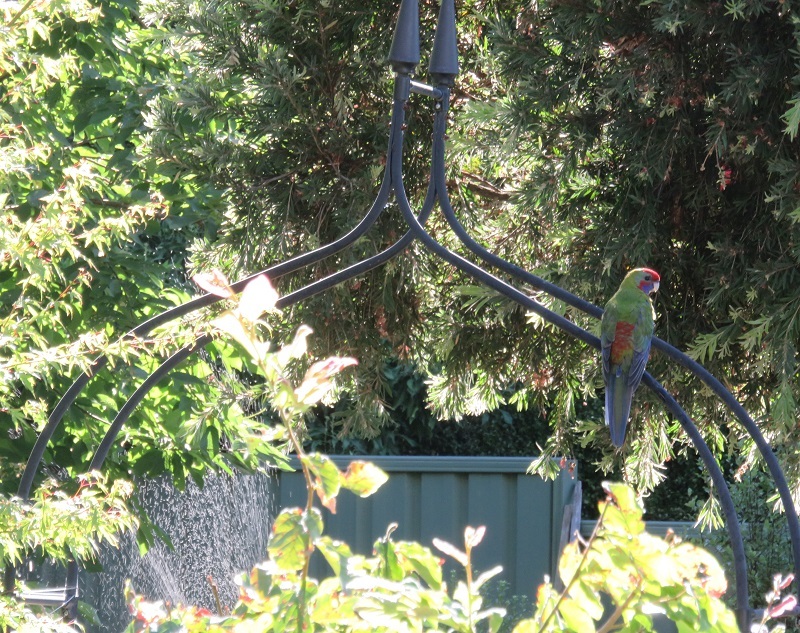 Perhaps as a result of so little rain this last month, more birds are flying into the garden to use our birdbaths. 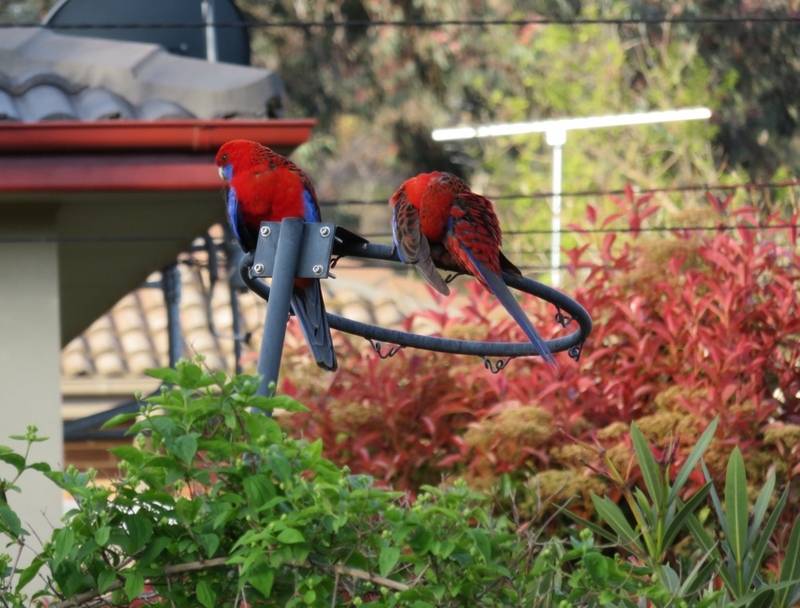 This morning while we were having breakfast on the deck, it was fun to see two young Crimson Rosellas, always shy birds, having the big birdbath to themselves. What a thrill, bathing in the water, and having a shower from the sprinkler. As these two finished their bath, they flew up to the archway in the garden, their long tails spraying water as they flew…a lovely sight. Unfortunately I was unable to catch it with my camera, but here is a similar one, taken almost exactly a year ago! 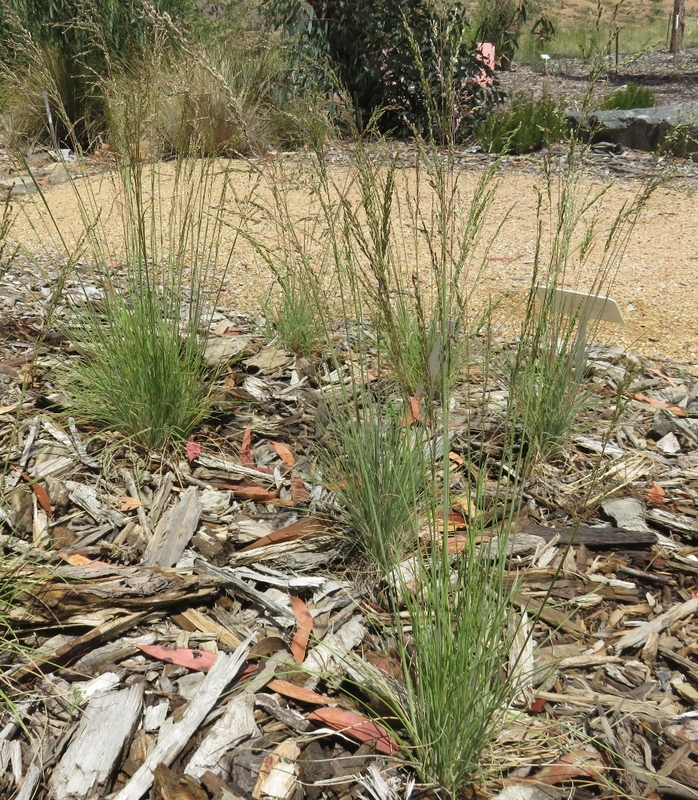 Young Crimson Rosellas begin life with green feathers mixed in with red and blue, last year’s Rosella is still very green in colour. 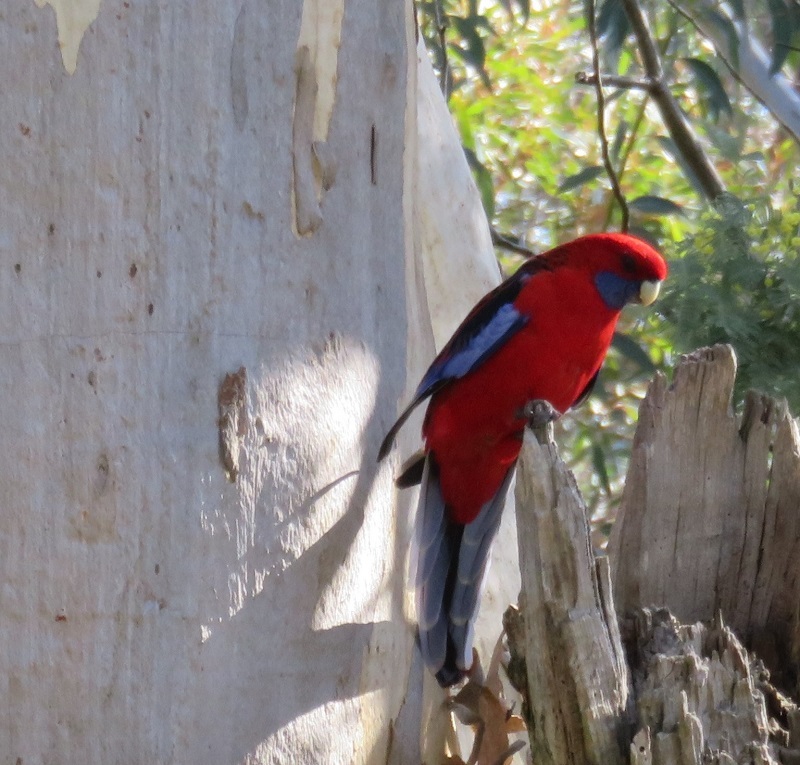 Here is a mature Crimson Rosella in the Australian Botanic Gardens… just look how vivid his colours are, and how long his tail is. What a handsome bird! Fully grown Crimson Rosella at the Australian Botanic Gardens. 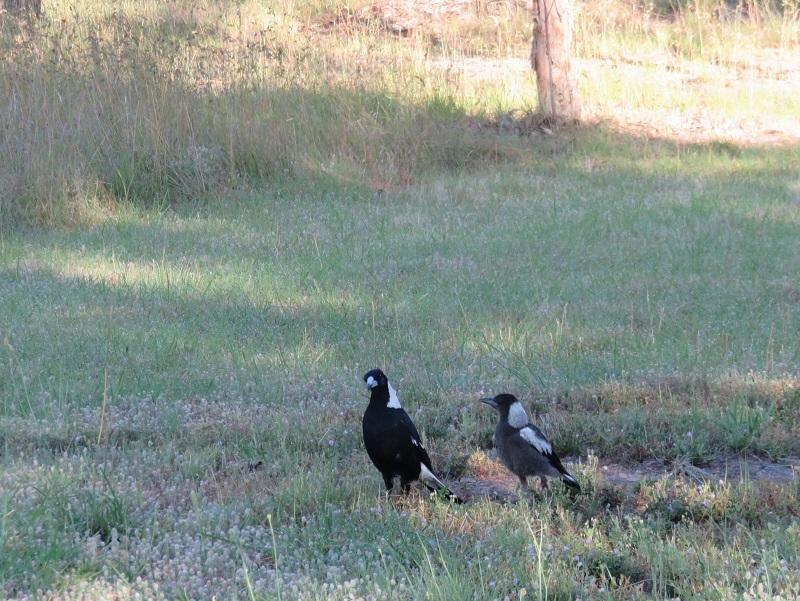 In summer we have three Magpies visiting every morning. 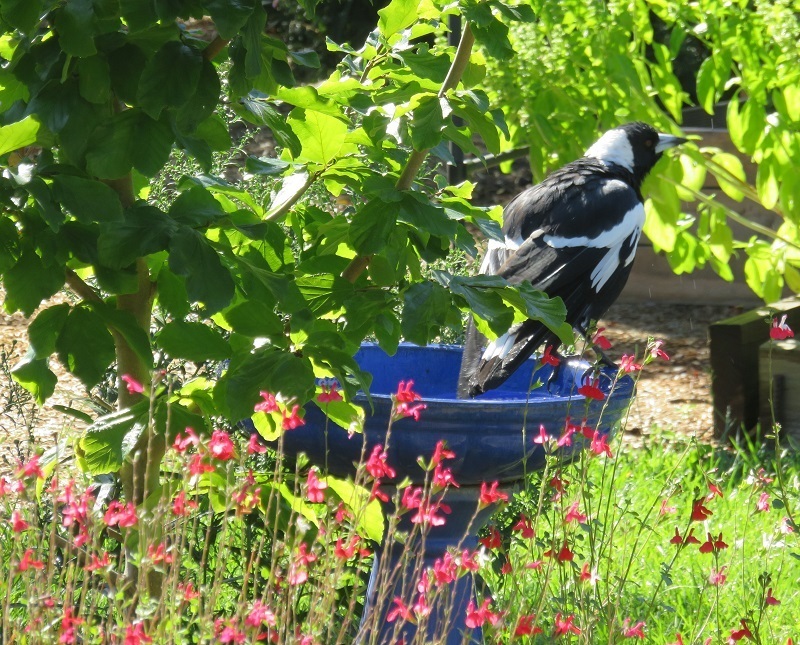 Every year there is at least one Magpie who loves water just a little bit more than the others. Often the youngest one potters around the garden by himself in autumn, a little bit like the youngest member of the family, we enjoy his company….before he too, leaves to join a new group of Magpies. The youngest Magpie, lingering in the water.. Here is a young Magpie watching her mother, who has her head tilted listening for insects and grubs in the grass and in the ground. 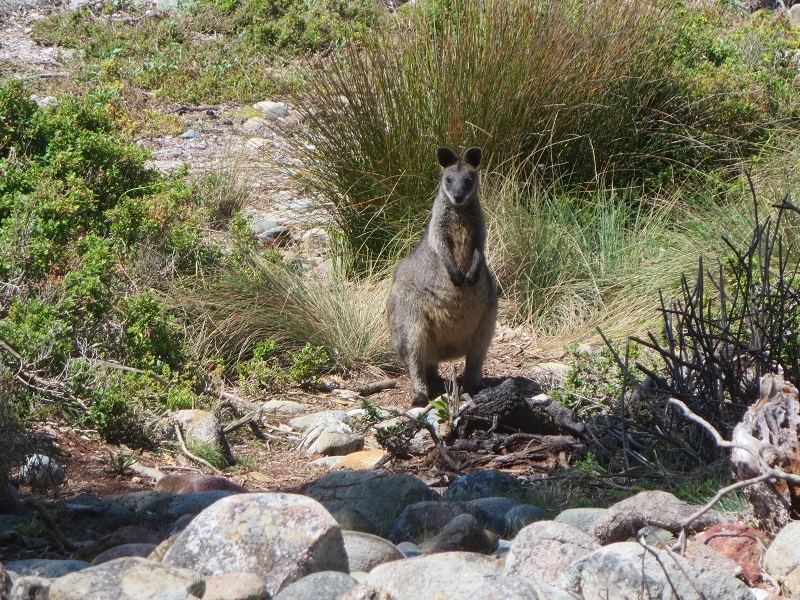 Another youngster, learning her survival skills. 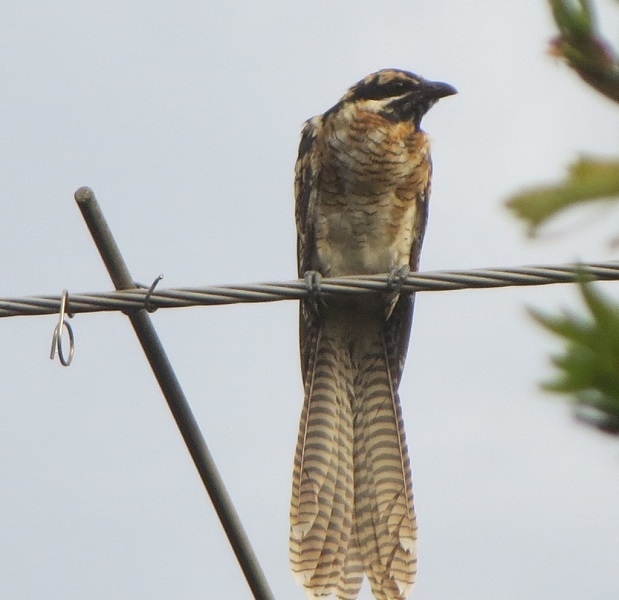 An unwelcome guest in our neighbourhood in summer is the Eastern Koel. 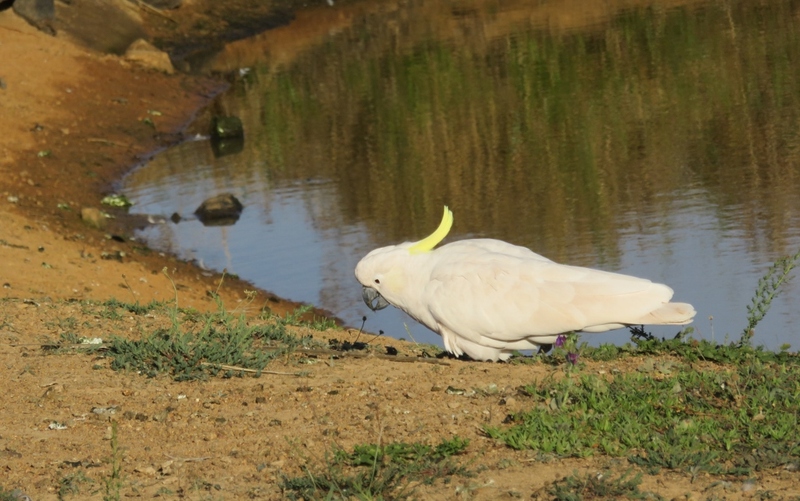 This bird migrates all the way from tropical New Guinea to Australia for the breeding season. 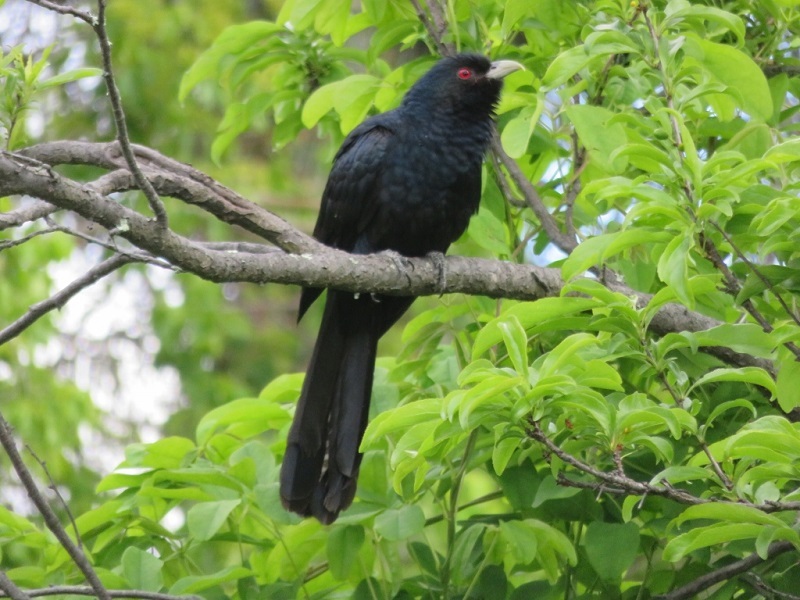 In recent years the Koel has progressed further south each year. The Eastern Koel is a member of the cuckoo family. 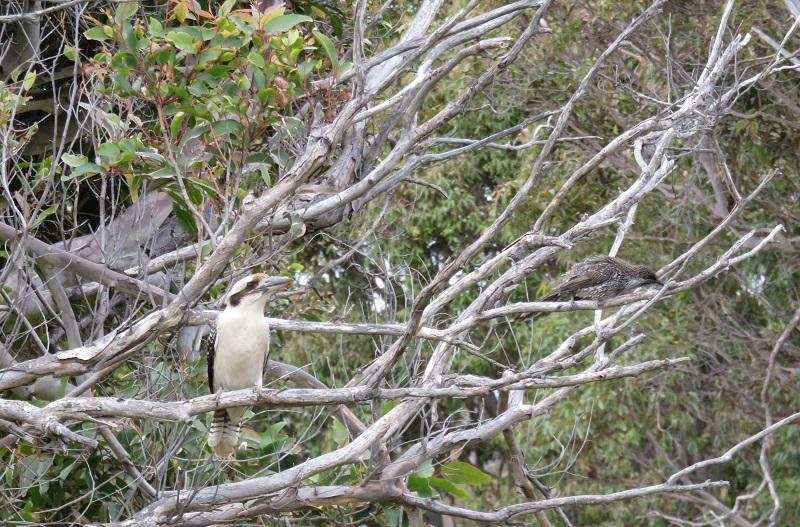 The female lays an egg in the nest of another bird, (usually a Red Wattlebird) and when the baby Koel hatches it pushes the other eggs out of the nest. 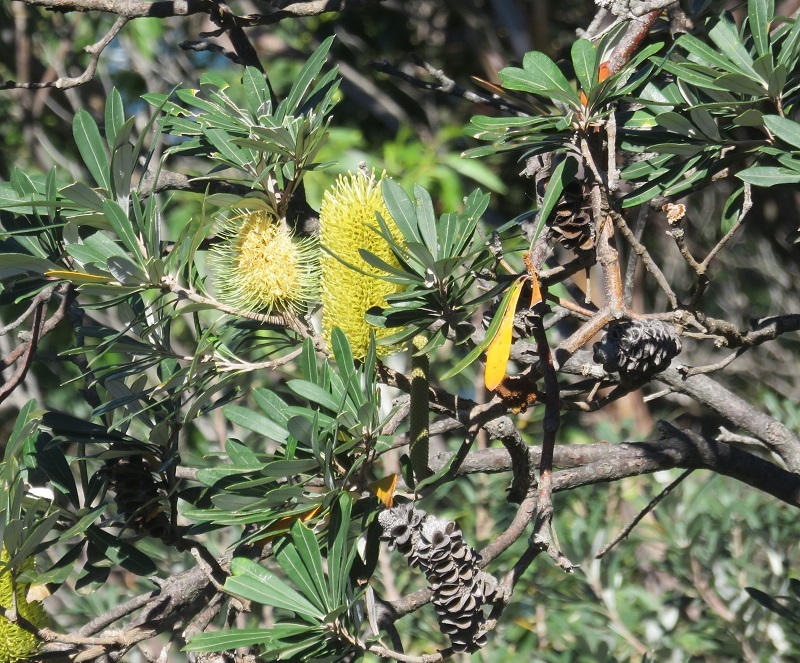 For the past three years a Koel pair have visited a neighbourhood garden, left an egg in the Red Wattle bird’s nest, and moved away. 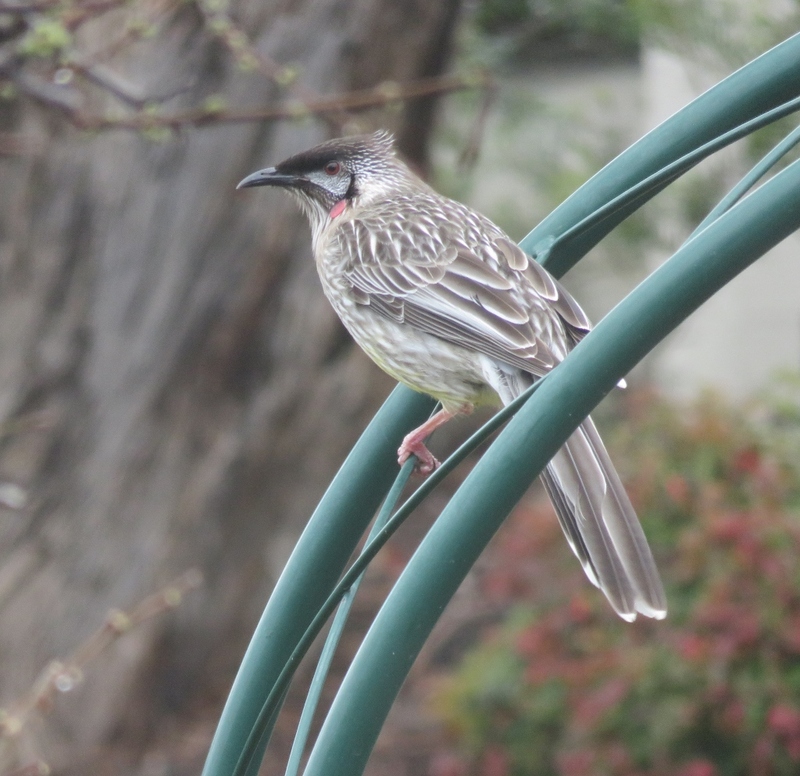 All through the summer, a pair of Red Wattlebirds are the hosts, and the young Koel cheeps incessantly while the significantly smaller parents desperately search for food for the nagging youngster. During the summer the young Koel grows to twice their size. 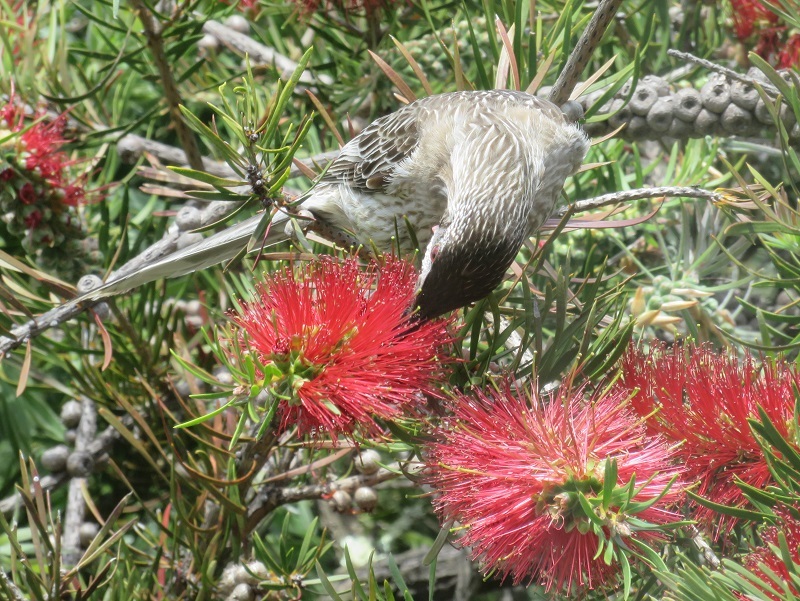 The Red Wattle Bird feeding from a Bottlebrush bush. 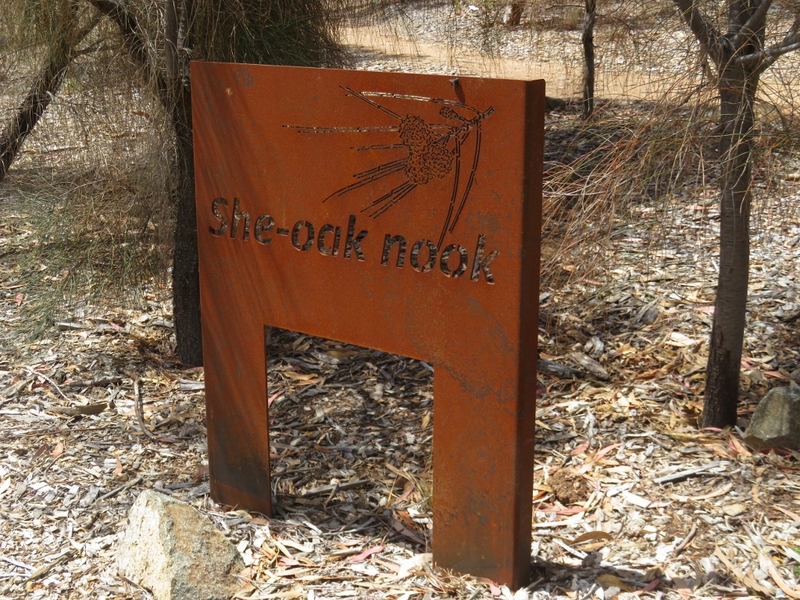 According to Birdlife Australia, it is still uncertain as to why the Koel comes so far south to breed, perhaps because the weather is warmer, the berries and fruits are in abundance in Canberra, and also the poor unsuspecting Red Wattle birds have lived in this region for a long time, and have proved to be excellent parents. The Red Wattle bird looking slightly annoyed, and with good reason! However, one of the most welcome bird calls in autumn is the Eastern Spinebill. 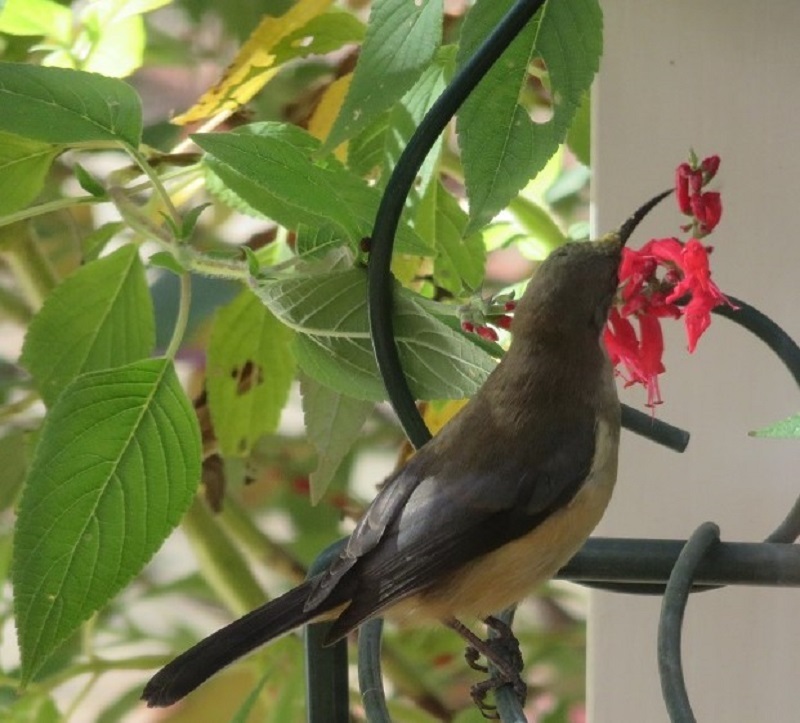 Yesterday this tiny delicate bird arrived on the deck, and with a powerful call, it settled into feeding from the fuchsia. 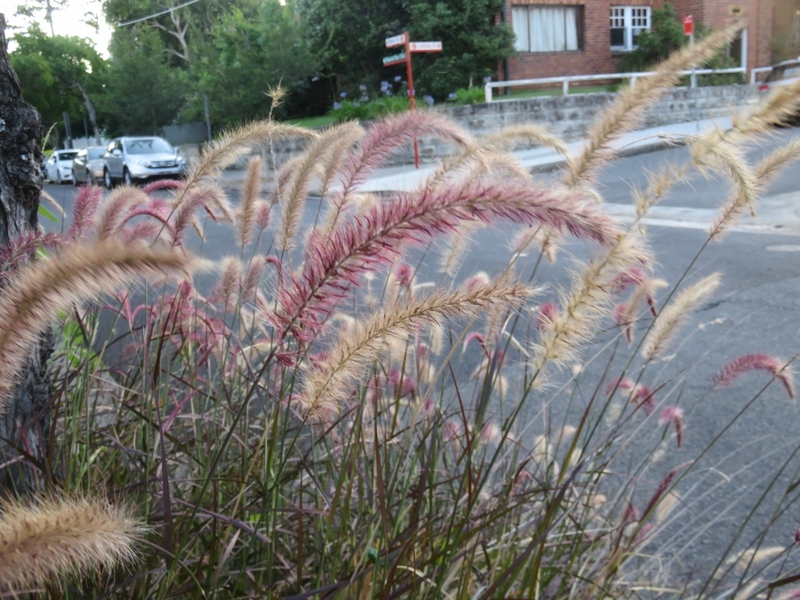 Autumn has truly arrived! 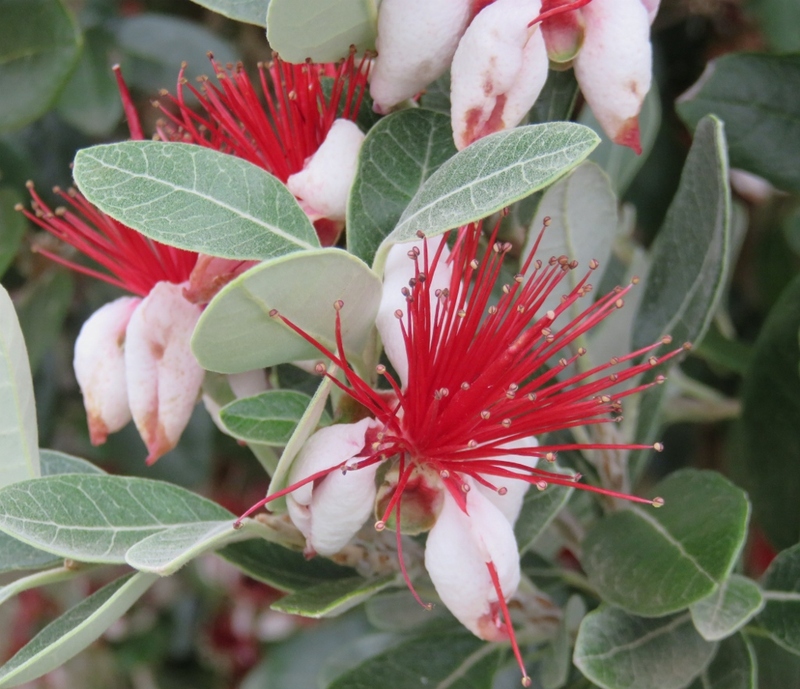 The Eastern Spinebill favours the flowers from the Peppermint Sage, but, this year, either he is early or the flowers are late, so I have used a photo from last year. 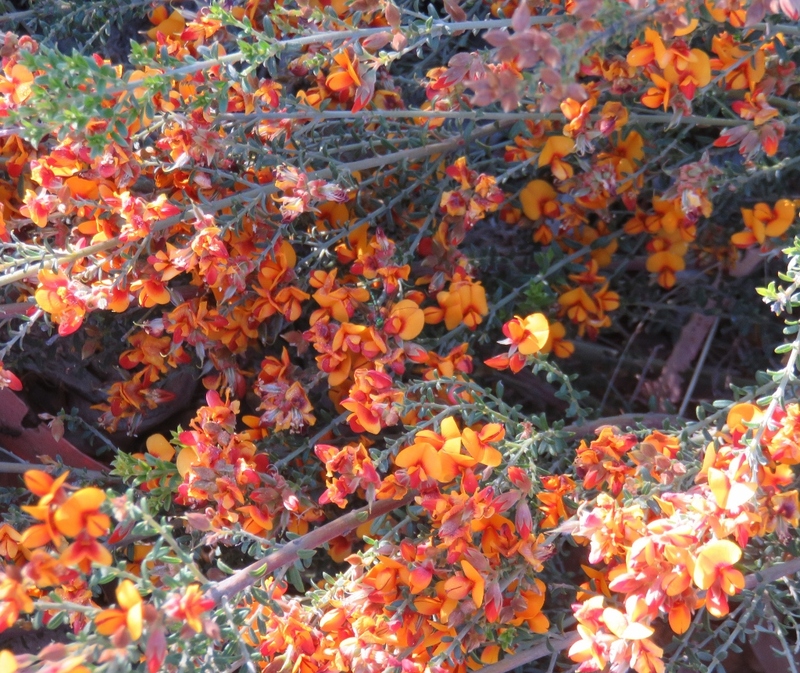 The Eastern Spinebill feeding from the flowers of the Peppermint Sage. 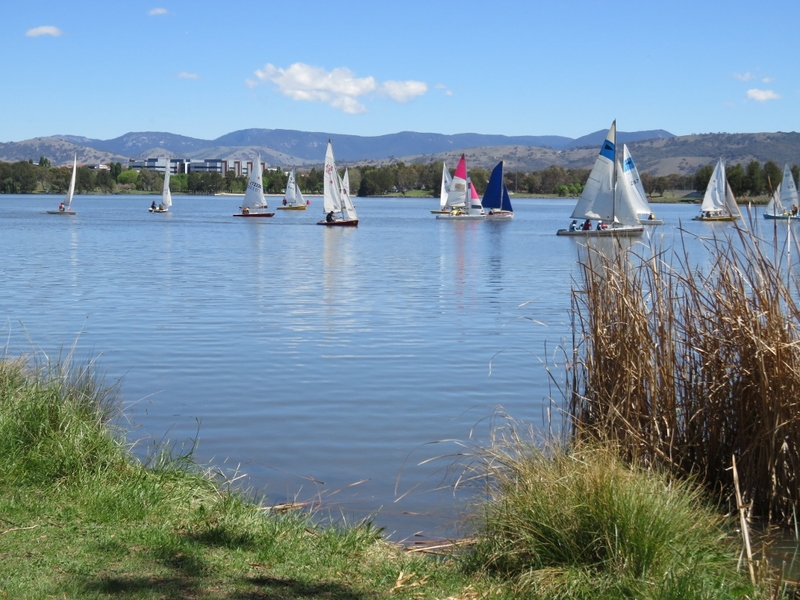 Canberra also has its birthday in March, so there are lots of concerts, picnics, hot air balloons, and general outdoor gatherings. 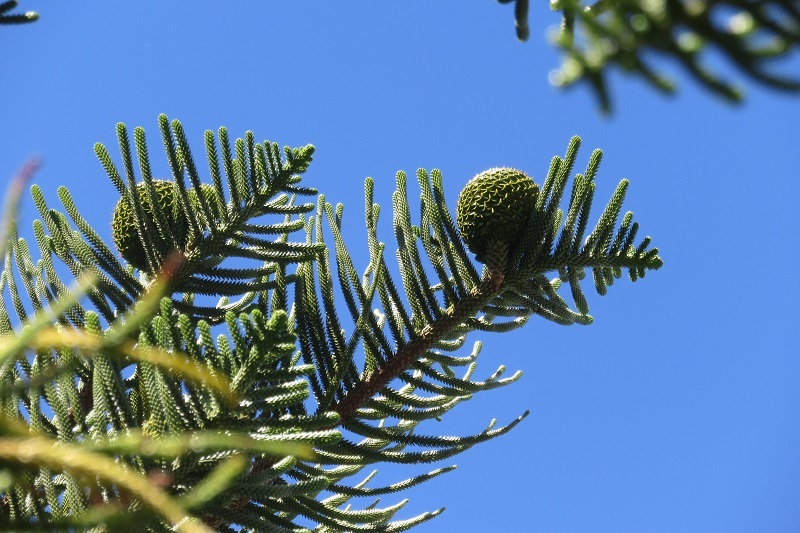 It is a wonderful time to catch up with family and friends. 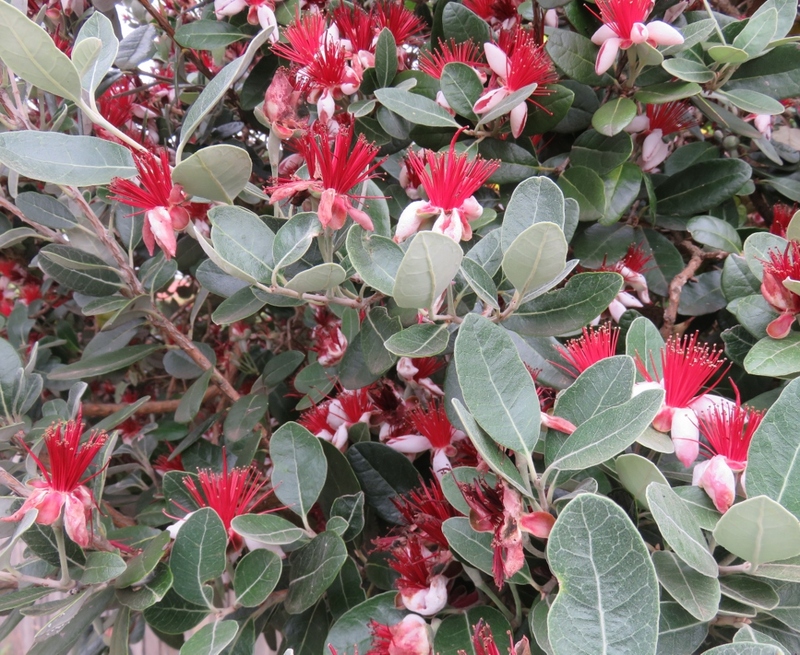 I hope you are enjoying your changing seasons, where ever you are in the world. 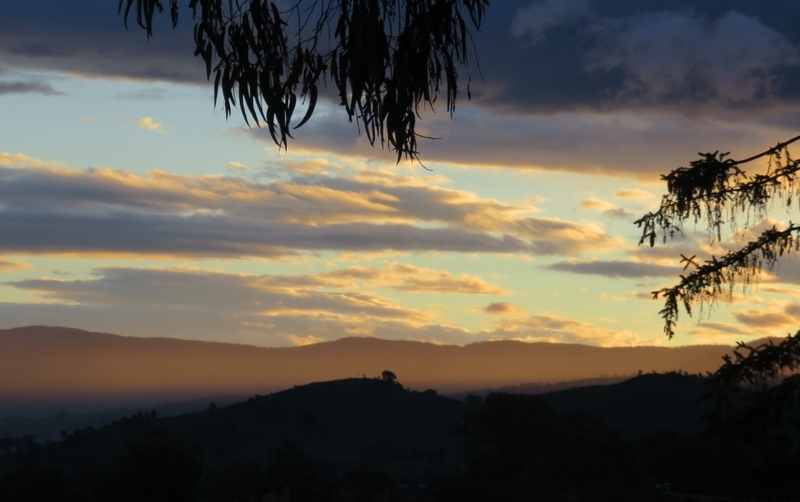 The best birthday present for Canberra’s autumn would be good soaking rain for a sustained period of time. Crossing fingers for that. 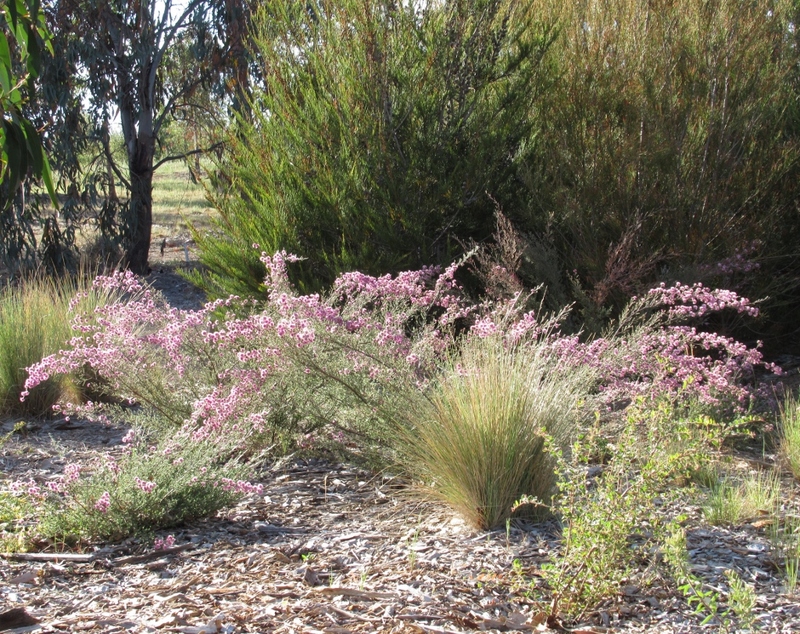 This entry was posted in Canberra's Public Gardens, Canberra's Suburban Gardens, Wildlife in the suburbs and tagged autumn, Birdlife Australia. 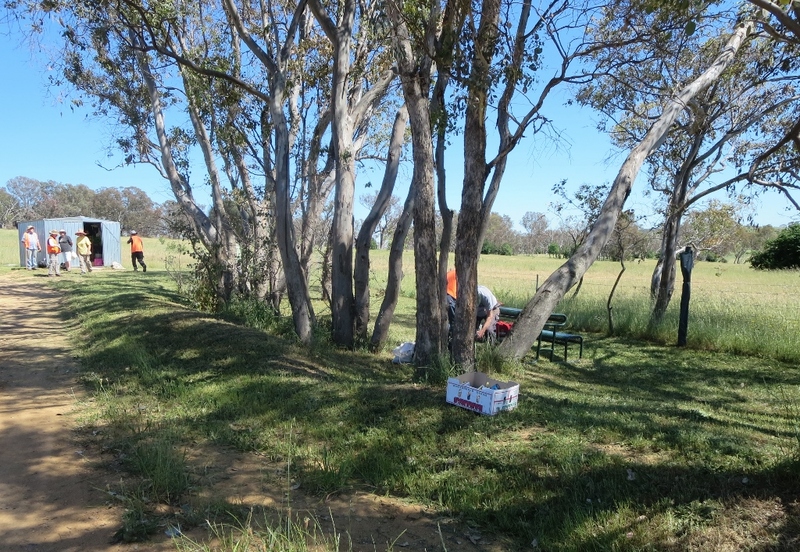 Lennox Park, Bottlebrush bushes, Canberra, Eastern Koel, Eastern Spinebill, Magpies, Peppermint Sage, Red Wattlebirds, Silver Eyes, water on March 16, 2019 by germac4. 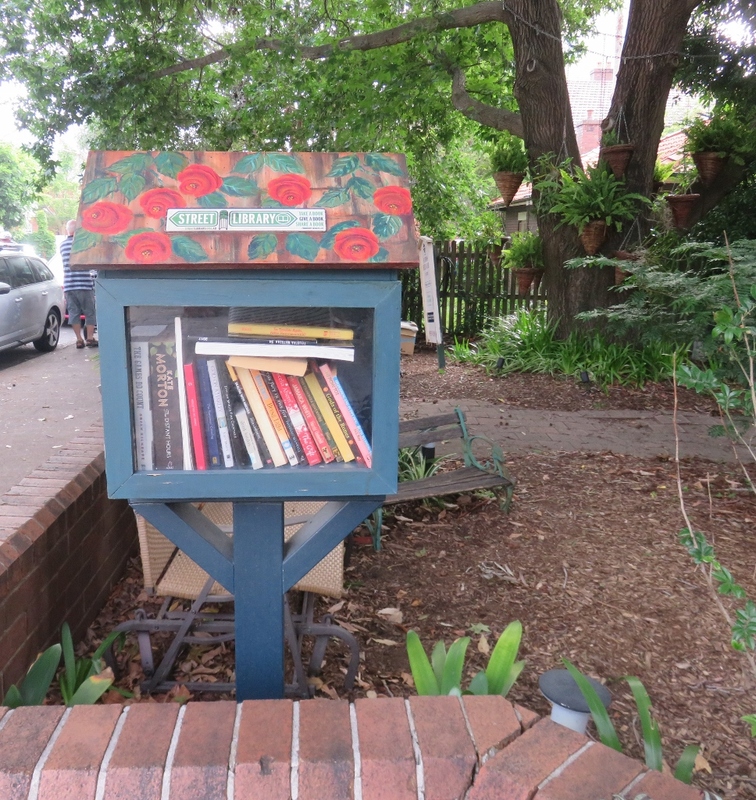 Canberra is a small city, so a book launch for two really enticing cookery books, is not to be missed. 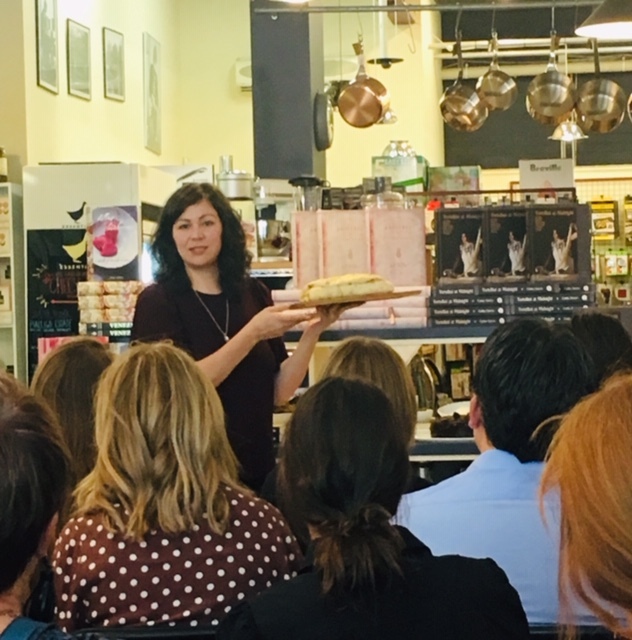 We arrived at the speciality kitchen shop, The Essential Ingredient, to hear Emiko Davies and Tessa Kiros talk about their beautifully illustrated cookery books, called Tortellini at Midnight,and Provence to Pondicherry respectively. 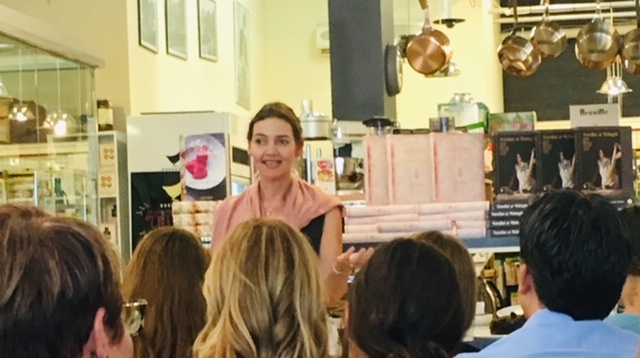 It was an inspiring afternoon, full of wonderful stories of food, family and traditions, in Italy and France (and some food tasting and wine later). Emiko Davies is Australian-born with a Japanese mother and an Australian father. When she left home to travel the world, Emiko lived in Italy for a while. On a cold miserable night in Florence she made a meal for a young man she did not know very well. All she had in the fridge was broccoli, pecarino and some garlic. When he began to eat the meal he said ”I’m going to marry you!” and two years later they did get married! Emiko now lives in Italy with her husband and two children. She has written three cookery books, but in this one she shares stories and some of her favourite recipes from her Italian family. These recipes she has learnt through tasting and watching, usually from the kitchen table. I cooked the recipe called Nonna Anna’s meatballs (Polpette di Nonna Anna) and it was delicious! Tessa Kiros was born in London to a Finnish mother and a Greek Cypriot father. When she was young the family moved to South Africa. She is now married to an Italian, living in Italy, and she has written and published many books on food, family and the countries that inspire these recipes. 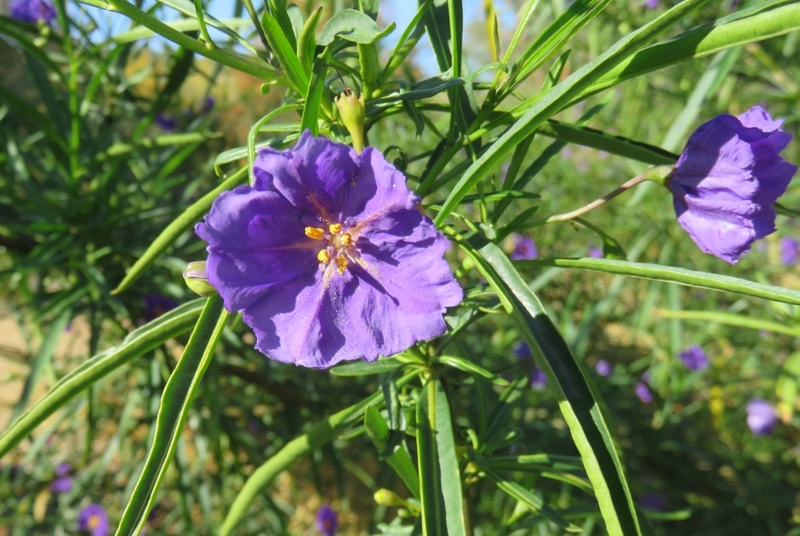 Her most recent book is called Provence to Pondicherry: Recipes from France and Far Away. 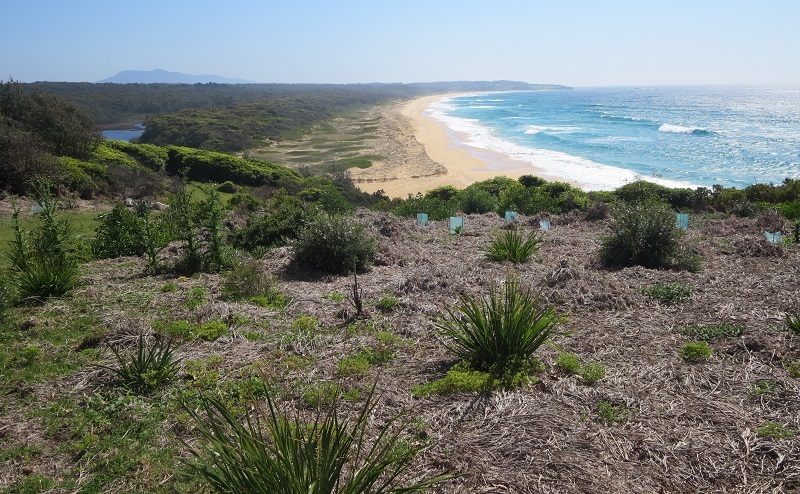 Tessa re-traces the steps of early French explorers travelling to Guadeloupe, Vietnam, Pondicherry in India, La Reunion, and Normandy in France. 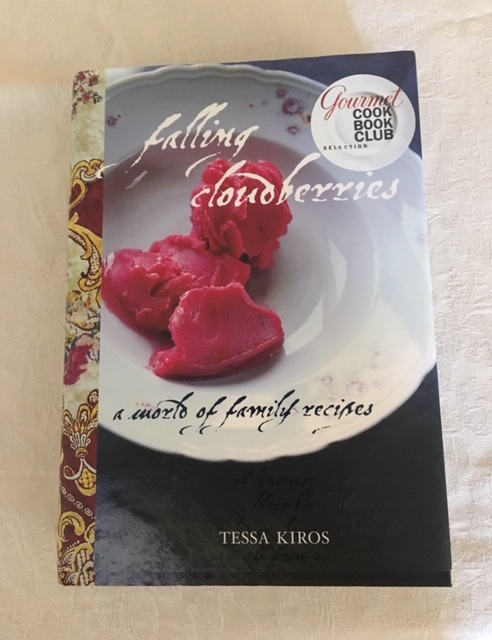 Tessa has written many books and my favourite is her first book called Falling Cloudberries. She wrote this book about her family, starting with her grandparents, taking each one and weaving the memory of them into stories and traditional recipes, giving a rich and colourful family history. The title is taken from her memory of living in Finland, and picking the falling cloudberries. My mother had an old recipe book called “Ouma’s Cookery Book” full of practical recipes for life after the war when food was scarce and people ‘made do’. The book is also full of quotes and comments about life, and could be used as a social history book too. I love this dear old book because it is a companionable reminder of my mother, and I still have some of her hand written recipes tucked into some of the pages. It seems, no matter where you come from, food and family create the first memories, and this is where your stories begin.. Sometimes a happy memory of food and family doesn’t have to be part of a book, it is just a snapshot of life that stays in your heart…. Do you have a favourite recipe, or a cookery book that brings back family memories? 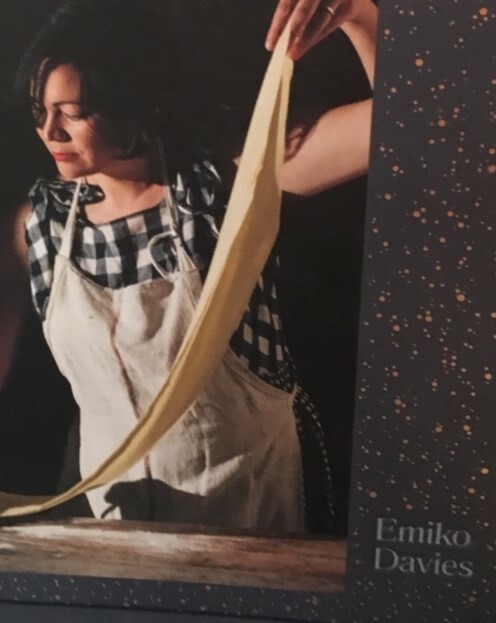 This entry was posted in Food and family and tagged book launch, Emiko Davies, Falling Cloudberries, family, food, Ouma's Cookery book, Province to Pondicherry, Tessa Kiros, The Essential Ingredient, Tortellini at Midnight on March 2, 2019 by germac4. 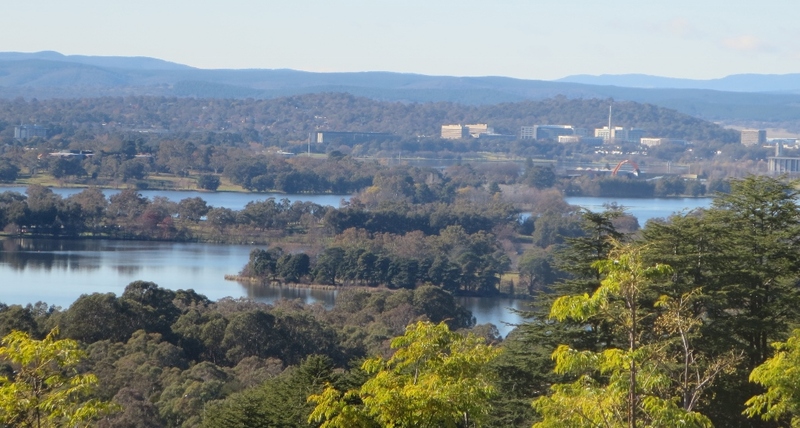 The very pleasant part of living in Canberra is that the city is designed within a landscape, and even the heart of the city is surrounded by space and bush land. 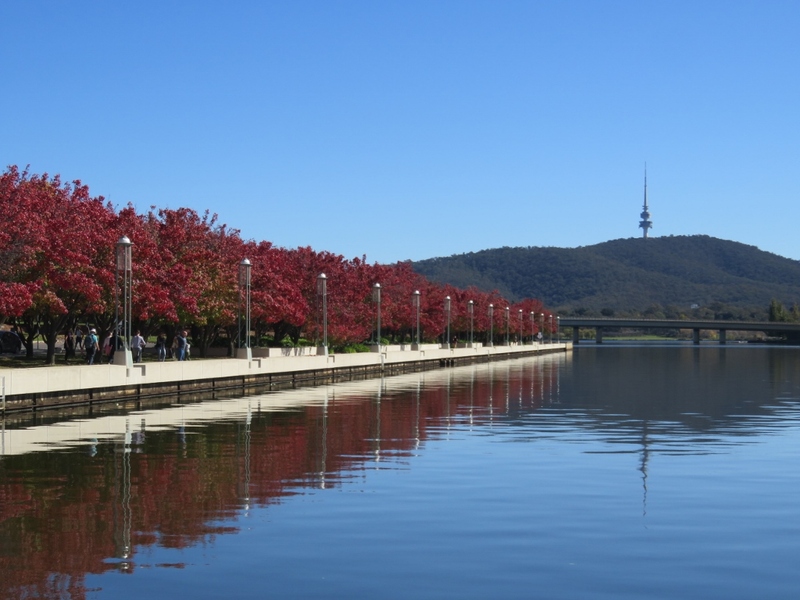 Today we are off to the National Library of Australia, my favourite building in Canberra, surrounded by trees, greenery and the beautiful Lake Burley Griffin. 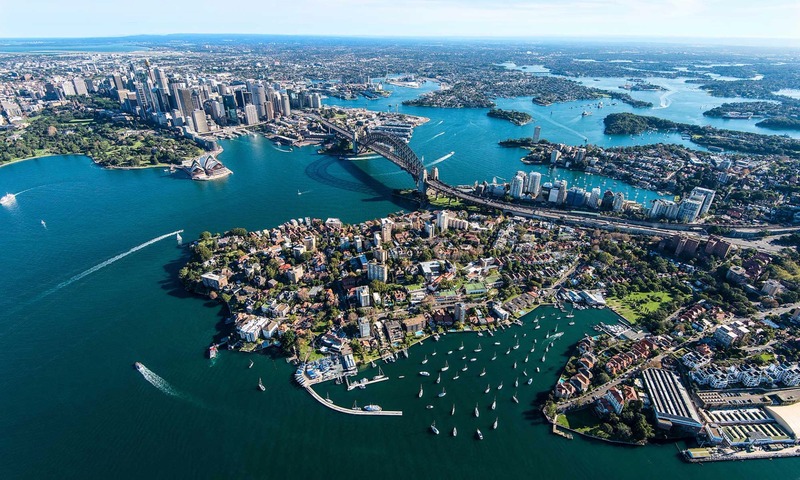 Developers are eyeing off other parts of the lake for a hotel and blocks of apartments, so what better time to appreciate what we do have and can never be changed. 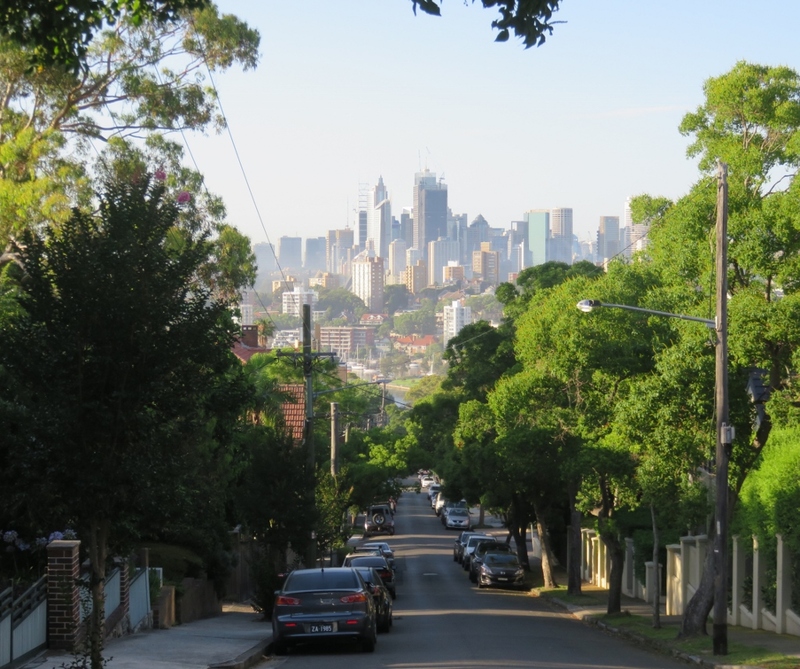 To add to the mix, we are taking our old car for a drive into the city. 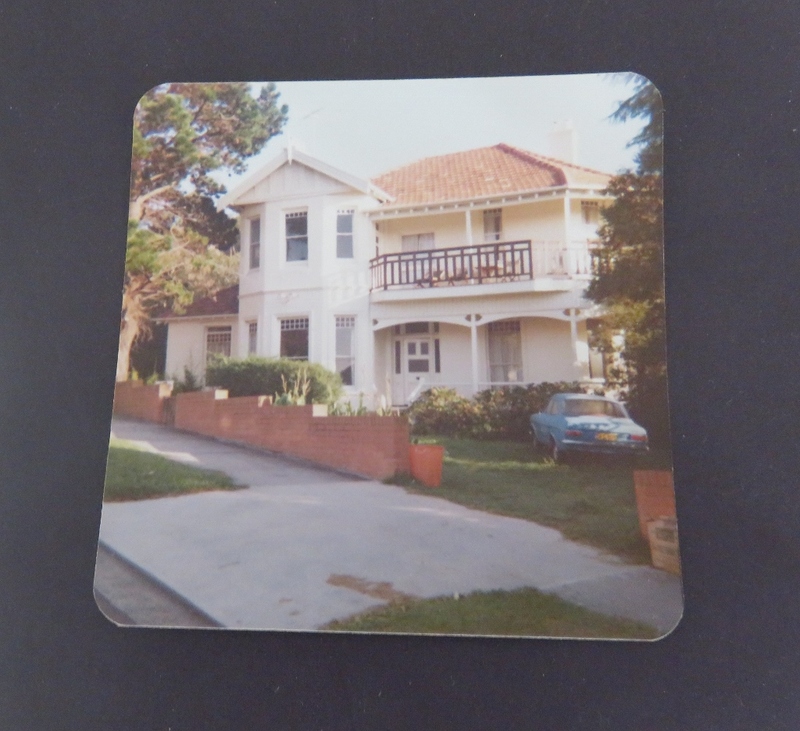 It has been neglected lately and we know our 25 year old car needs regular drives to keep it going…(it has been largely replaced by our newer car…but not a word to Bessie). 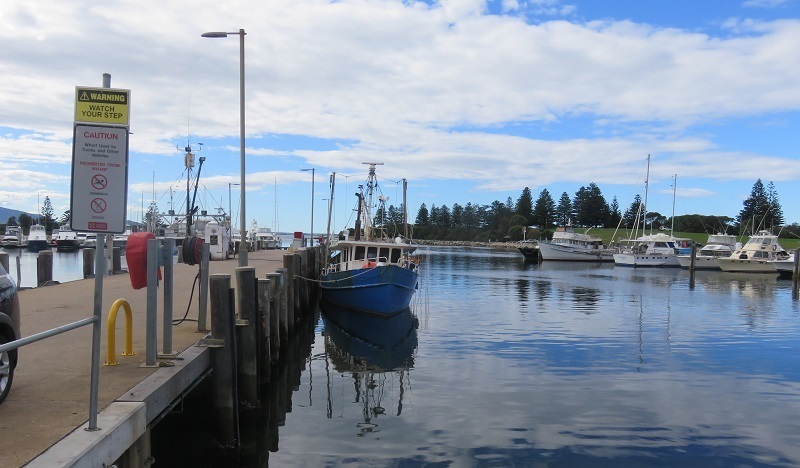 So here goes, may this be the first of weekly drives, in our dear old Magna, and perhaps inspiration for a few blog posts as well. 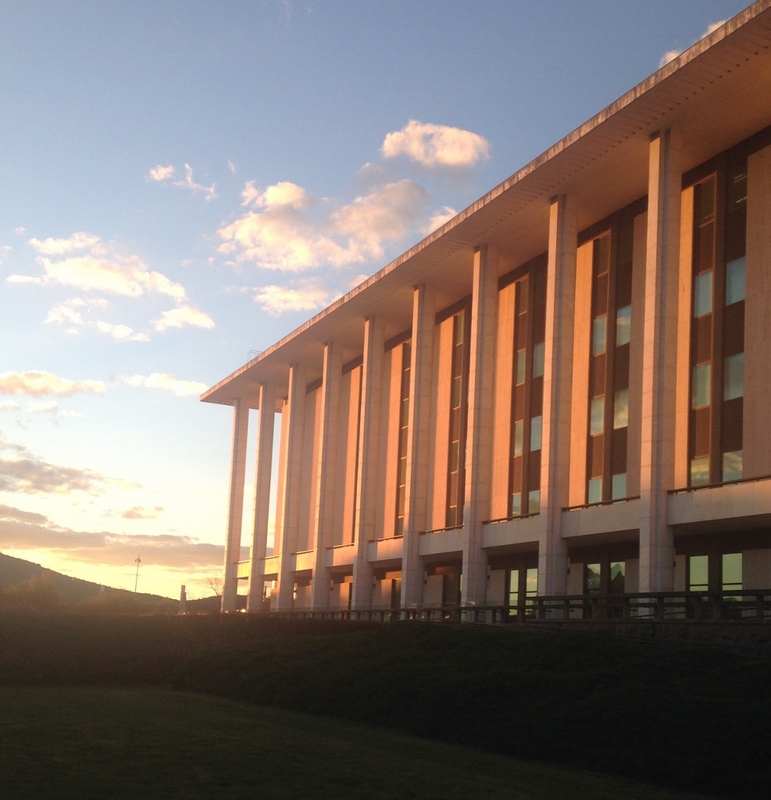 In 1927 the National Library was moved from Melbourne to Canberra with the relocation of Parliament. 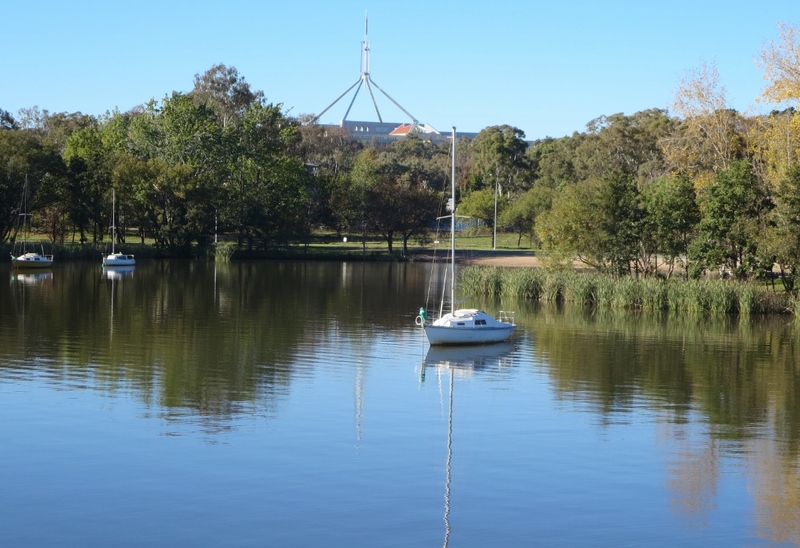 Canberra, as a new, planned city, was not entirely welcomed by the bigger established cities in Australia, until Robert Menzies became Prime Minister in 1939. 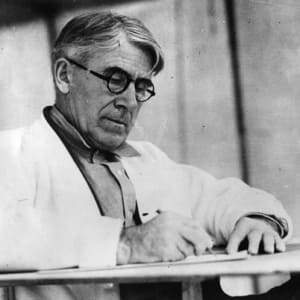 He gave Canberra his complete support, and also took a great interest in the building of the National Library of Australia. Harold White, the first National Librarian threatened to ‘‘throw in the towel” if a purpose built National Library was not built. 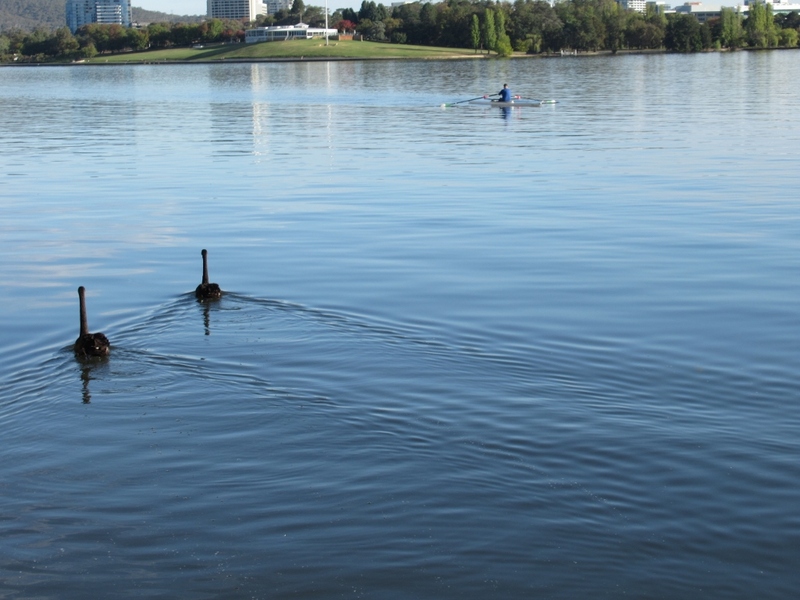 Finally, an Act of Parliament in 1960 formally separated the National Library from the Parliamentary Library and a new building for the National Library’s growing collections and services was opened on the shores of Lake Burley Griffin in 1968. Oh such passion for a building! Would we have this today? 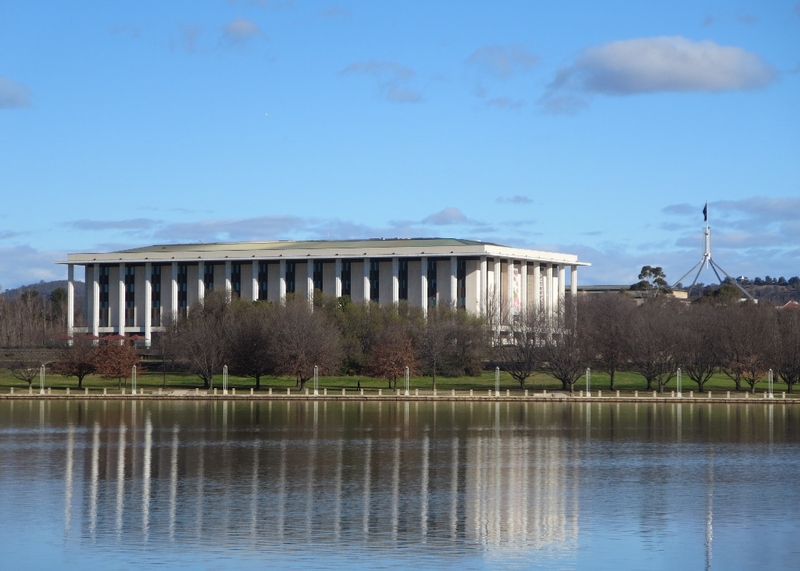 The National Library of Australia was designed by the architecture firm, Bunning and Madden, with associate Tom O’Mahony. 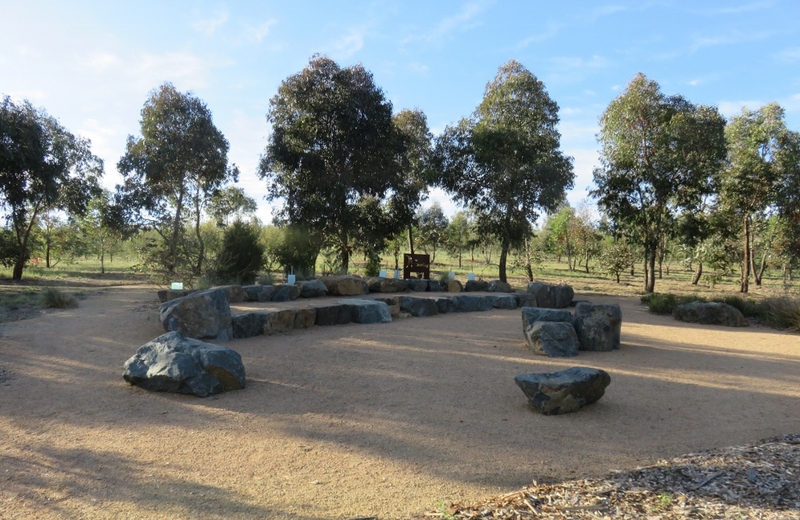 Noel Potter was appointed as the Library architect by Robert Menzies. 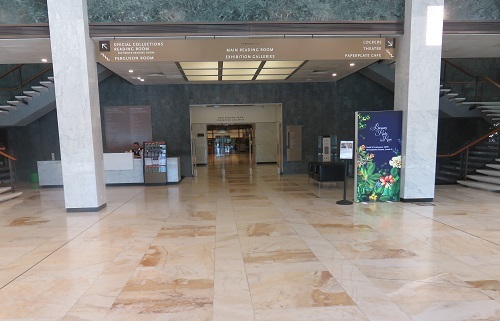 There is something very calm and welcoming about the Library, perhaps it is the cool marble floors in the foyer, the space, the quiet environment. 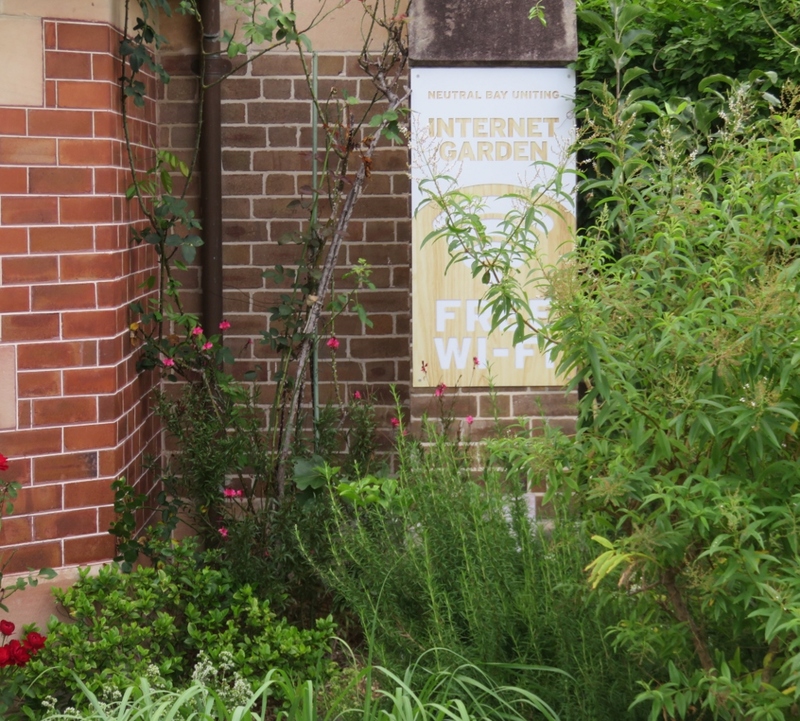 The foyer has a lovely bookshop on the left, and a cosy popular cafe called Bookplate on the right. Each of these has the stunning multicoloured stained glass Leonard French windows. 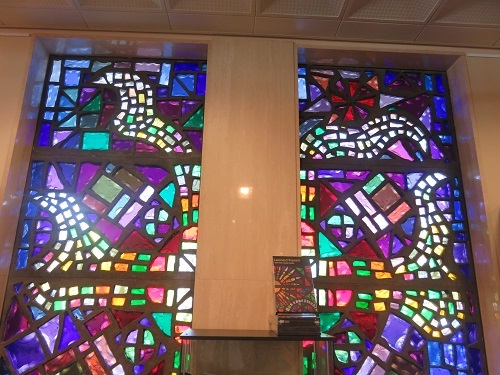 Although we arrived early, it is late summer, and the sun is streaming through the building and across the stained glass windows. 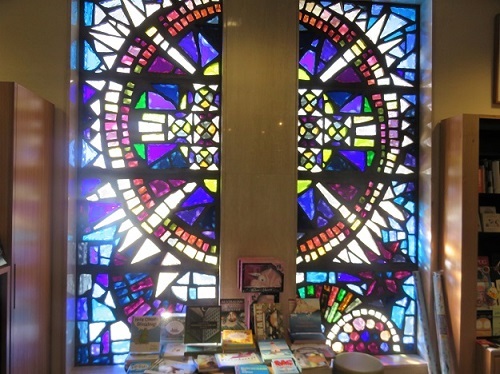 Lovely to look at, but hard to photograph..
Our family, over many years, have enjoyed the National Library’s many tours, exhibitions, book launches, discussions. My daughter reminded me that she and friends studied here while at University. 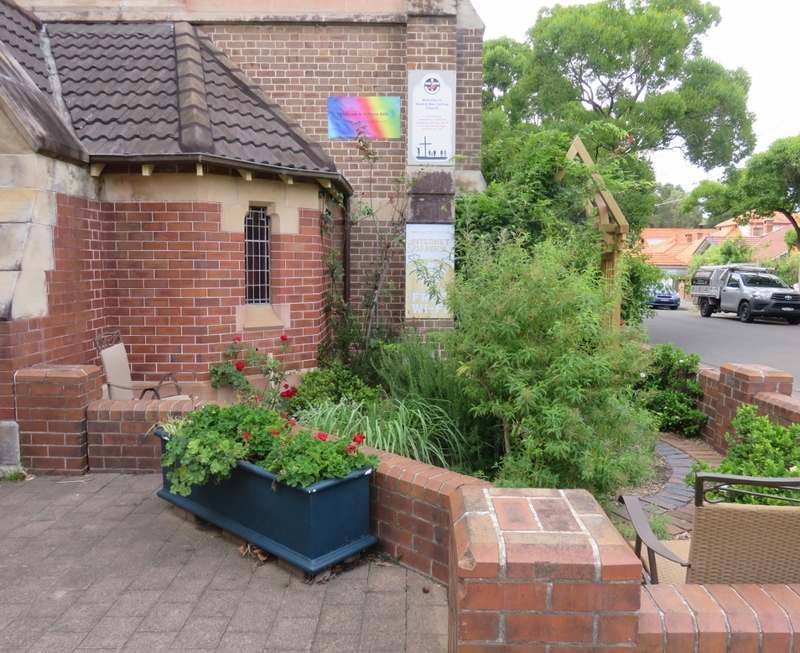 Paul is a regular visitor here while doing his PhD, and we often meet friends and family there for coffee/lunch and walks. Getting ready for a walk around the lake before coffee! 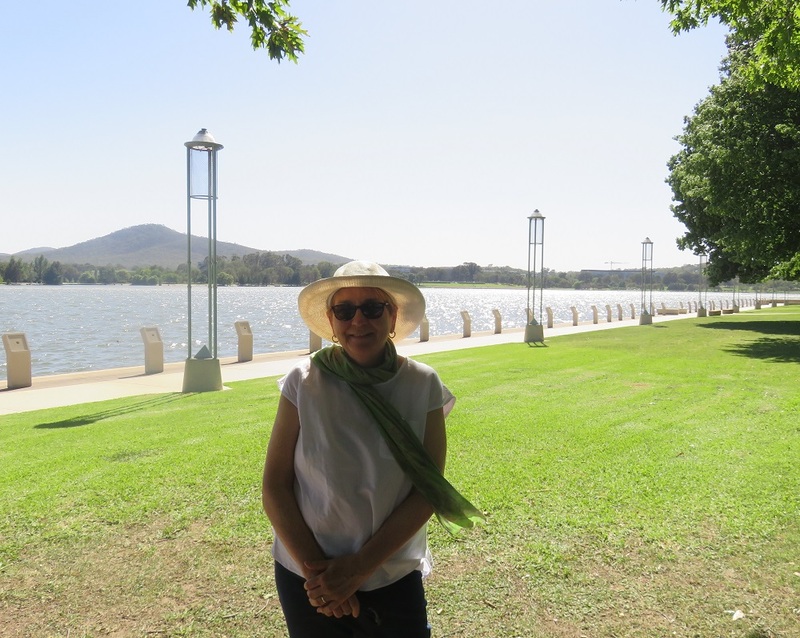 No wonder the writer Marian Halligan said she could never leave Canberra because she could never leave the National Library! 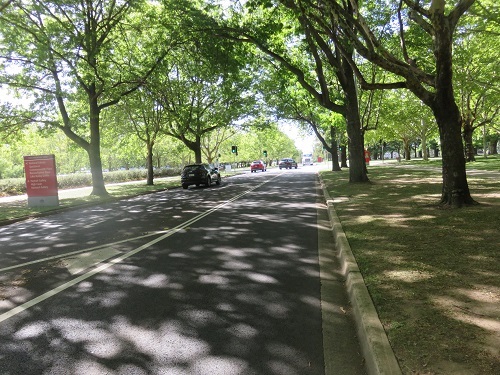 Not far from the National Library along the water’s edge, is a long row of mature Manchurian Pears, a master stroke of landscape planning. 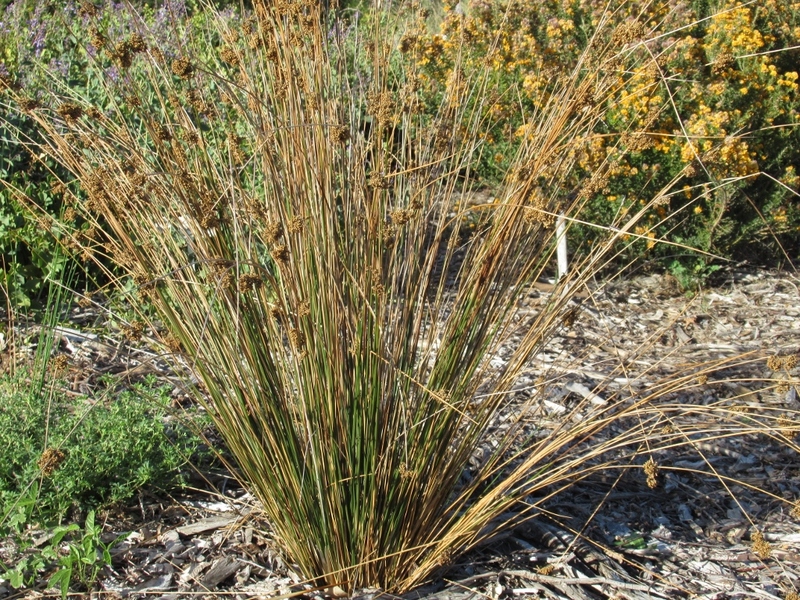 They provide shade in summer, colour in autumn and spring, and beauty all year round. 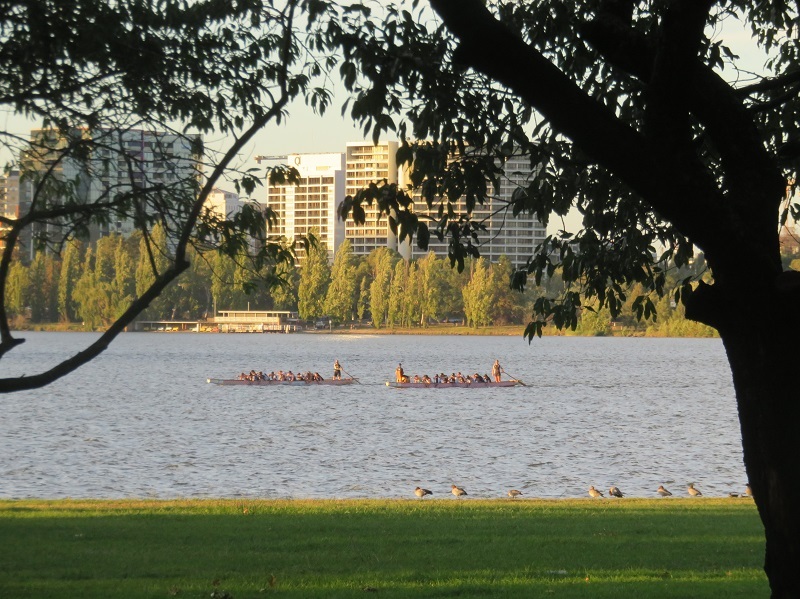 For many Canberrans these trees mark the changing of seasons every year..
Instagrammers love this part of the lake.. 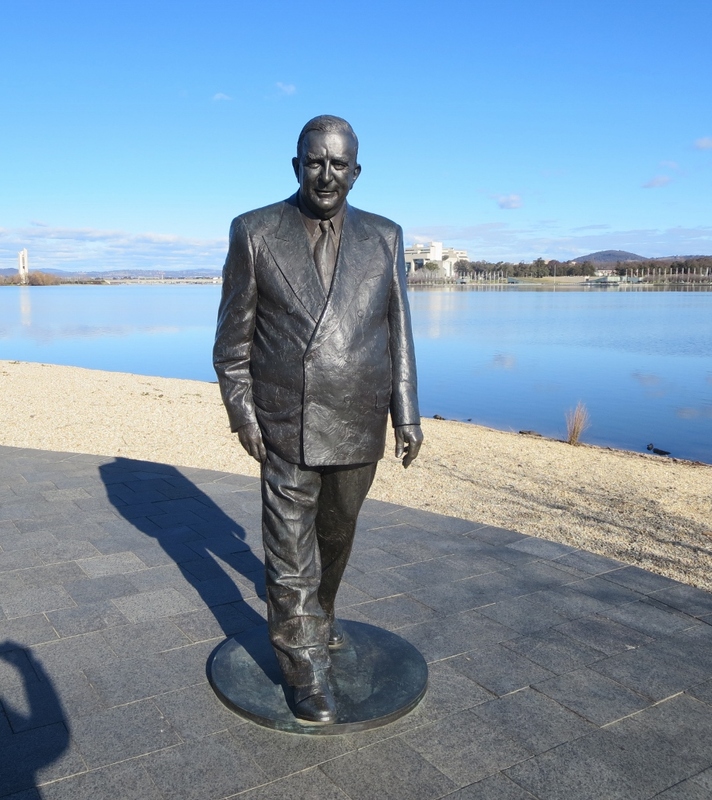 Many thanks to the former Prime Minister Robert Menzies, to the architects, and to Harold White, and most of all to Walter Burley Griffin and his wife Marion, without whom Canberra would not be the garden city we have today. 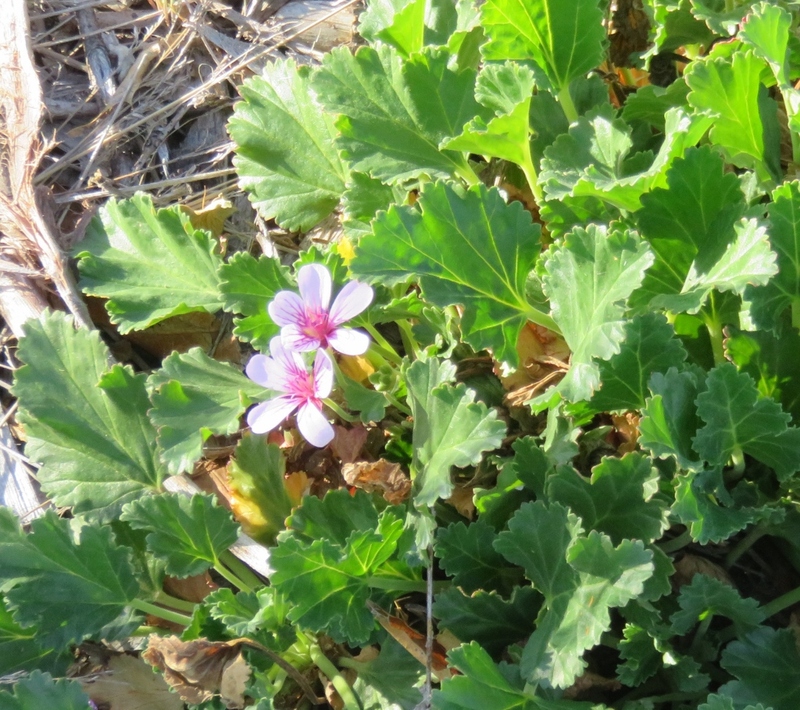 Hope springs eternal that communal land will remain for everyone. 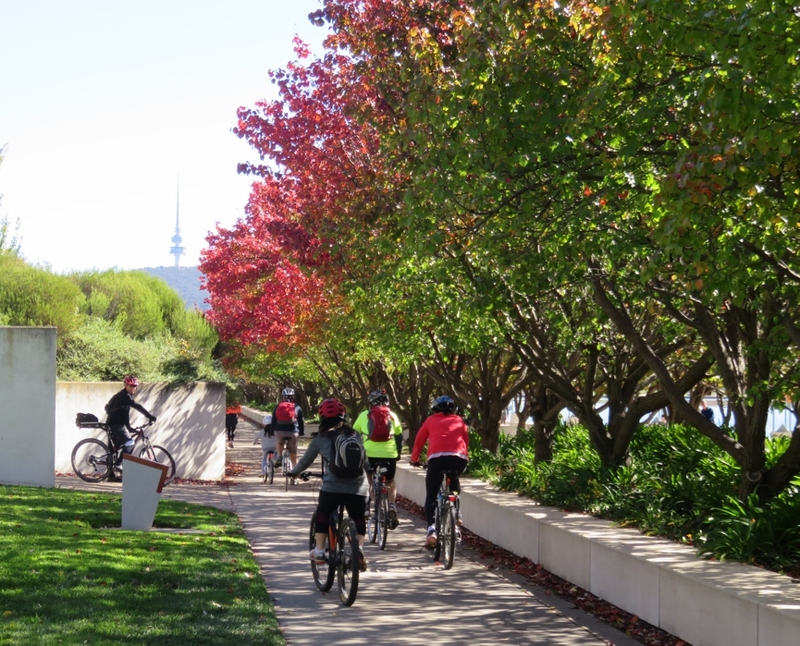 Thanks for visiting Canberra’s Green Spaces, and we hope to have many more (slow) drives around Canberra this year. 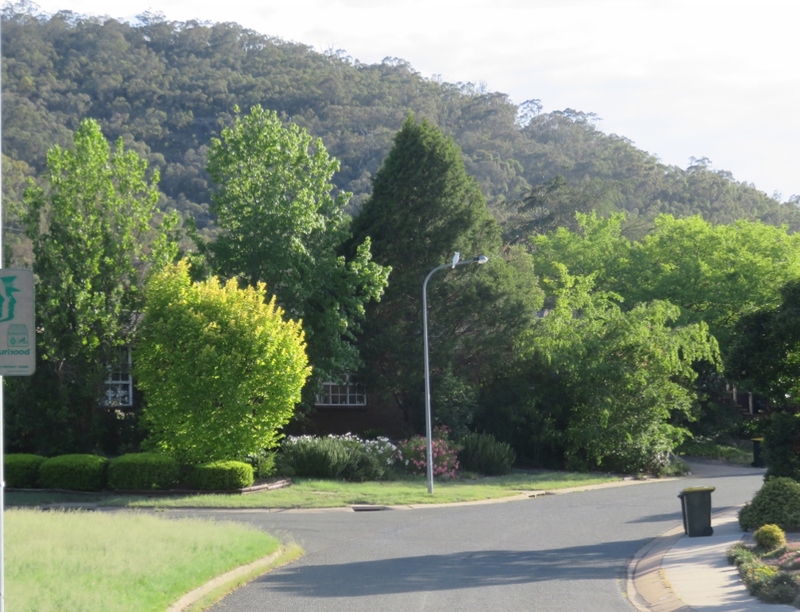 This entry was posted in Canberra's Public Gardens and tagged Canberra, city bush capital, Harold White, Lake Burley Griffin, Marion Halligan, Marion Mahony, National Library of Australia, Noel Potter, Robert Menzies, Walter Bunning, Walter Burley Griffin on February 17, 2019 by germac4. 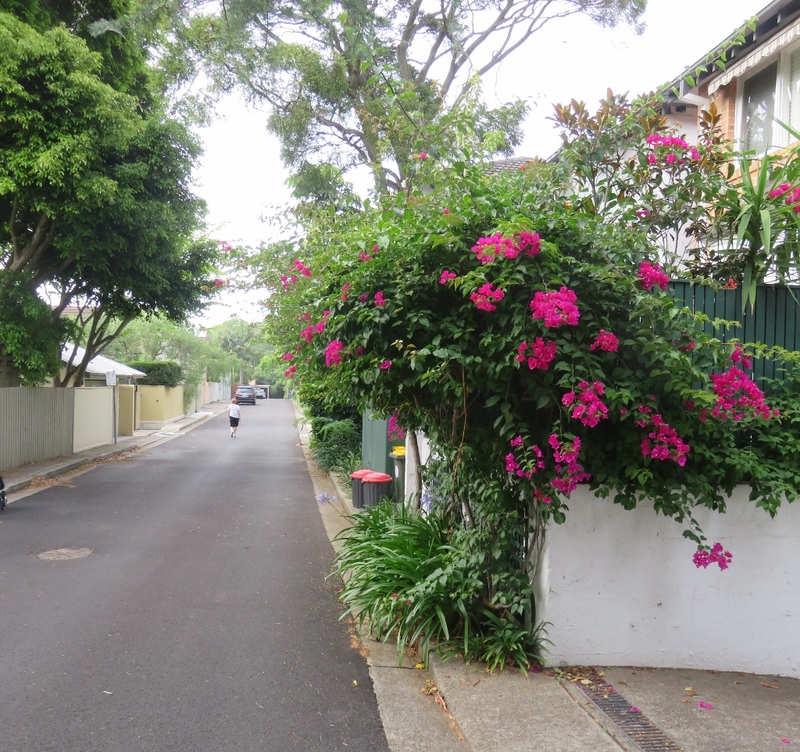 This garden is on the verge of the road and the footpath. 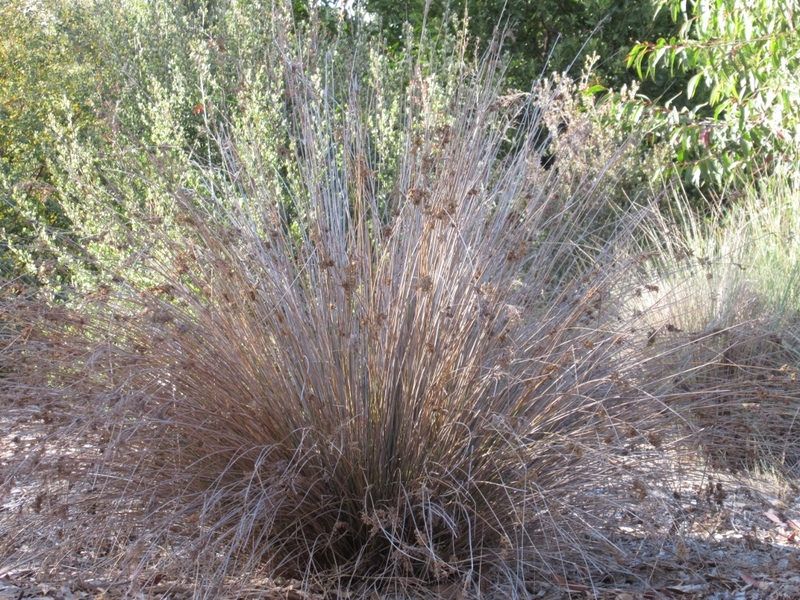 It has been planted and cared for by a very generous gardener who lives in a house nearby. 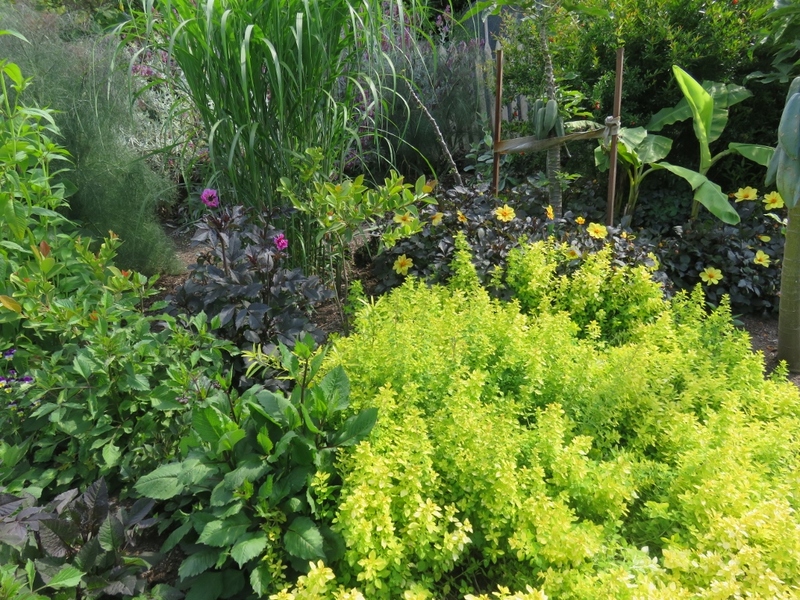 He and his wife bought and prepared the soil, fertilizer, and plants. 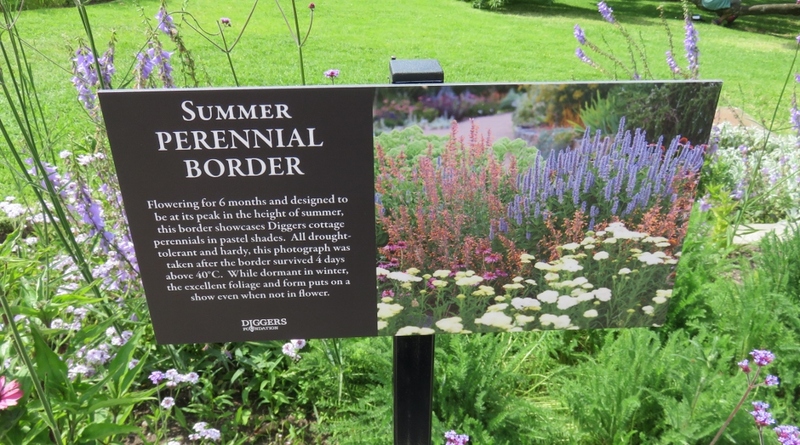 They have even installed a watering system, and keep it watered all summer at their own cost. 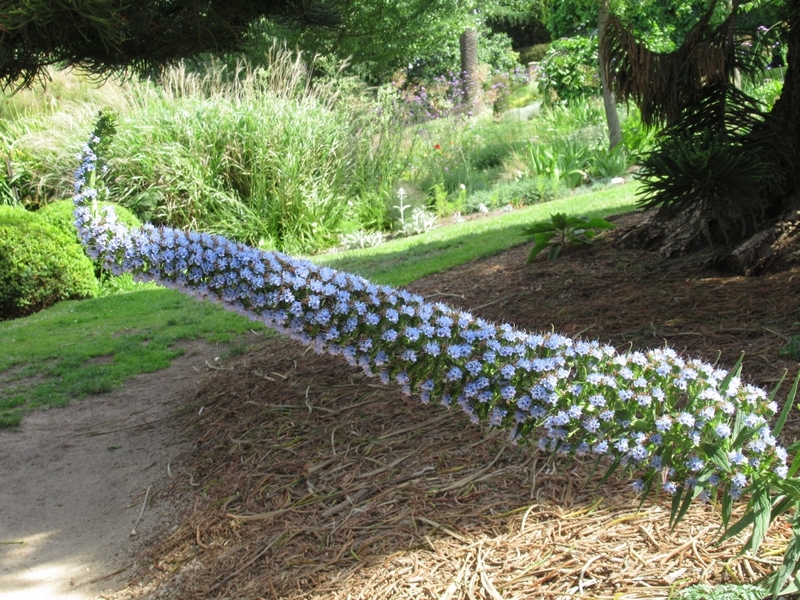 How is that for a gardener’s generosity of spirit! 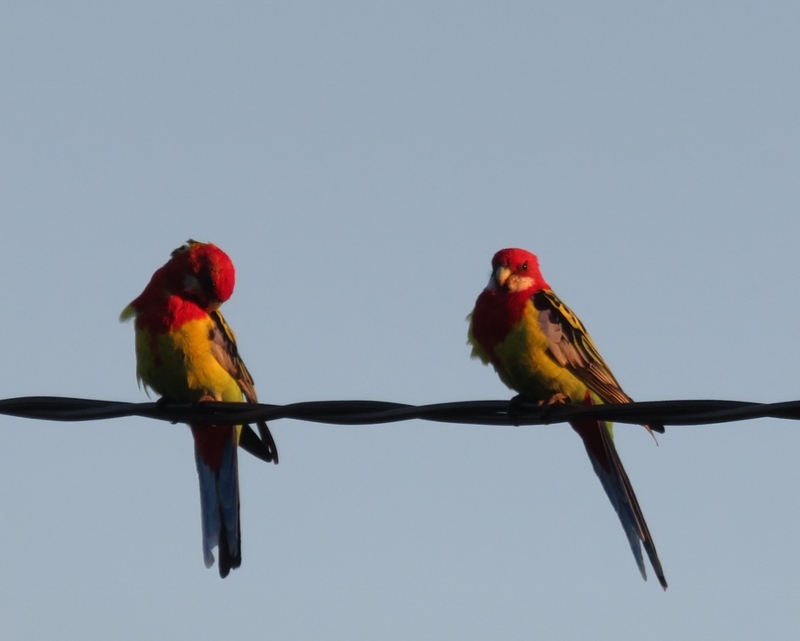 These colour co-ordinated Eastern Rosellas are up early and enjoying the morning sun. 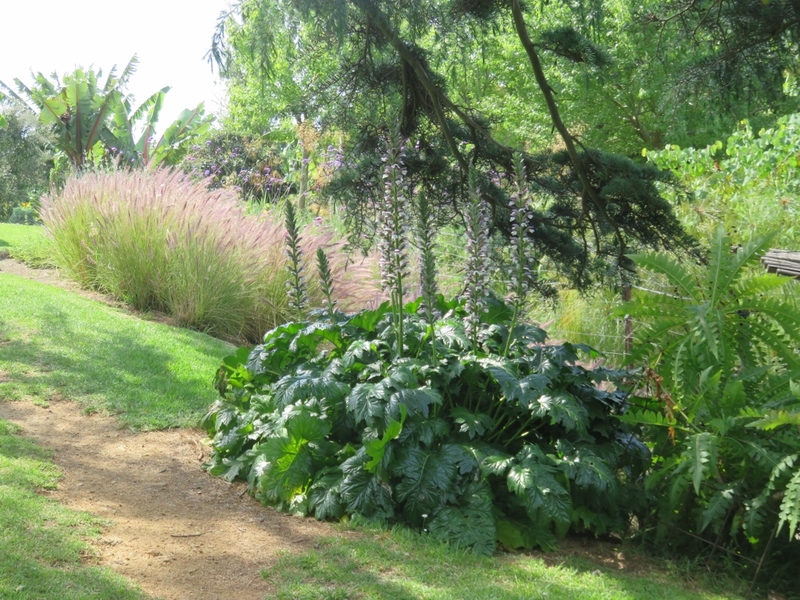 Further along the path is a neighbouring garden spilling over with a shrub that seems to be saying…”It’s beginning to look a lot like Christmas, and summer”. 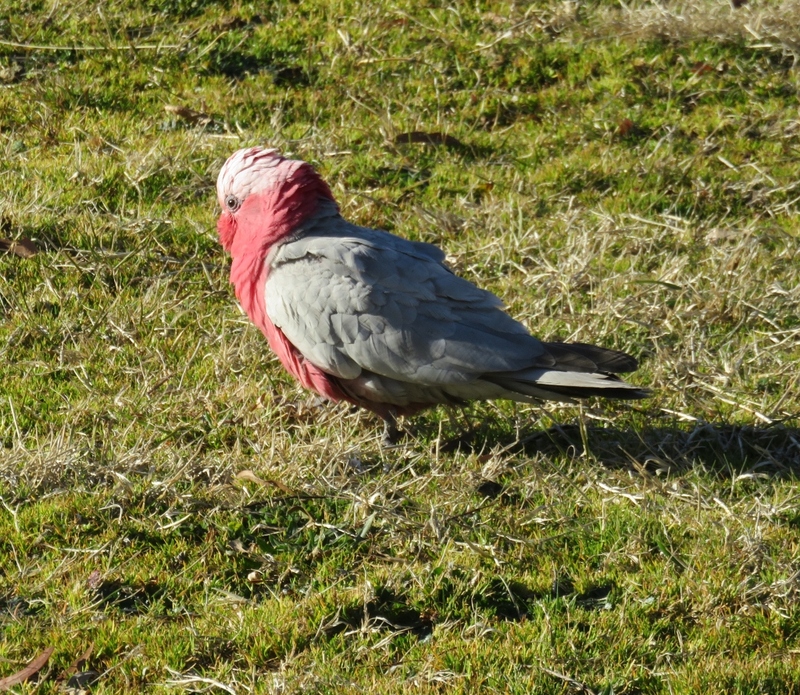 The galahs seem to understand the pecking order, and wait for their turn. Occasionally they all eat together. 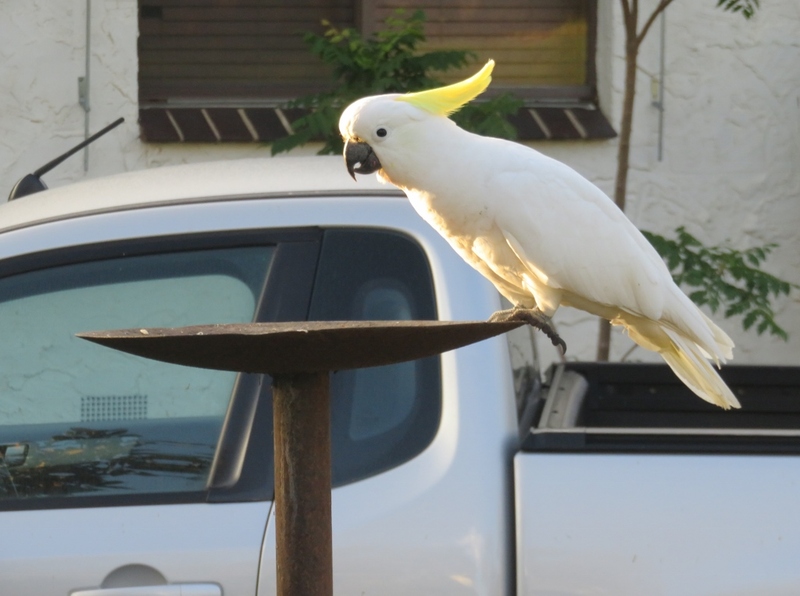 And far off on the lamp post, a female cockatoo is on parenting duty…. 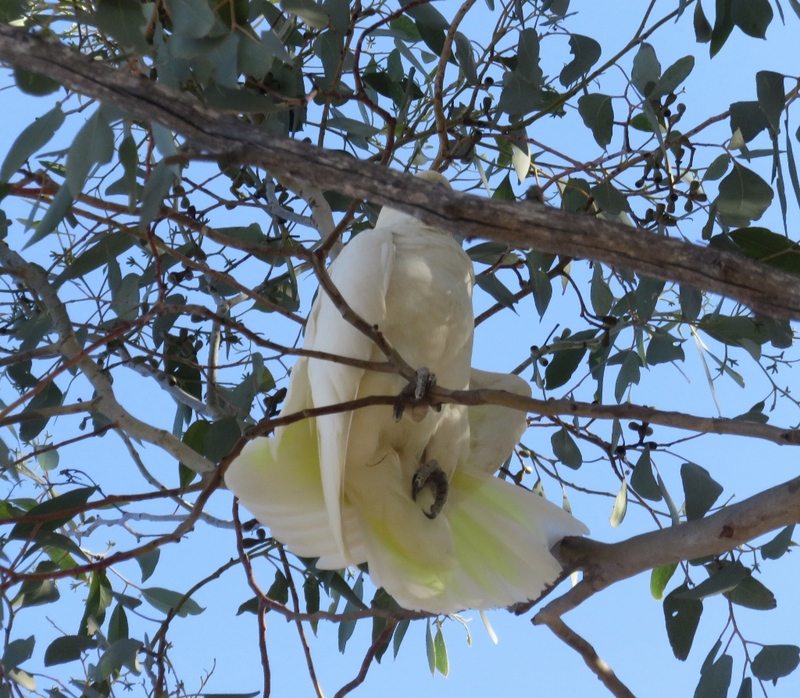 Nearby, a young cockatoo is holding on tight to the branch …. perhaps his first flight without his mother..
Oh dear, he had a slip, but luckily his beak is strong enough to steady him. His tail feathers look like a wedding dress! 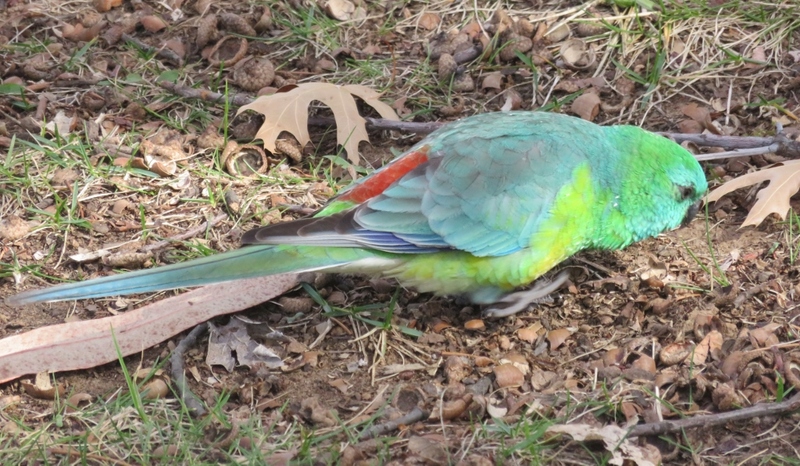 As we walk across the playing fields, we often see the male Red Rumped Parrot and the lighter coloured female….these parrots are always feeding in the grass, and are totally unperturbed by sporting events going on around them. 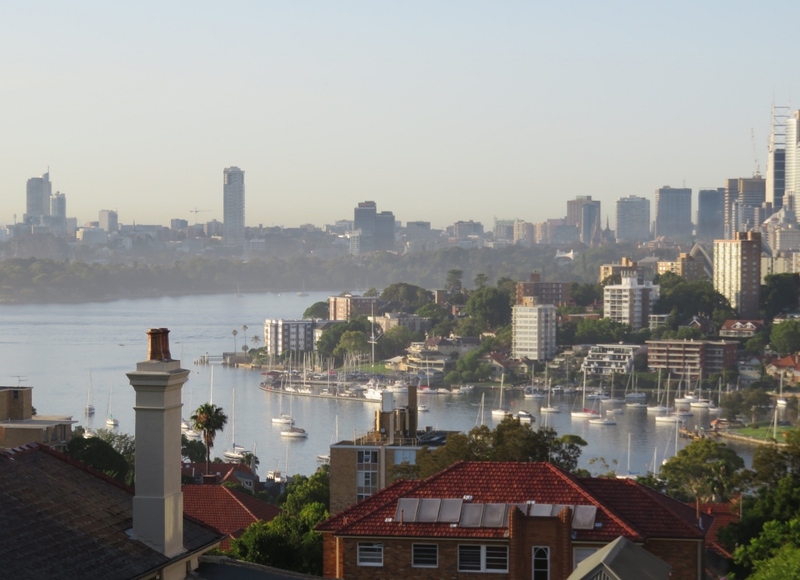 This summer we have had a heatwave and dust storms .. 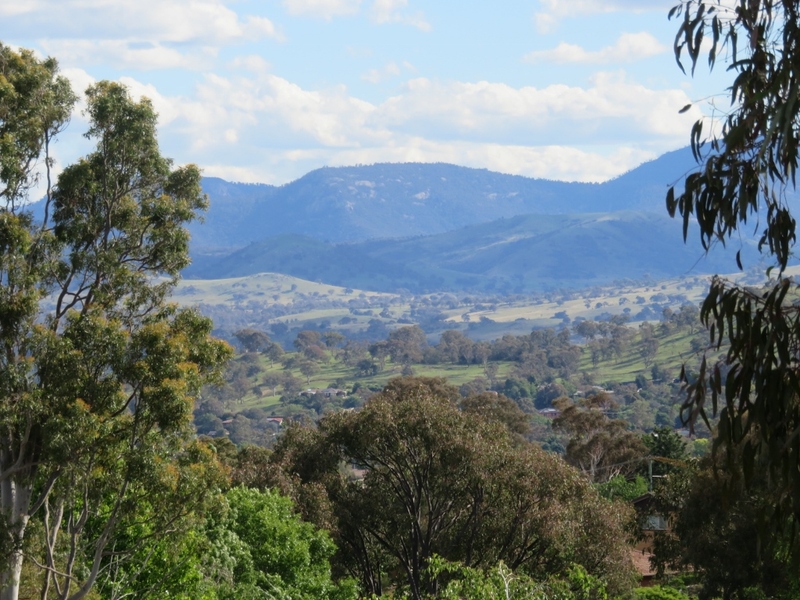 When I look across at this view of the Brindabella Mountains, I think there really is no place like home.. 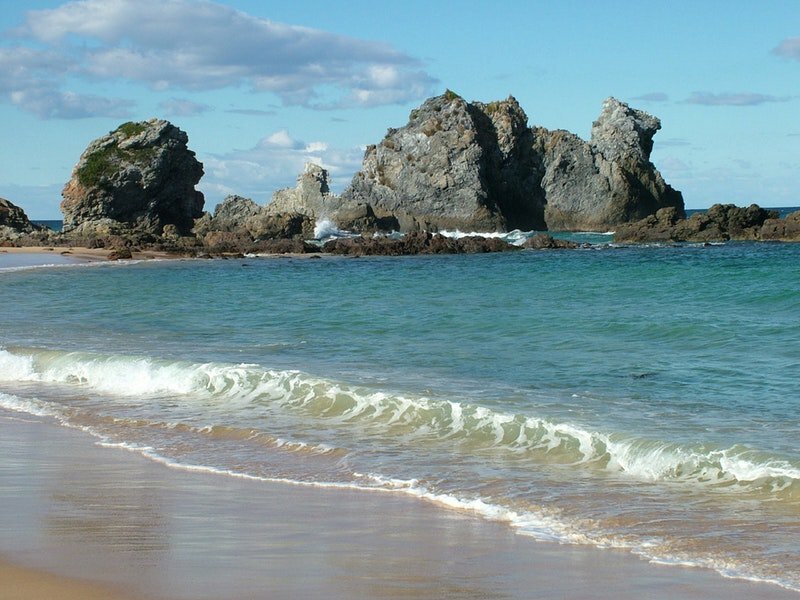 I hope you are keeping warm or cool where ever you are in the world, and enjoying your home as much as I enjoy mine. Copyright: Geraldine Mackey: All Rights Reserved. 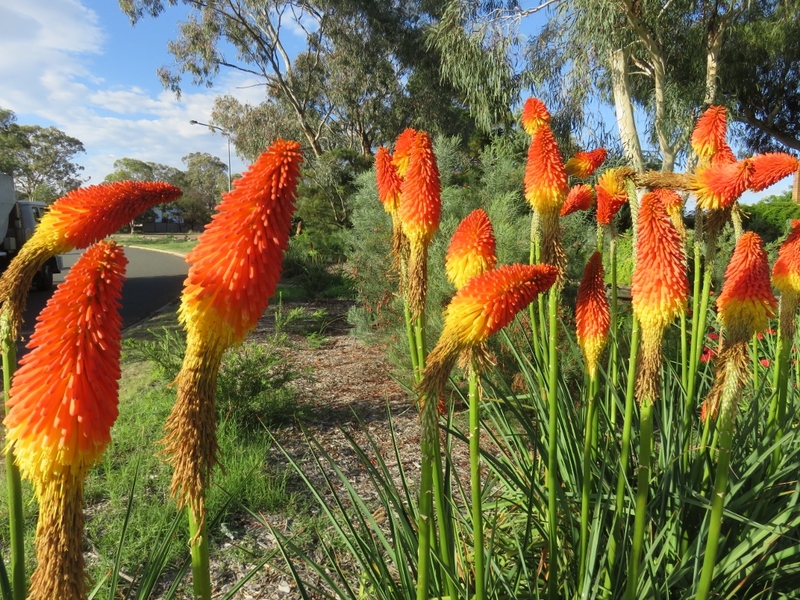 This entry was posted in Canberra's Suburban Gardens, Wildlife in the suburbs and tagged Acca sellowiana, Canberra, cockatoos, Feijoa, Red Hot Pokers, summer, sunsets on January 8, 2019 by germac4. 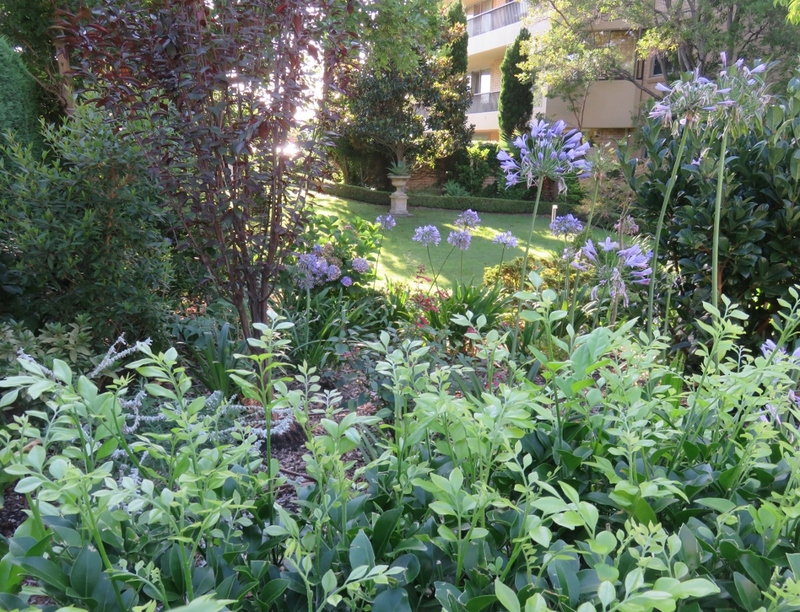 In the summer time, most Canberrans living in the suburbs, wake up to birdsong. Australia is well known for its big noisy birds, but in summer, the blackbird, tiny in comparison, has a melodious song that can be heard all through the garden, and beyond..
His sweet song, is only heard when the bigger birds are not around. The blackbird usually sings in the morning and evening, but today he is singing right through the midday heat….. maybe he knows the summer holidays are on their way. 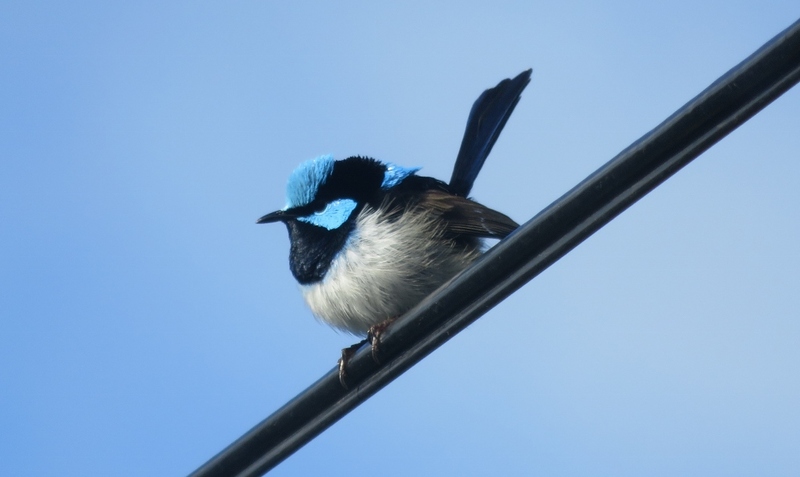 Another beautiful little bird takes advantage of big bird free days in the garden…the male Fairy Wren. 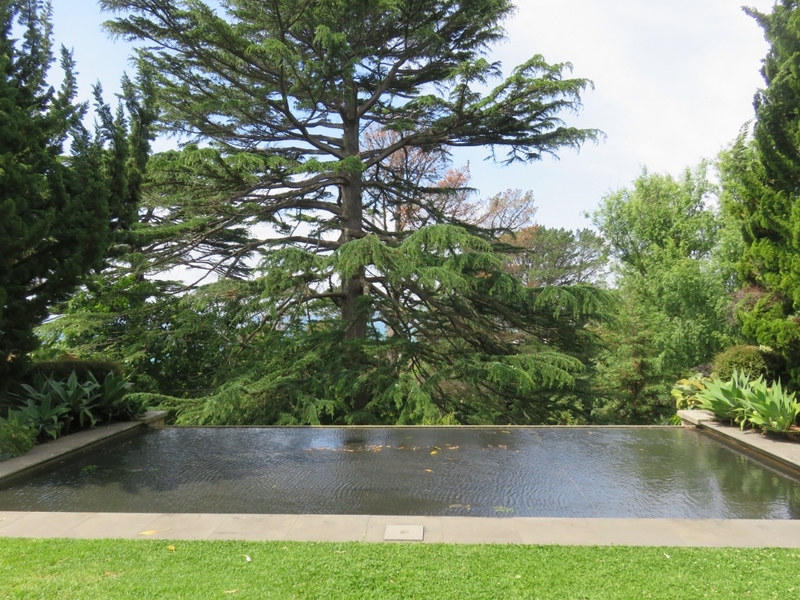 He and his family fly around the garden, tweeting softly, ducking into their birdbath, and hopping from bush to tree. 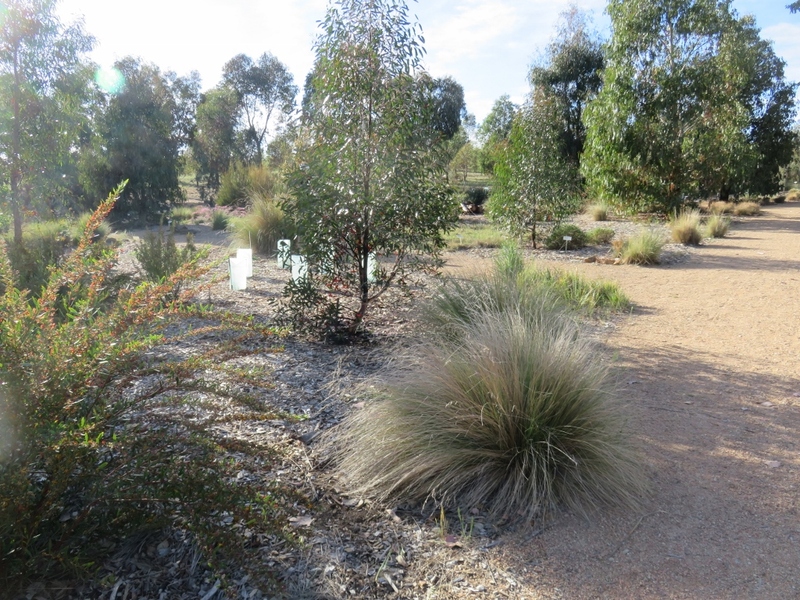 I have read that Fairy Wrens never move far from their original home, and our Fairy Wren family have been a welcome sight every year in a leafy part of the back garden. 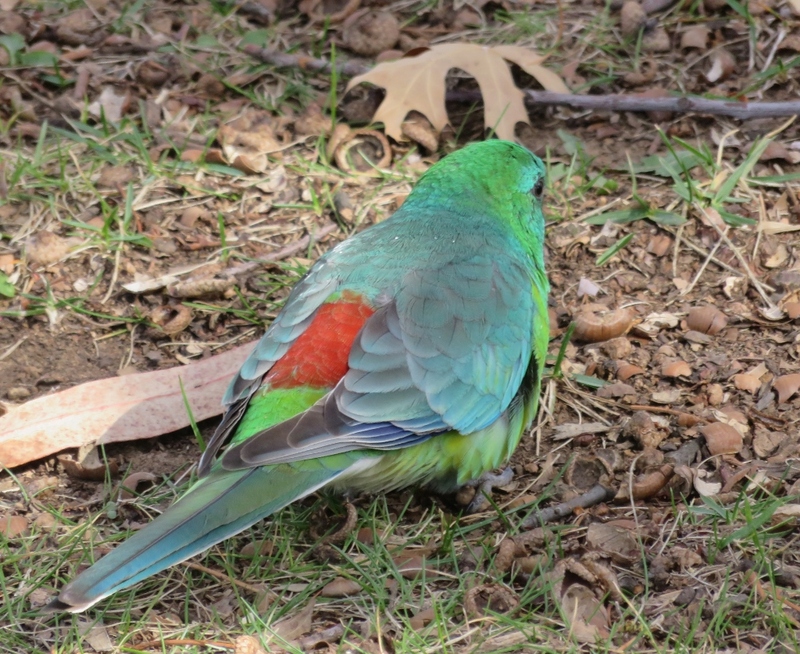 The striking Crimson Rosellas are part of the Australian parrot families. They are quite nervous and shy, and fly away easily. 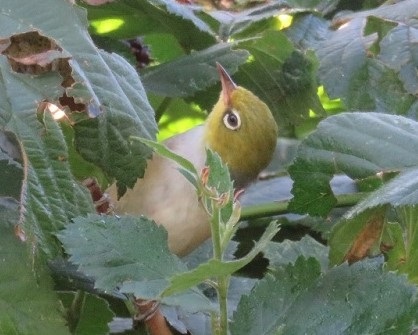 However, when they are in the plum tree near our deck they make gentle twittering sounds to each other…and seem very sociable. I have used this cute baby Magpie photo in one or two of my previous posts, but he deserves his publicity. 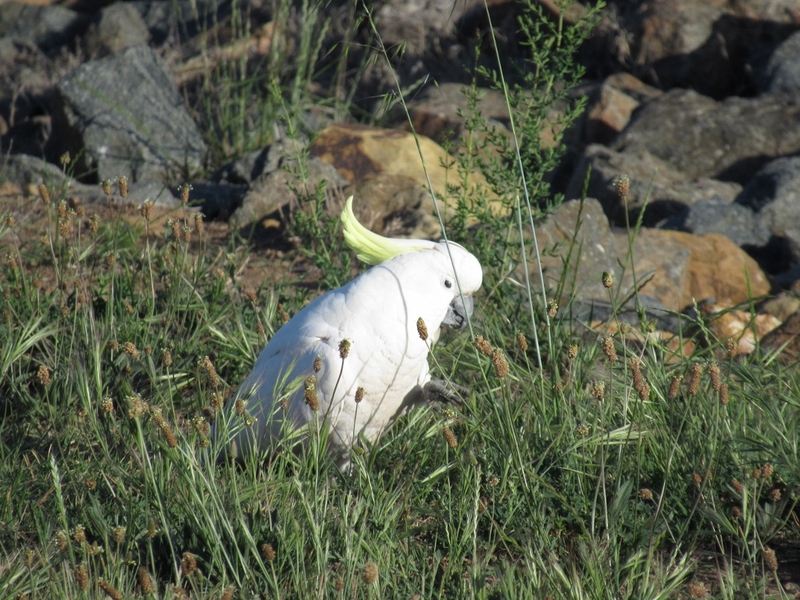 He was warbling away oblivious of crowds of tourists and media in one of the courtyards of Parliament House. He may be warbling to try and chase the crowds away, but magpies generally look on people as friends, so he could be warbling out of the sheer joy of living. 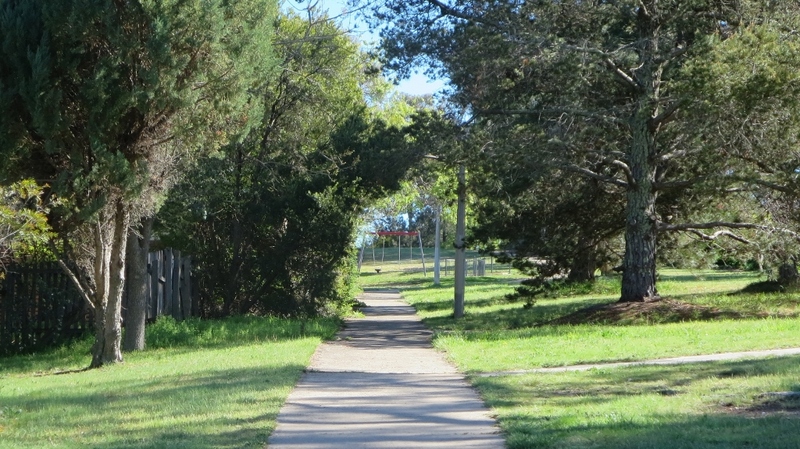 Magpies have a very melodious song, and it is perhaps the most well-known Australia bird call, except for the Kookaburra with his more raucous cackle. 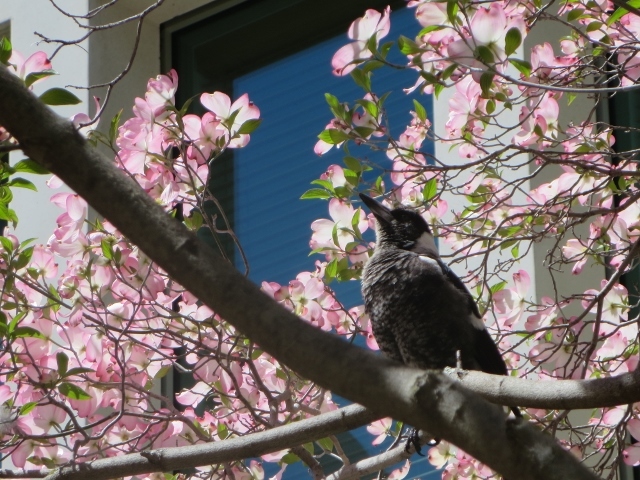 Magpies also make a lower warbling sound. This seems to be more like talking. Magpies warbling at each other about who is going to get the rapidly melting strawberry ice-cream. 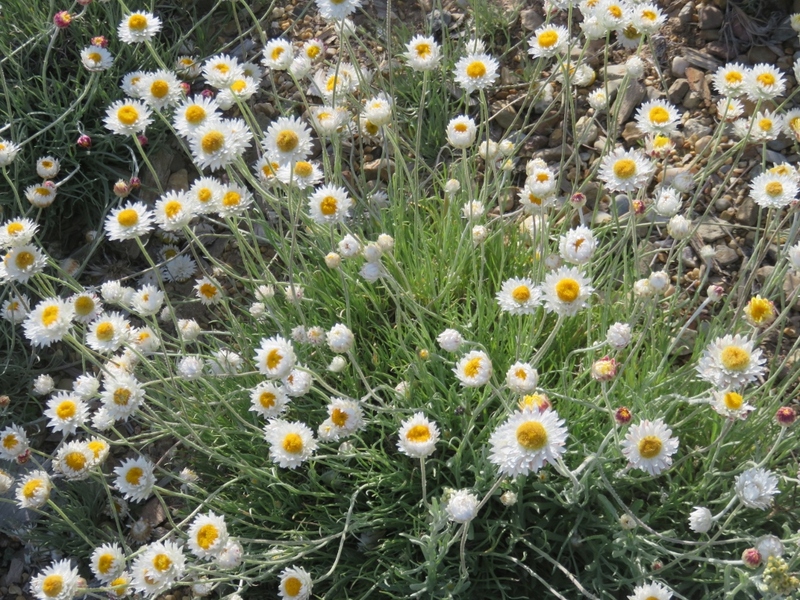 …..lovely really, but a bit later would also be fine. Galahs, like some of the other parrots in Australia, make tweeting noises to each other, and remain in groups where ever possible. Crested pigeons, enjoying the sun together, not a care in the world..
Crested Pigeons are one of the most common birds in Canberra. 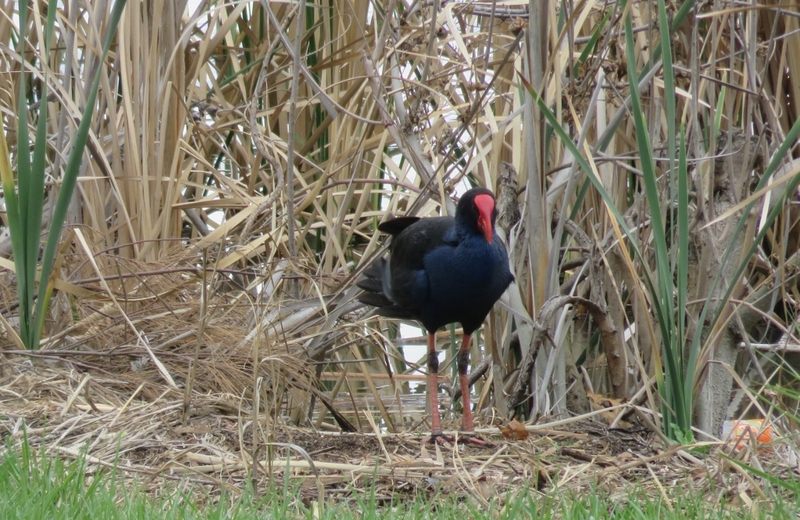 I have included them despite their lack of a distinctive song, although they do coo away happily when they are nesting. 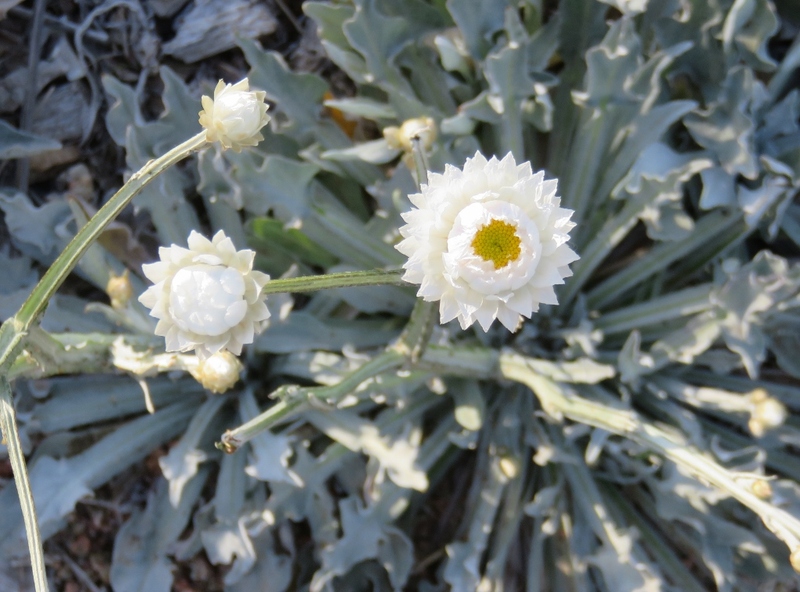 They live happily in any garden, and have absolutely no common sense, or sense of danger. When they do get scared off, their wings make a kind of whistling sound as they fly away. …remind me again of why I can’t get through the window? 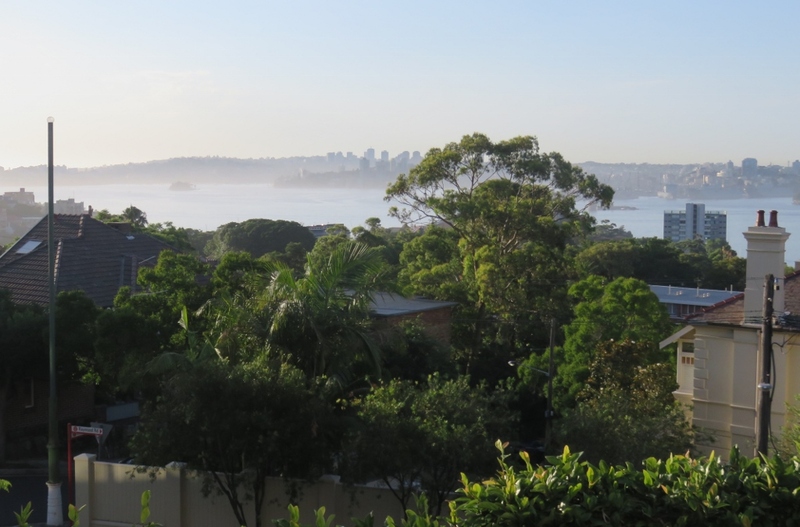 I thought of writing this post today, as I walked down our leafy paths to meet some friends for coffee. 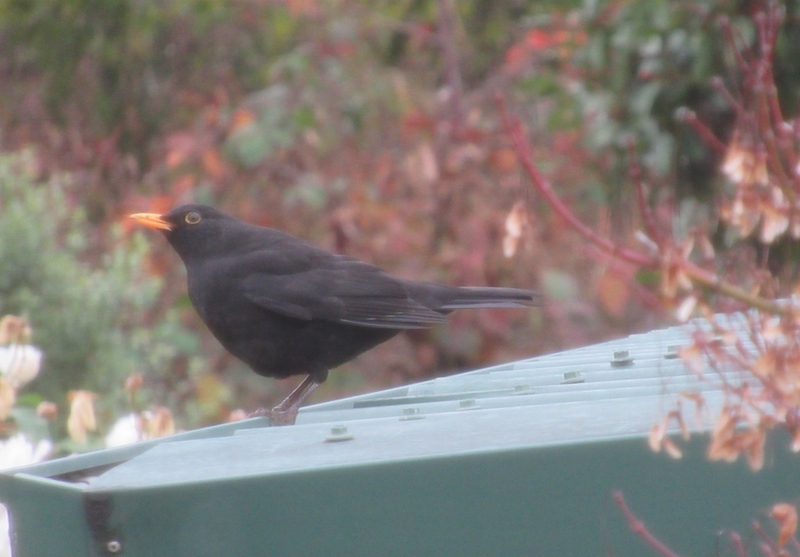 The wonderful blackbird’s song followed me all the way down to the café. 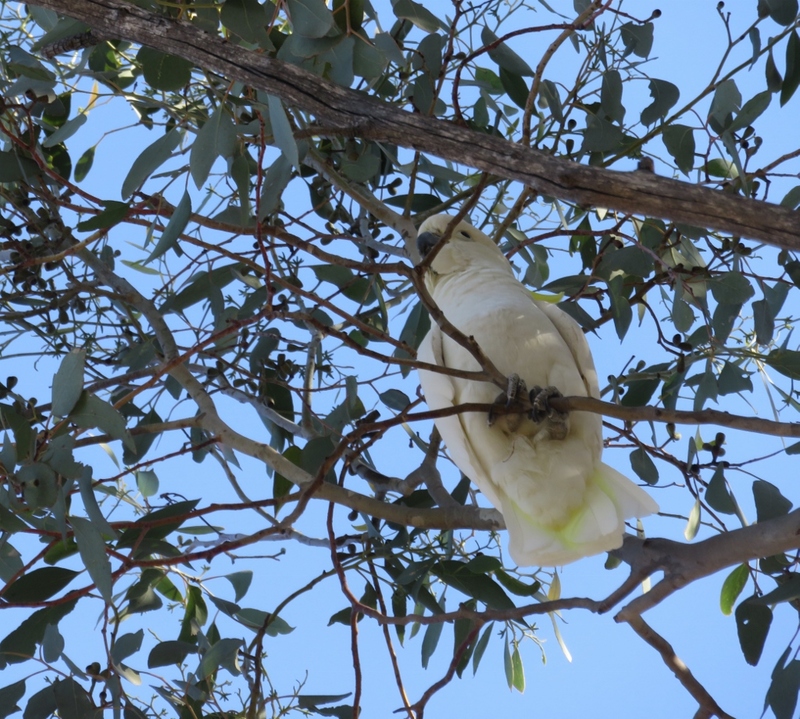 It was also a reminder that in a city with some big personalities, like the Cockatoos and the Currawongs, it is easy to over look the smaller birds. Do you have a favourite bird, or bird song? Best wishes for Christmas and the New Year. 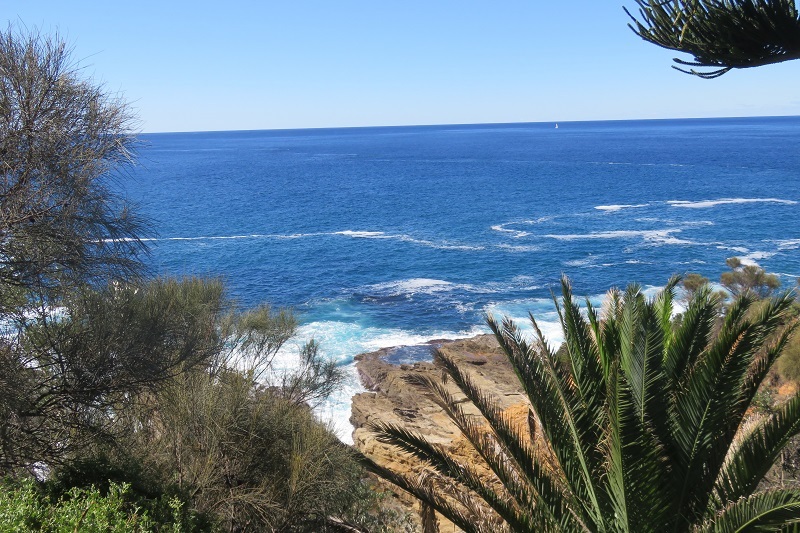 I’ve enjoyed another year of blogging, and being part of a blogging community. 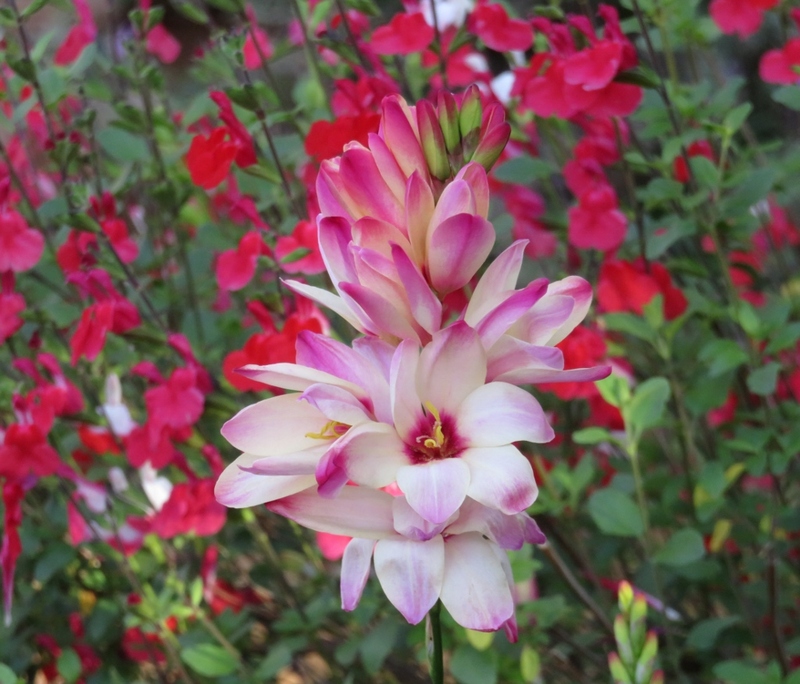 Many thanks to all those who read and comment , and to those who just like to drop in and read occasionally. All welcome and much appreciated. 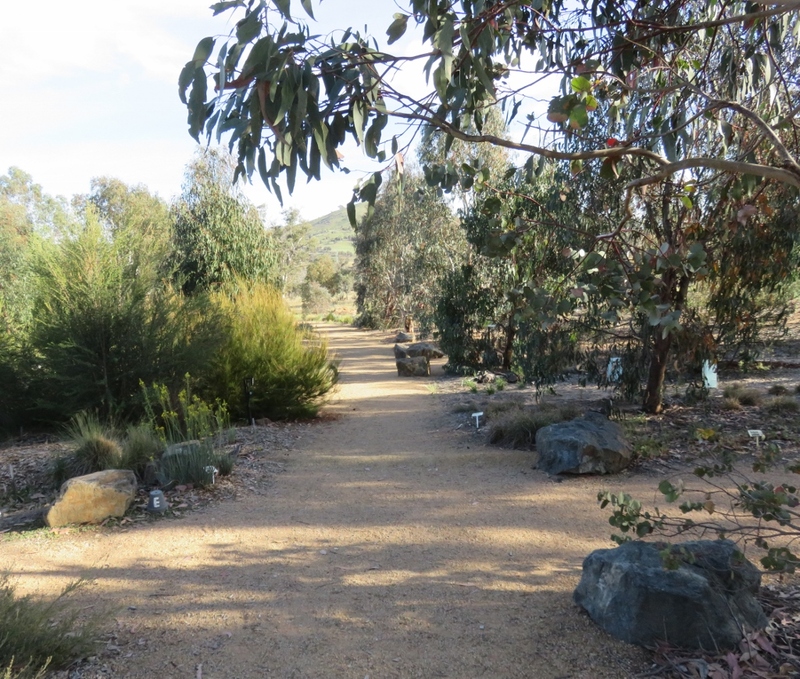 This entry was posted in Canberra's Public Gardens, Canberra's Suburban Gardens, Wildlife in the suburbs and tagged Australian birds, blackbirds, Canberra, Crested Pigeons, crimson rosellas, Fairy Wren, Galahs, Magpies, Parliamentary courtyards on December 22, 2018 by germac4. 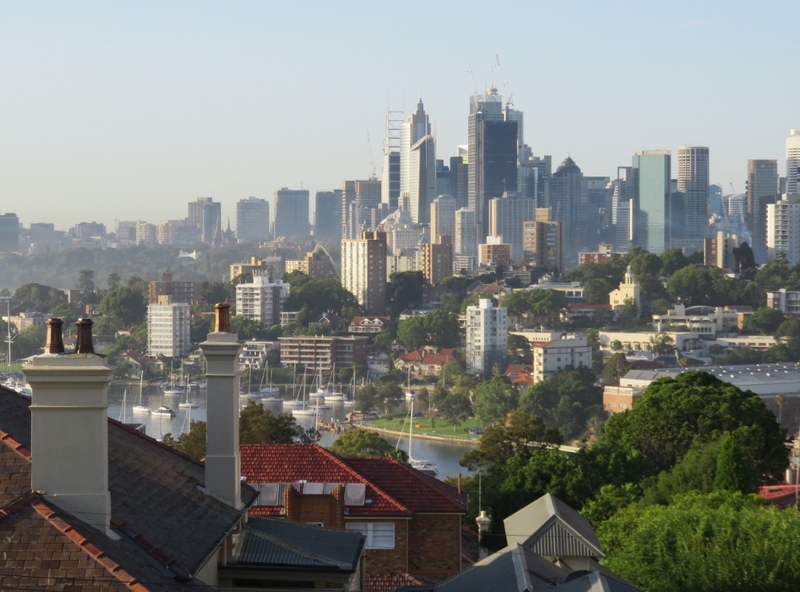 Since the birth of our granddaughter last year, we have frequently travelled to Melbourne to visit our daughter and family. 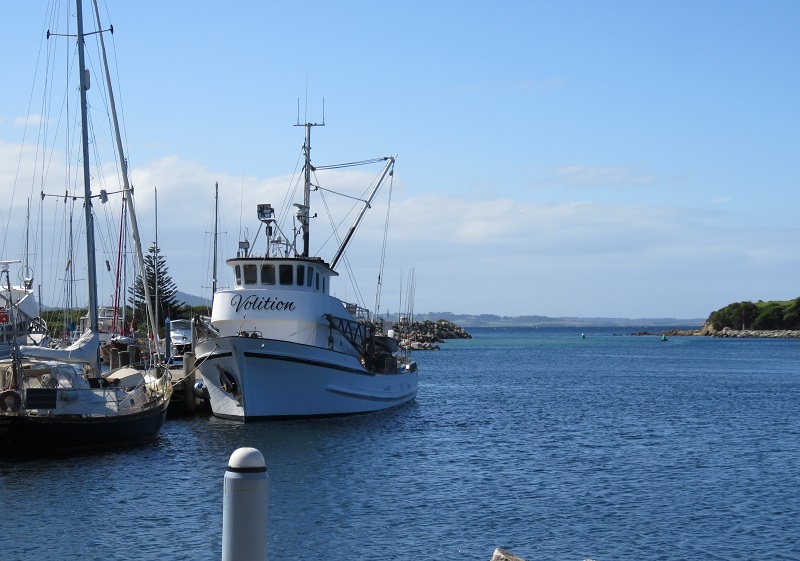 In late November, we took a slightly different route to Melbourne, and spent a few days in the beautiful Mornington Peninsula. 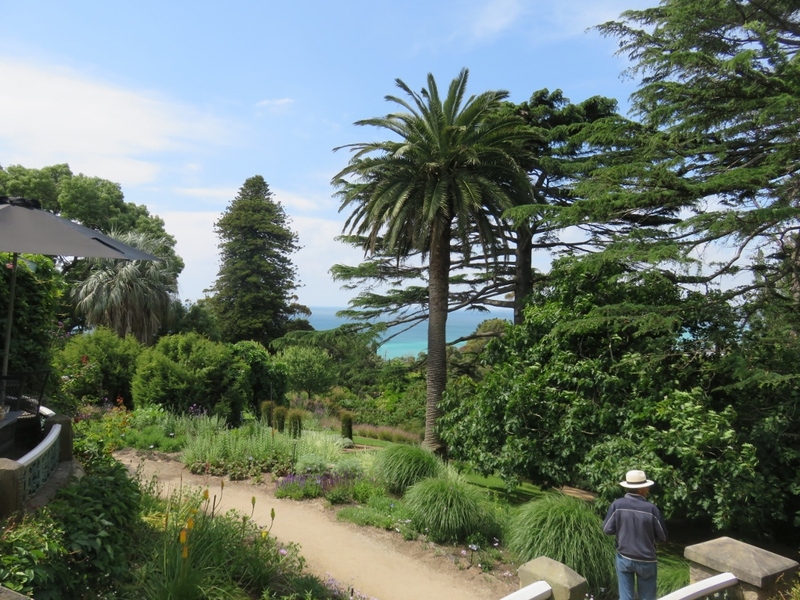 On a sunny, almost perfect day, we visited a wonderful property called Heronswood at Dromana. 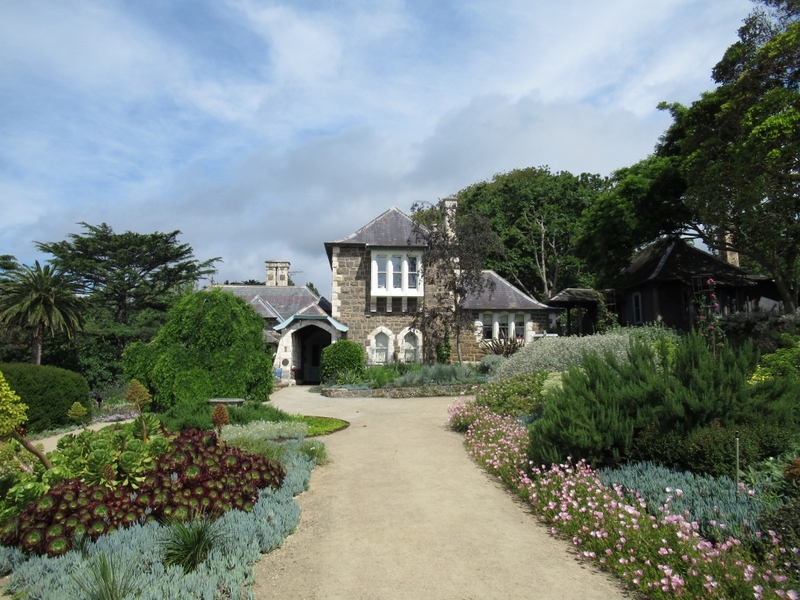 This historic property was established in 1864, and the Gothic Revival house was built in 1874. 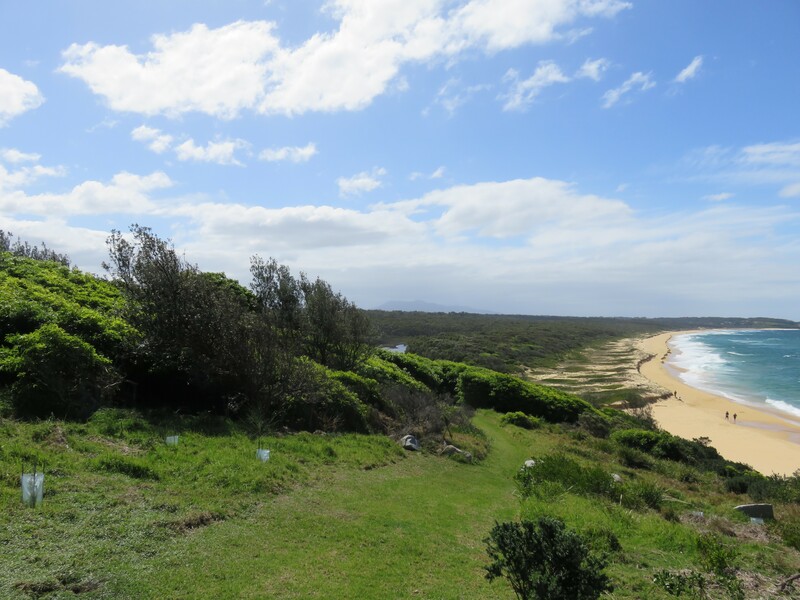 Dromana is a very scenic part of the world, but the wind and weather can be wild and unpredictable. 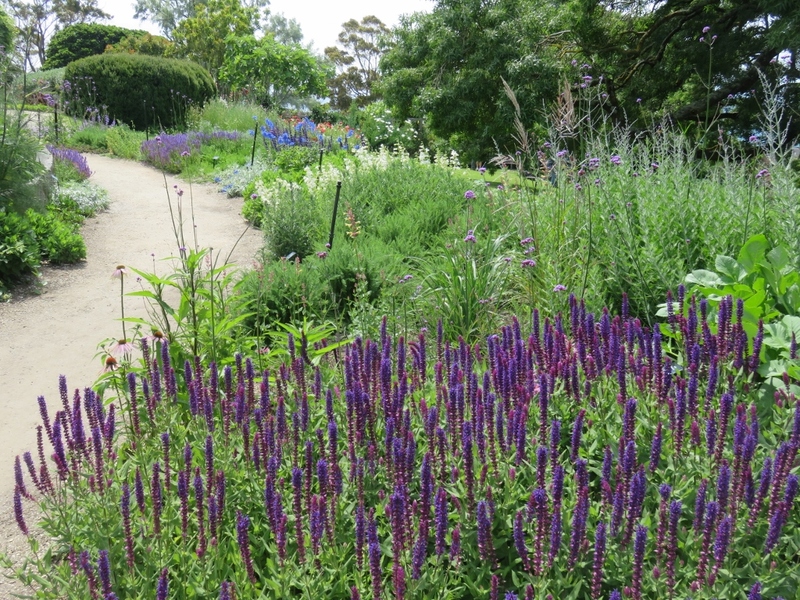 A tough climate to establish such a beautiful garden. 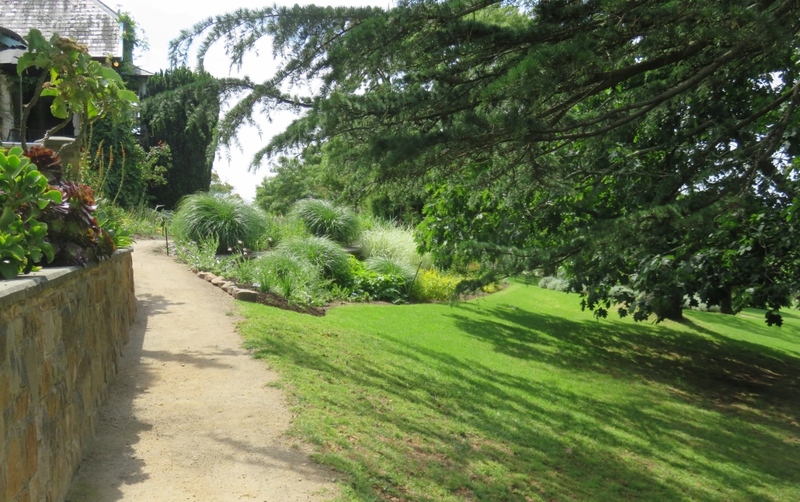 William Moat was originally employed to develop spacious lawns and gardens, and large trees were planted to serve as wind breaks. 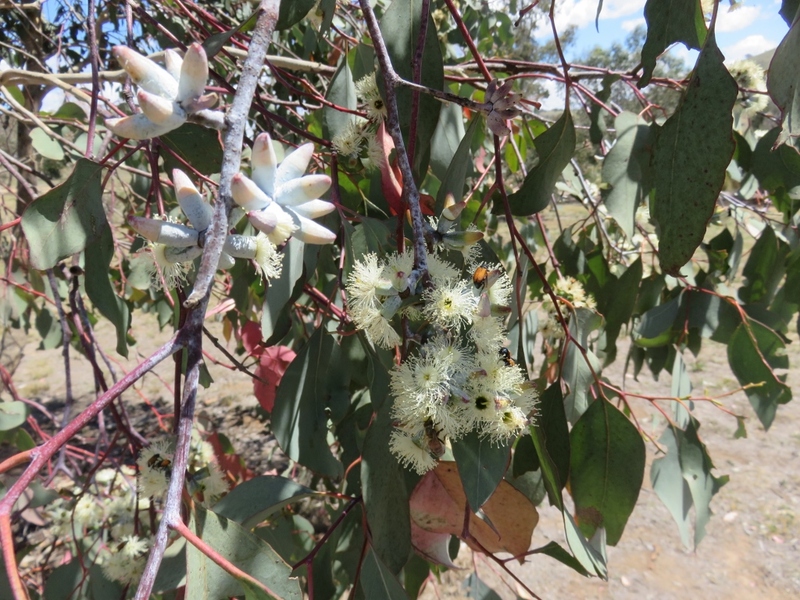 Some of these trees survive to protect the garden today. 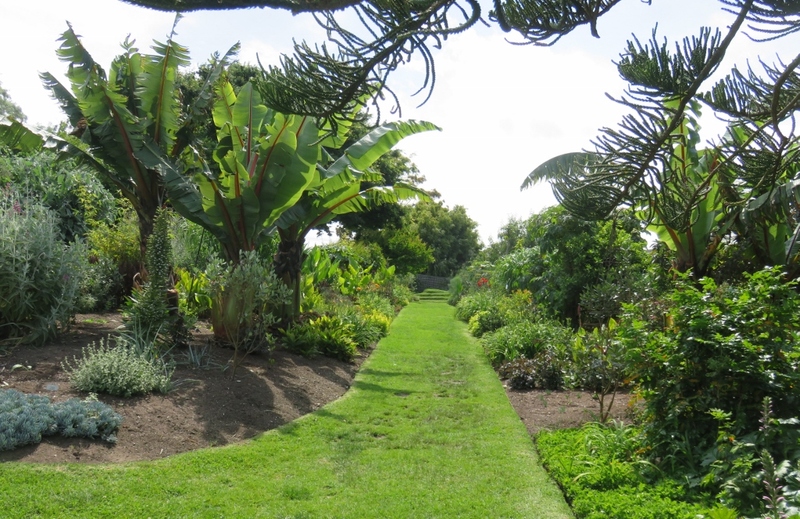 Clive and Penny Blazey bought Heronswood in 1983, raising a family there while using the garden as a testing ground for new plant species and dedicated to preserving heirloom varieties for the business they established called the Diggers Club. 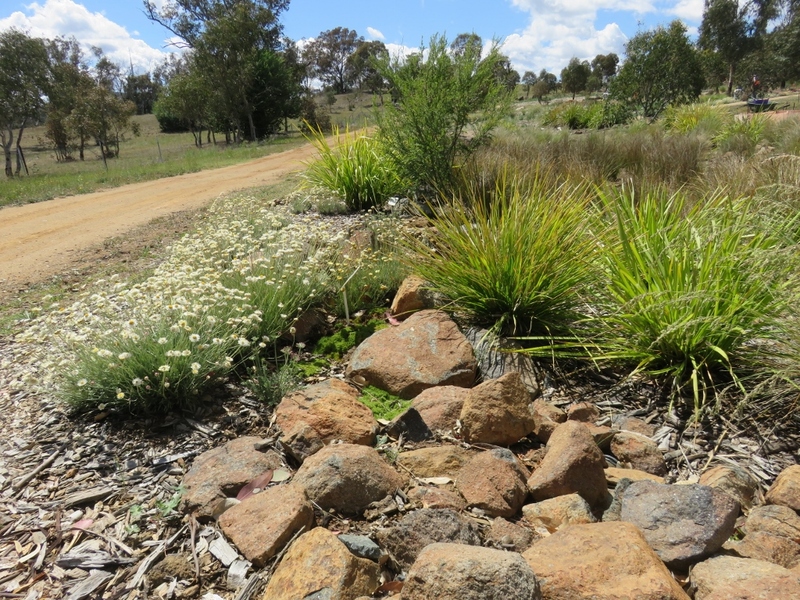 Like many gardeners all over Australia, Paul and I have benefited from being members of the Diggers Club, getting new seeds, plants and bulbs by mail order, and reading their excellent quarterly magazine. 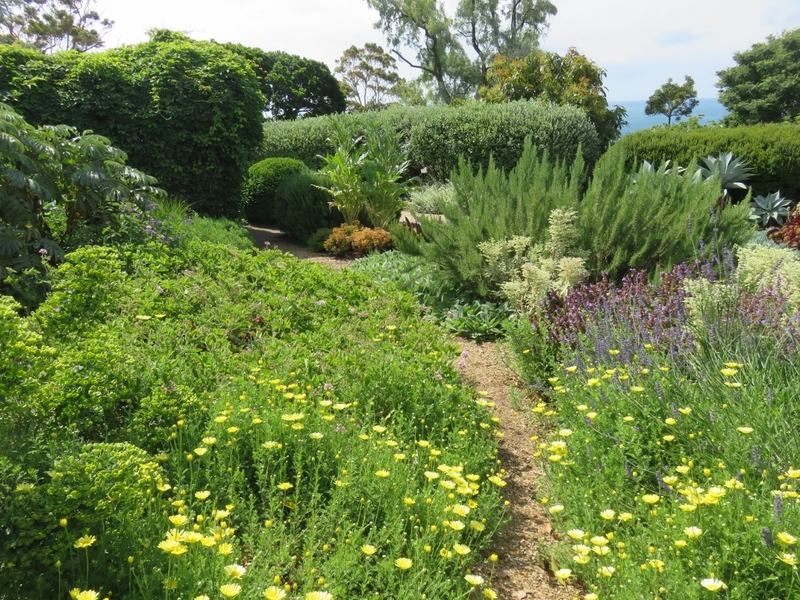 The garden is layered on a fairly steep slope, and is directly above the beach where the explorer, Captain Matthew Flinders, landed on 27th April 1802. 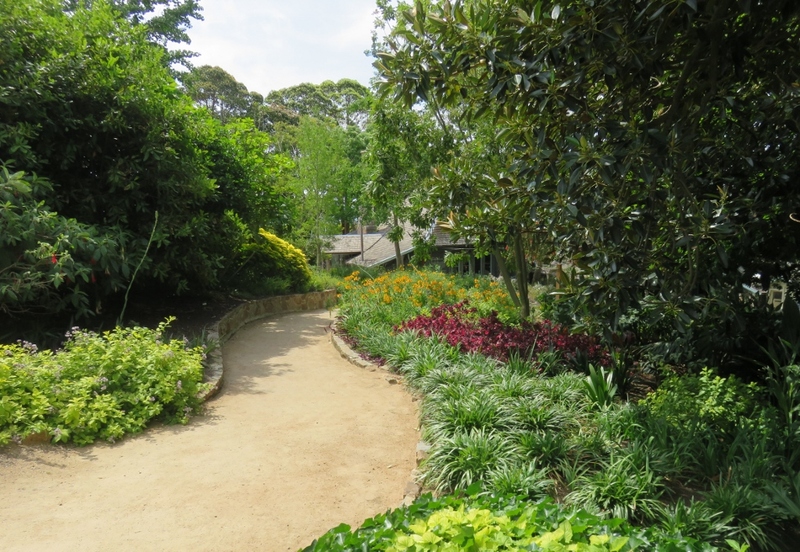 The garden path winds gently between each part of the garden, showcasing the planting over the years. 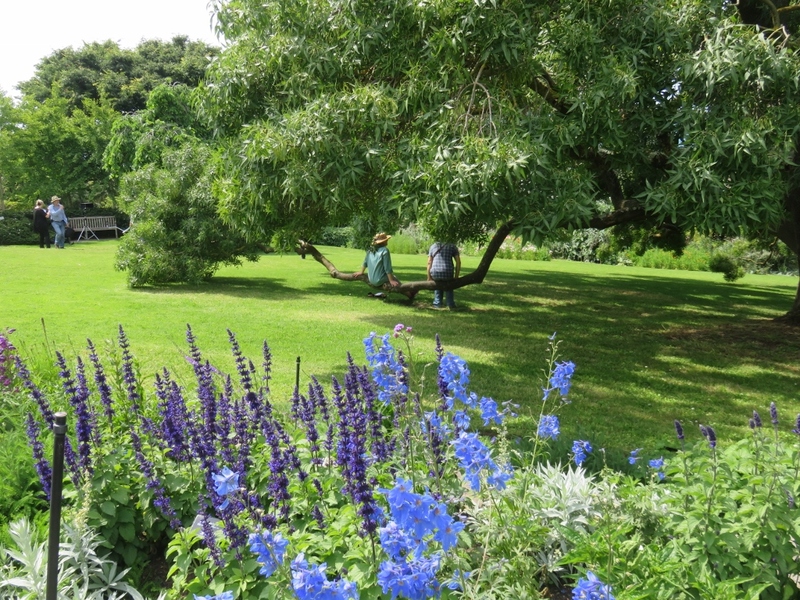 It has evolved into a summer garden of perennials and subtropical fruits, shaded by lush mature trees..
We had, quite by accident, chosen a day when the crew from the ABC series Gardening Australia were filming in the gardens. 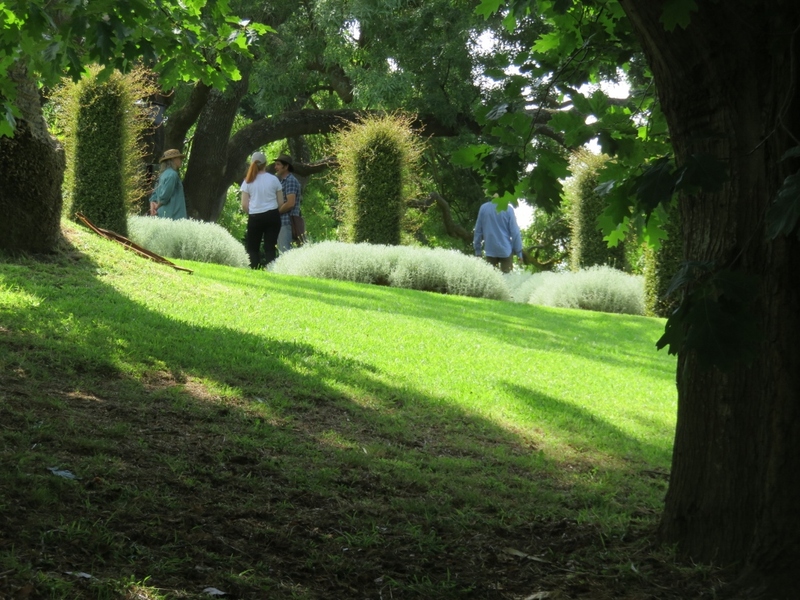 They all looked relaxed, friendly, and professional, and we chatted to Jane and complimented her on the program. 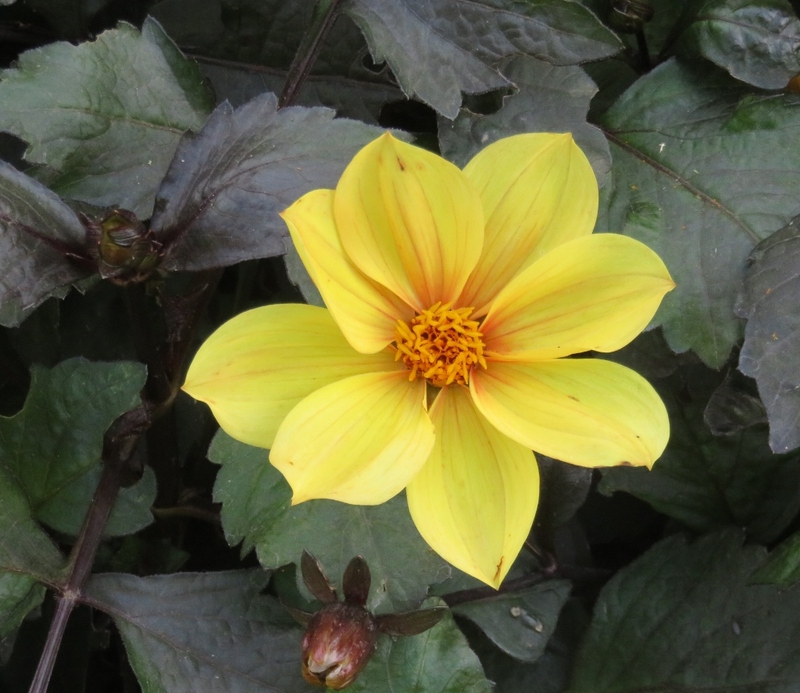 The Diggers best selections are combined with hot coloured (red, yellow and orange) dahlias, to contrast with the lush green foliage. 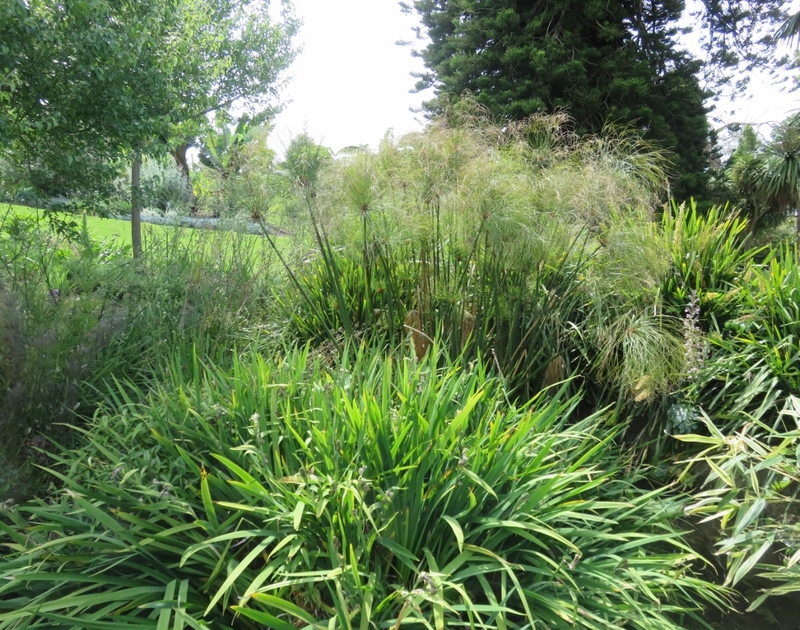 Hidden away amongst the grasses and foliage we could hear frogs before we came to a small bridge and pond ….a great breeding ground for them in this lush garden. 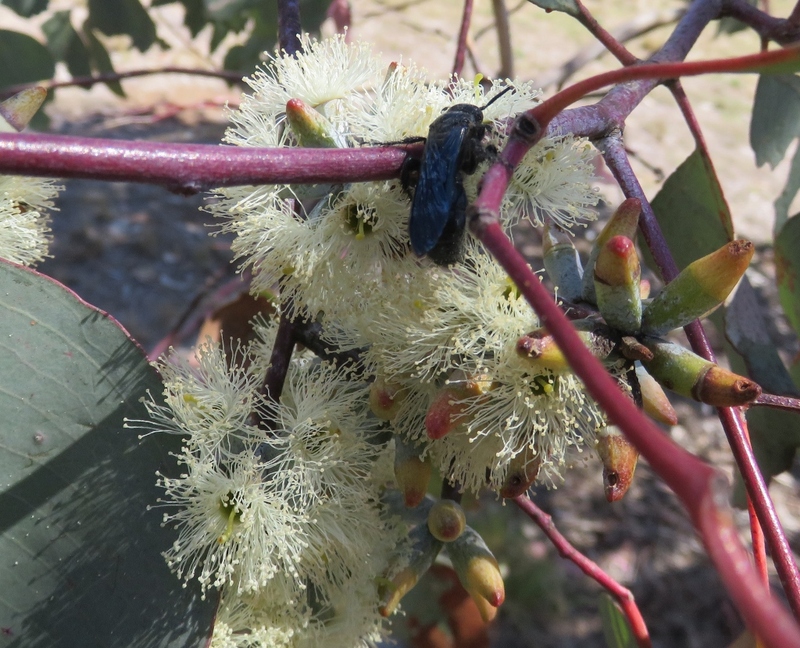 This plant, with multiple blue flowers was a ”one stop shop” for many bees. 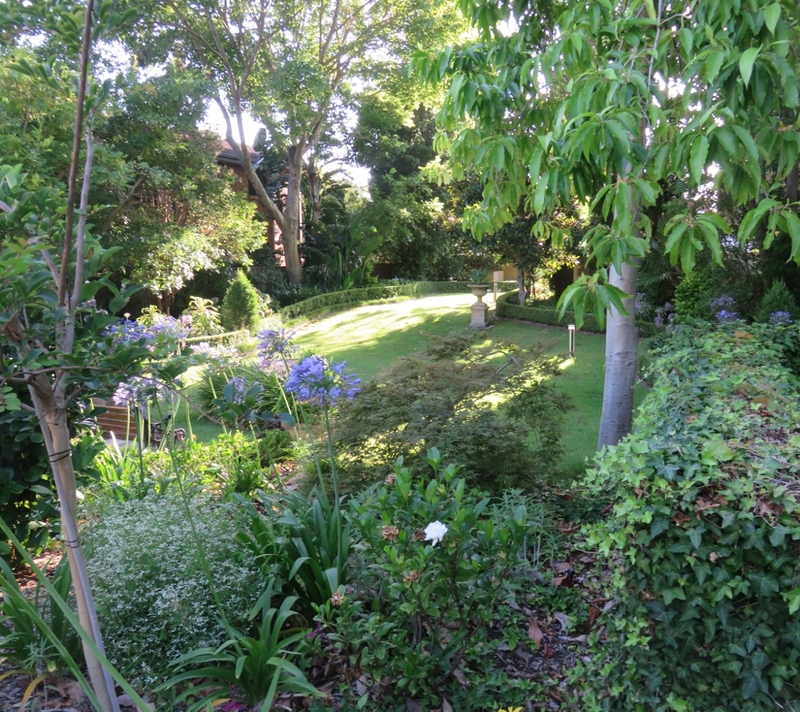 Clive and Penny Blazey have been amazing custodians of this property for years. 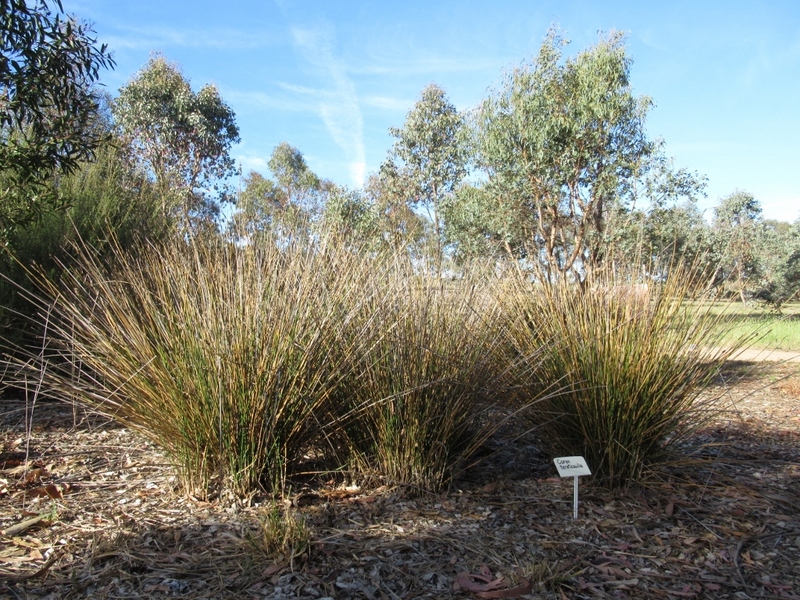 Clive is an advisor for the Seed Saver Exchange in Iowa, USA, which was established around the same time as the Digger’s Club in Australia. 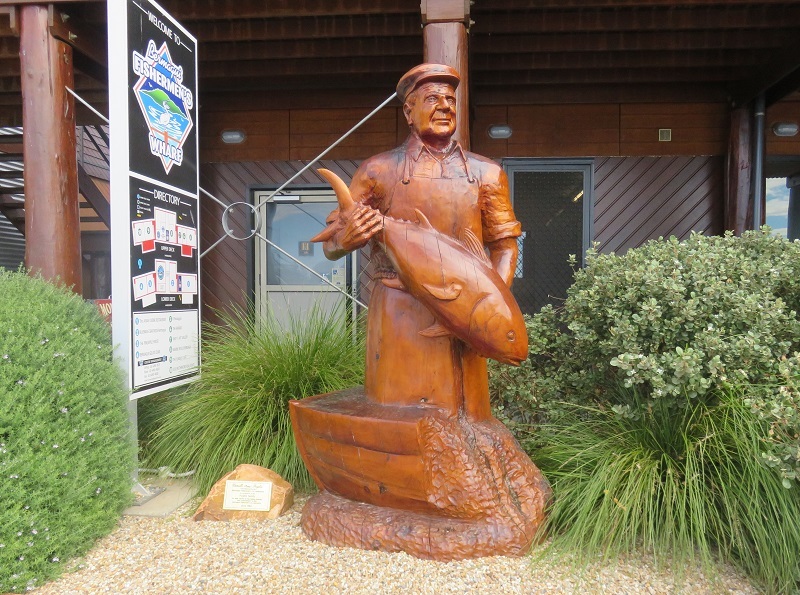 The Digger’s Club has over 75 000 members, and the Blazey family give away a percentage of their profits each year. 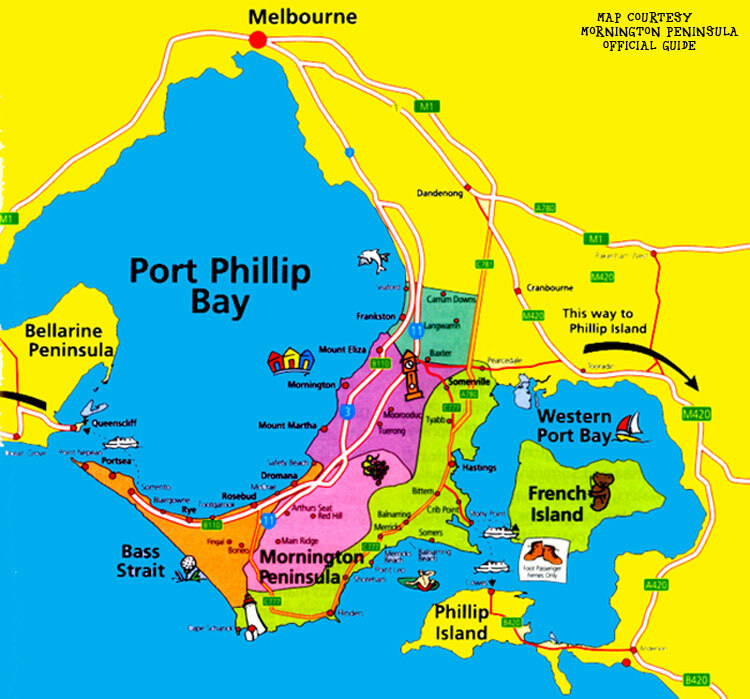 Penny is involved in many charities, both in Australia and abroad. 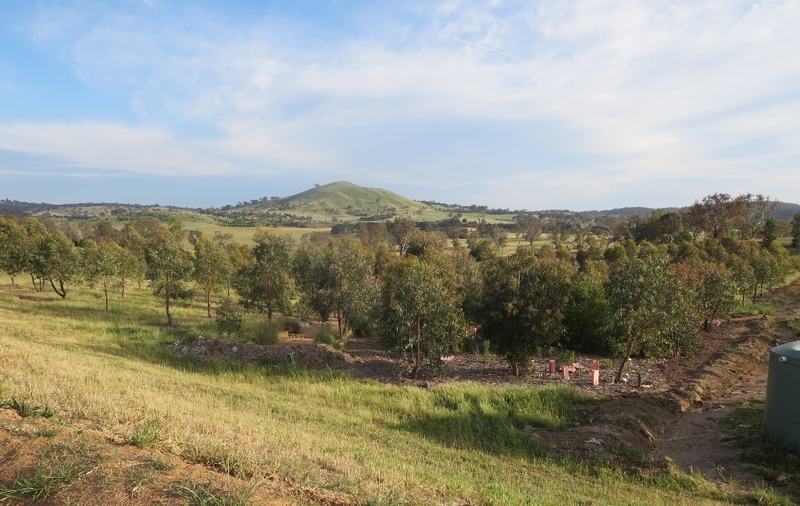 In 2011 the Blazey’s gifted ownership of The Digger’s Club and the gardens of Heronswood and St Erth (near Daylesford) to the Diggers Garden and Environmental Trust. 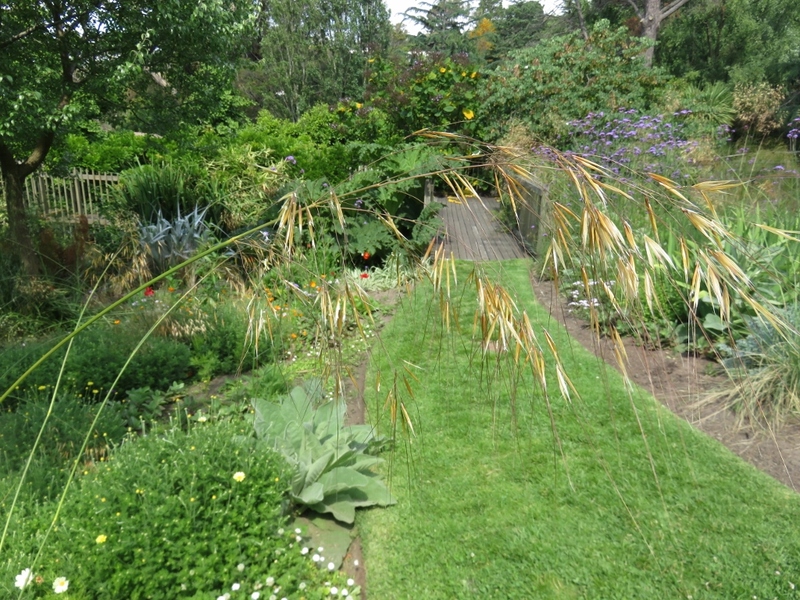 After enjoying this lovely garden, the last words come from Clive Blazey …. 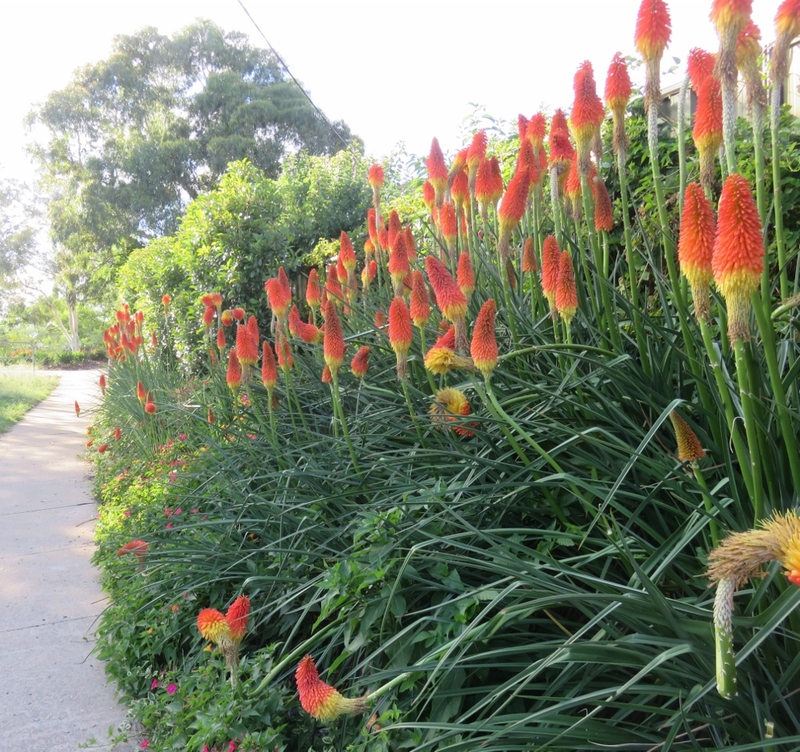 This entry was posted in Victoria and tagged Clive and Penny Blazey, Dromana, Gardening Australia, Heronswood, Mornington Peninsula, The Digger's Club on December 8, 2018 by germac4. 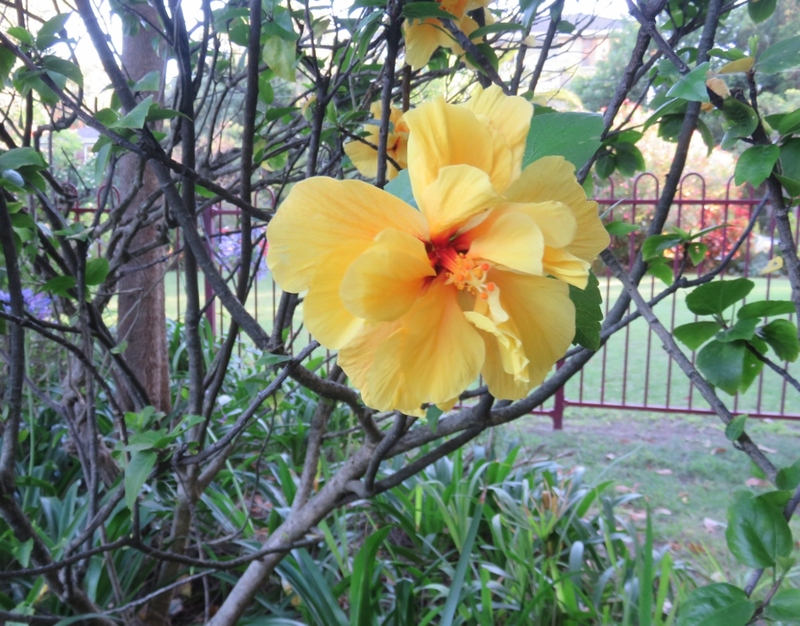 Canberra’s spring: a garden, a cockatoo and a nervous gardener..
We’ve had some rain in spring, and the camellia is flowering beautifully. 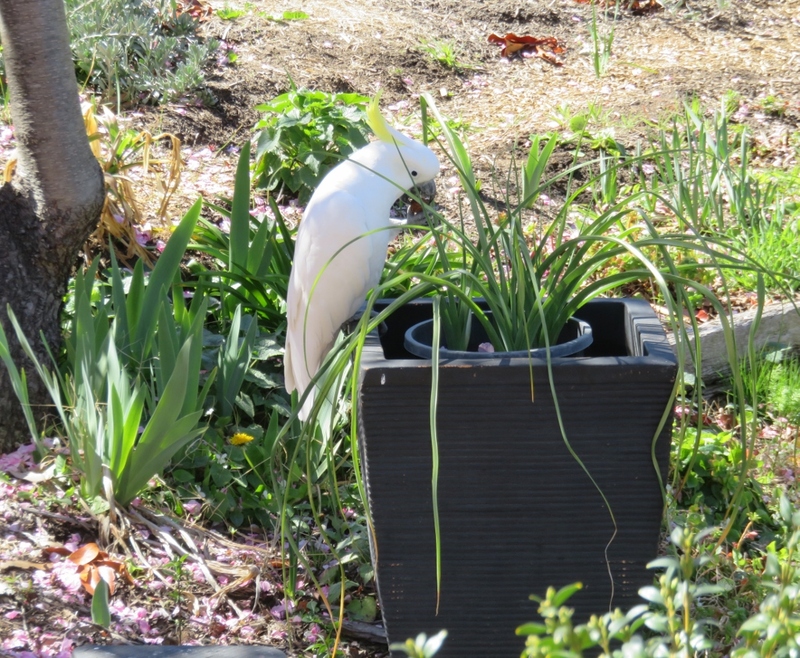 I put the small elephant watering-can close to the flowers one day, and the Wattlebird began to use it for a perch while eating nectar from the flowers. 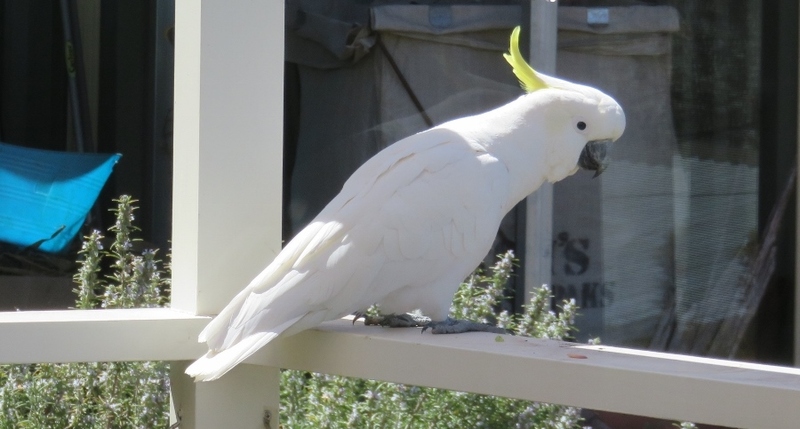 However, today a Sulphur Crested Cockatoo flew down onto our deck, which, as the nuns at my high school would have said, is a mixed blessing. They are such characters, curious and smart, but they can do a lot of damage in a garden with their strong beaks, and wilful personalities..
Fortunately this is a young one, and he has spotted some of the almonds that have fallen from the tree. 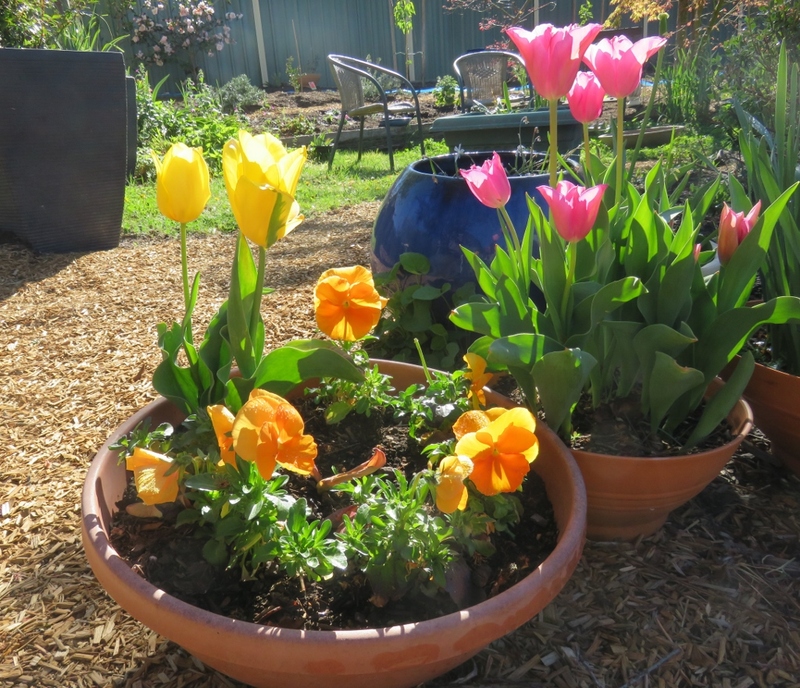 I have just moved these lovely Blue Dutch Irises into the pot…..fortunately the almond is keeping him happy, and it is a lucky thing that the Dutch iris is not flowering yet. 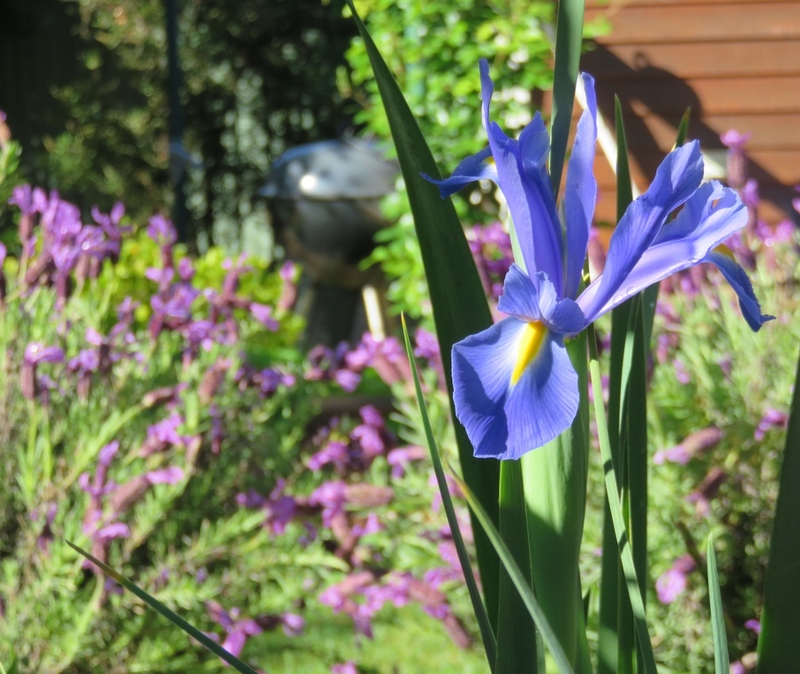 Fortunately the Dutch Irises survived and flowered….how lovely they are! 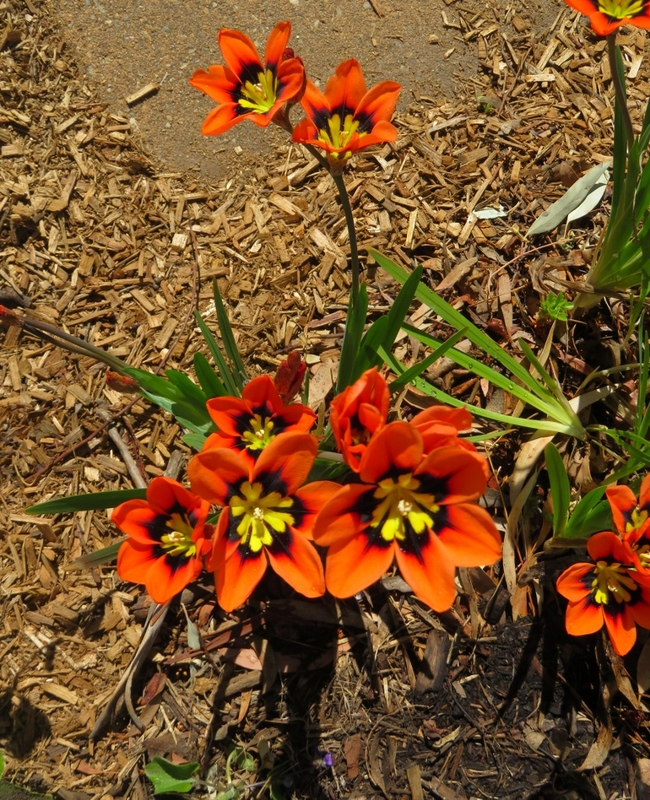 The orange Sparaxis came from a cutting in my mother’s garden in Port Macquarie….18 years ago or more! 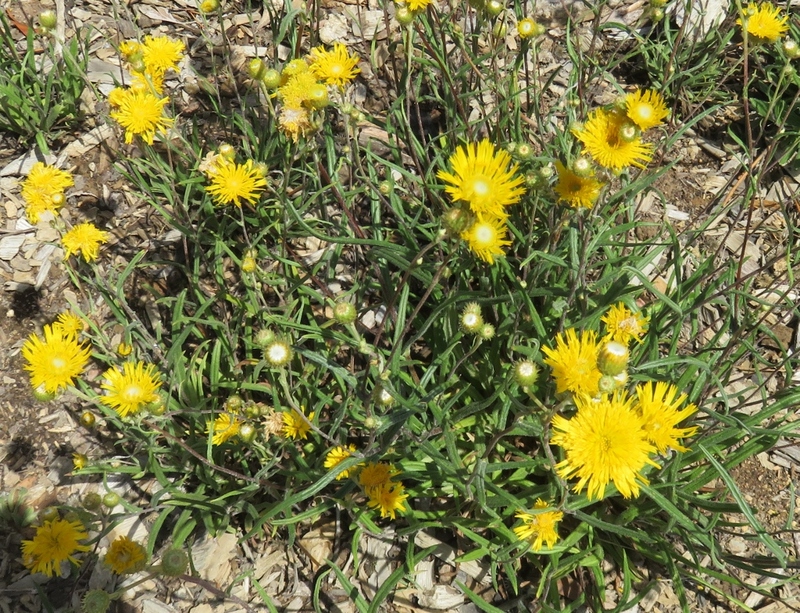 However, this is the first year there are so few flowers, the combination of lack of water, and my neglect of the garden… I’ve apologised to them too. 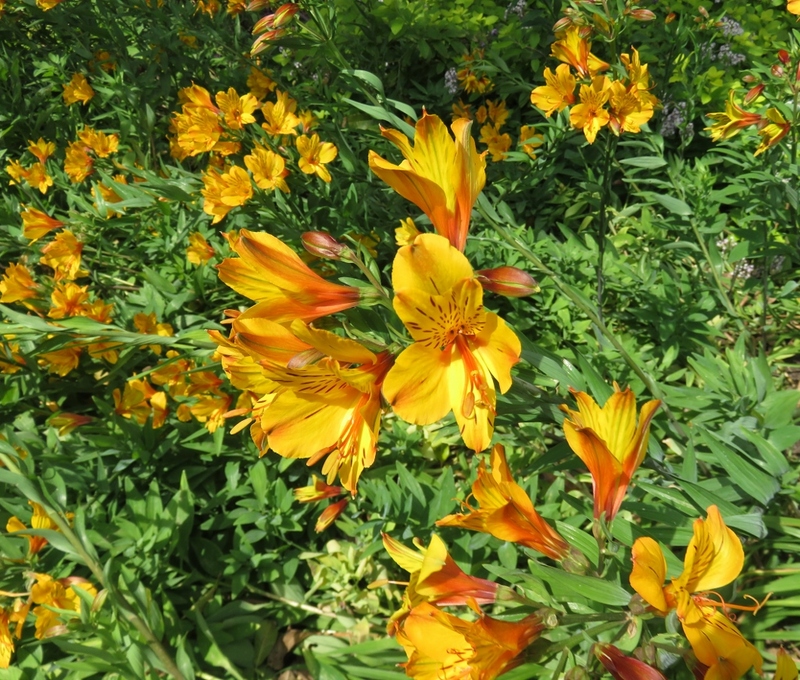 We have Aquilegias flowering all through the garden, such a delicate flower, but yet tough, and a rewarding plant in the garden in our part of the world..
My favourite flower this year is Ixia, sometimes known as the Corn Lily plant, and I have read that it is an exotic member of the Iris family. 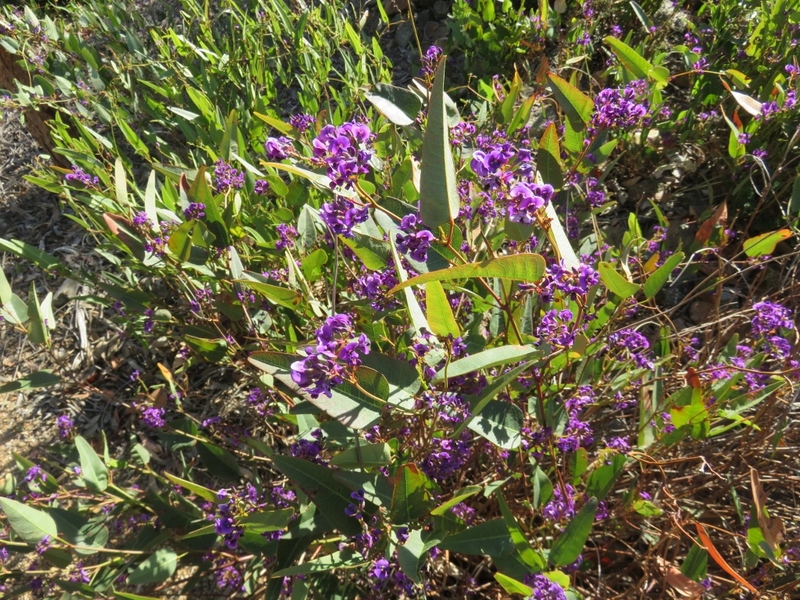 A small but gorgeous spring plant, and it is surrounded by Salvias here .. 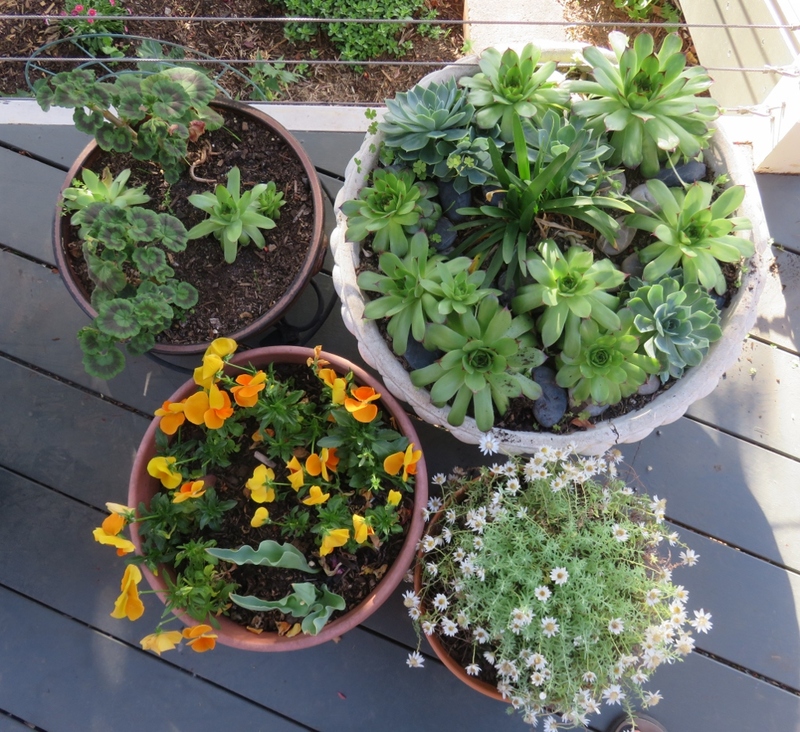 The succulents are doing well. 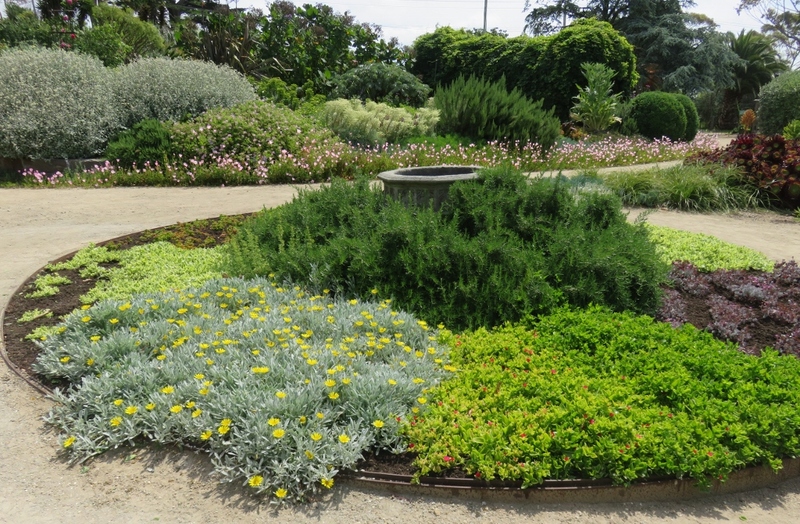 The bowl on the top right is an old birdbath. 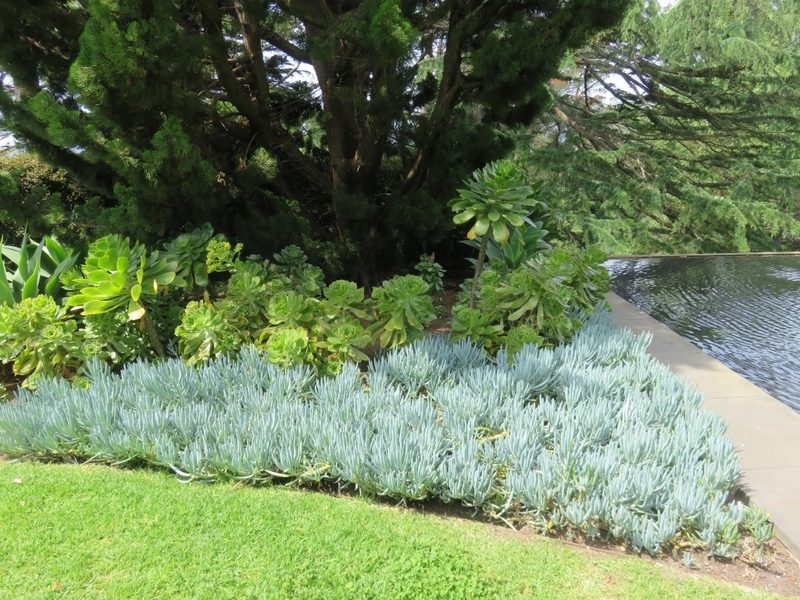 Last year I described filling the birdbath with succulents, small smooth stones, and a miniature agapanthus. 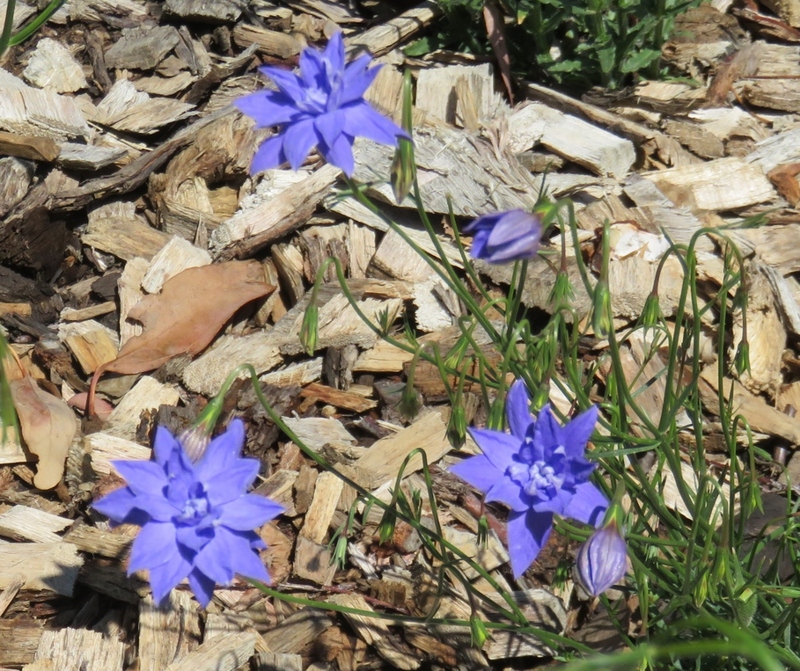 While I was eating lunch on the deck that day, a curious young Magpie flew down and pulled the agapanthus out! I had to cover the whole birdbath with the newspaper to distract him. Everything has survived. Birds and plants! 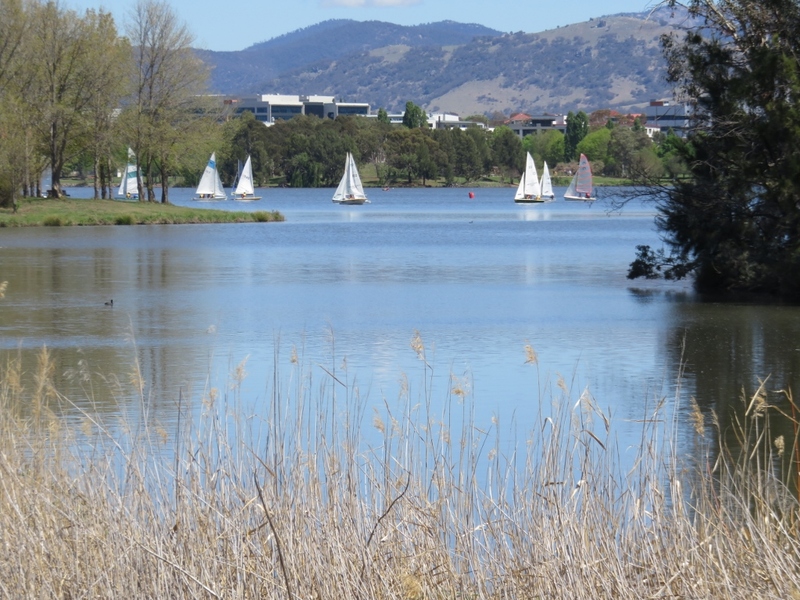 After a day of rain we went for a walk along Lake Tuggeranong. 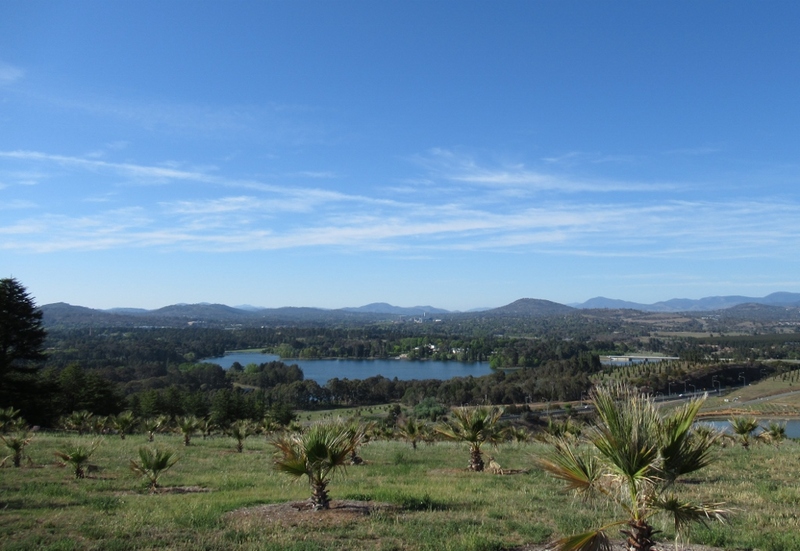 The azure sky and soft blue Brindabella Mountains looked lovely…it is beginning to look like summer.. 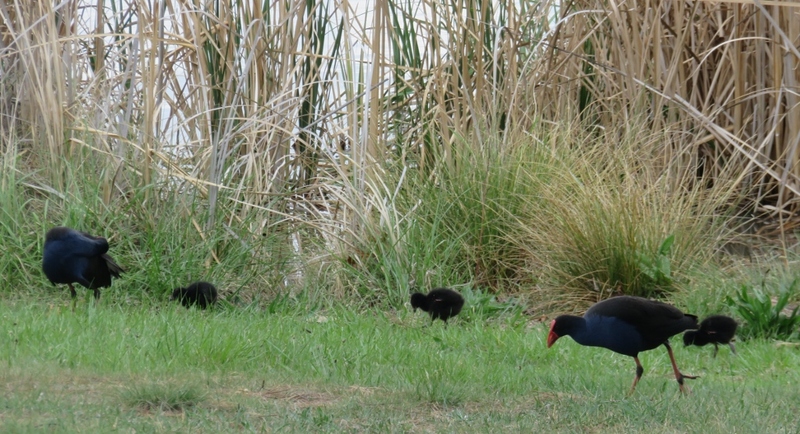 The Purple Swamphen is on guard by the nest, and the other adults are venturing further afield with the young ones….it was hard to get a photo, but they did look very cute! 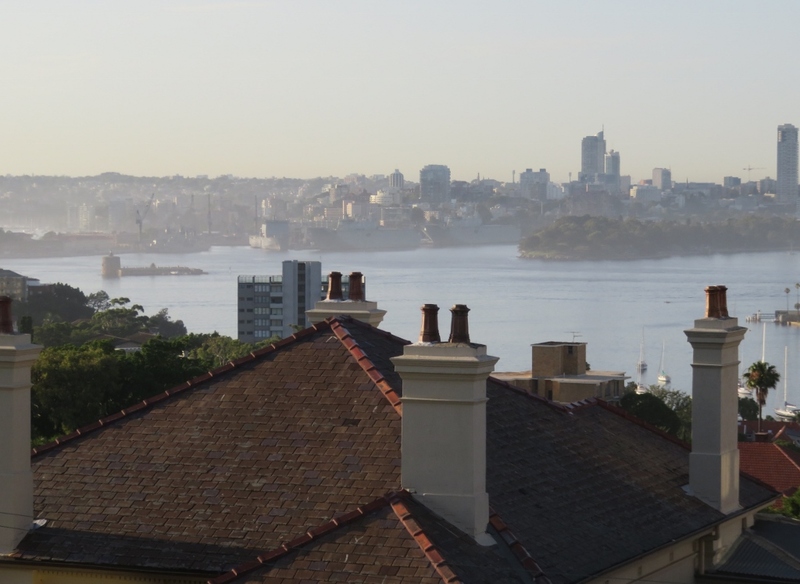 I would love to say the water below is an Australian icon…a Billabong, but it is really a very large puddle! 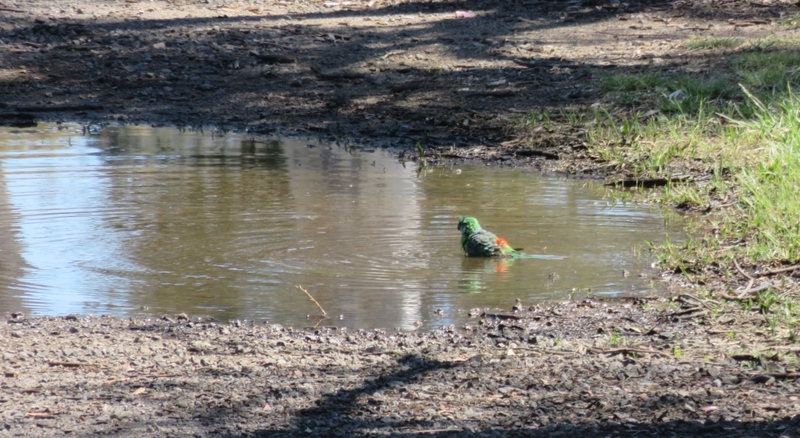 In the water is a Red-rumped Parrot, (male). 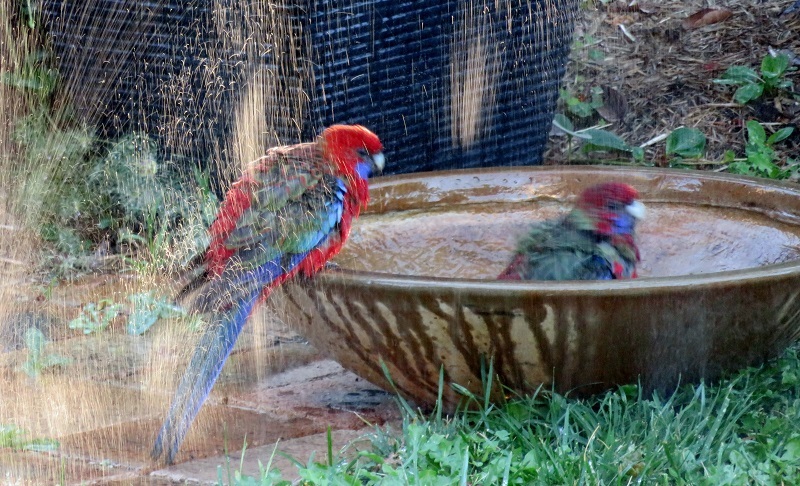 Usually a quiet unobtrusive member of the parrot family, today he was splashing about and loving having a bath. It’s been a long time since he’s had the joy of a bath as big as this…..and he doesn’t care who is watching! 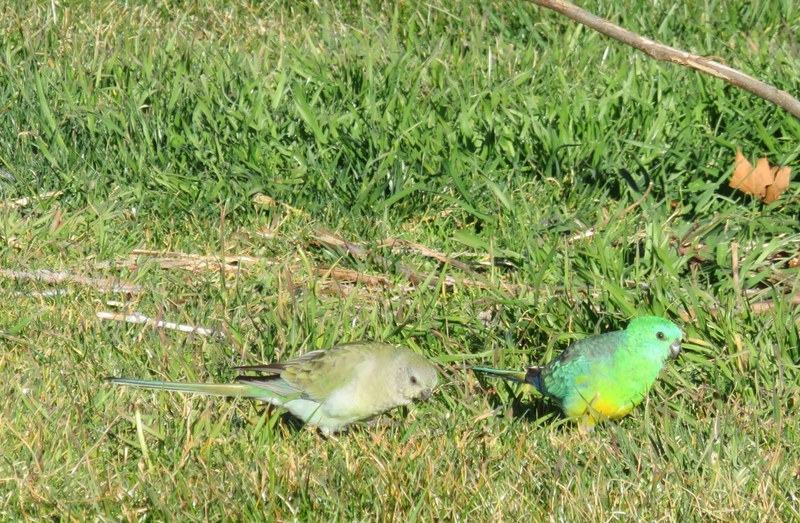 The Red-rumped parrots are always found in pairs and small groups in grassy areas..
….and back home, we are soon to welcome our daughter and granddaughter for a visit. 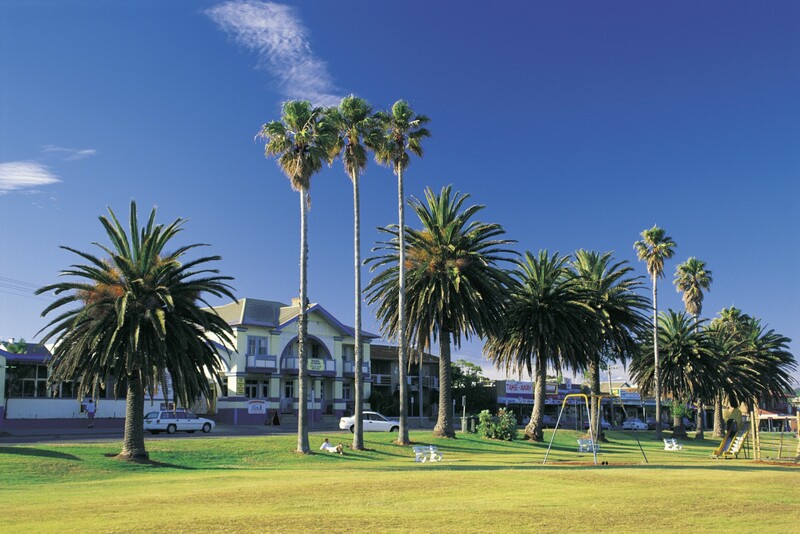 This will be our granddaughter’s first visit since she learnt to walk. 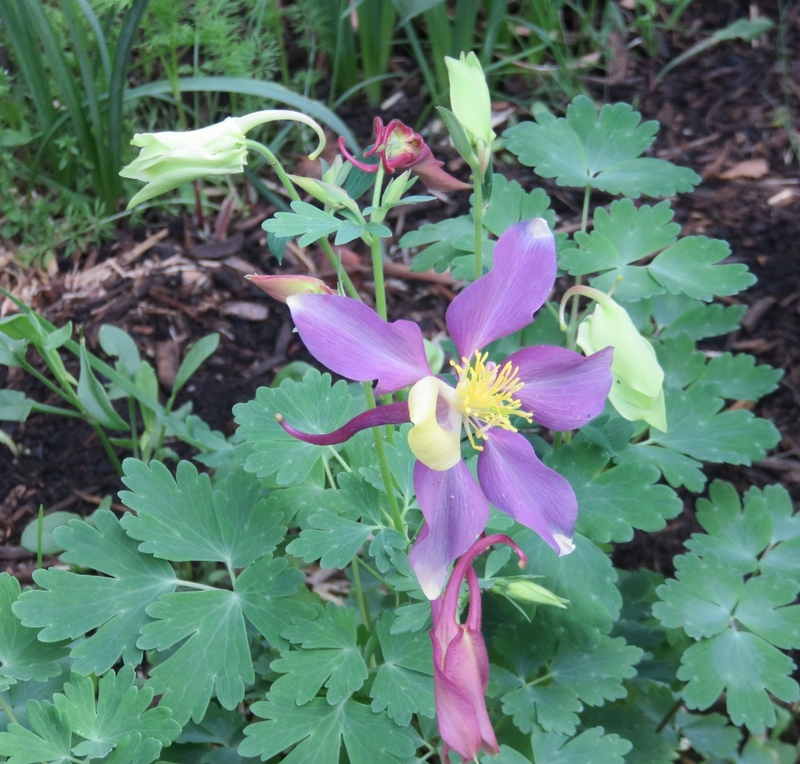 The world looks so different when you are up on two feet…. …. and I wonder if she is up to a holding a watering can yet? 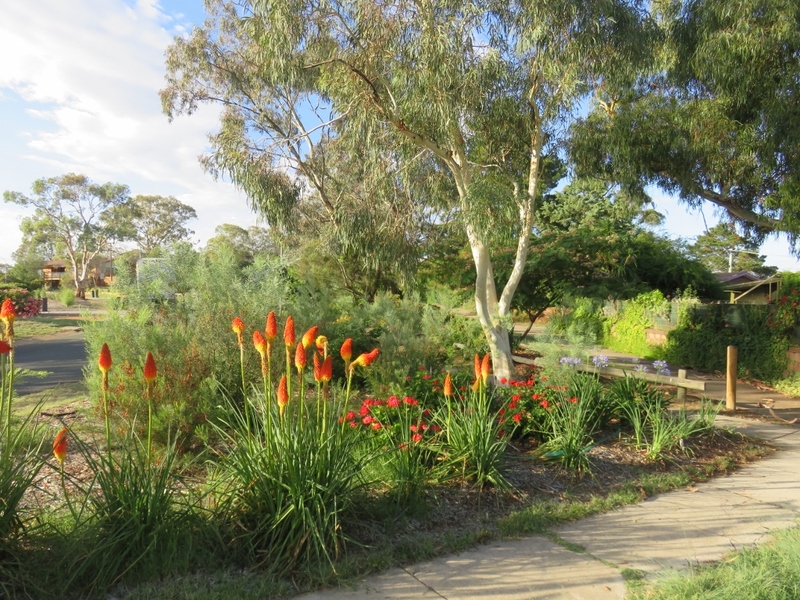 This entry was posted in Canberra's Suburban Gardens, Wildlife in the suburbs and tagged aquilegias, camellias, Dutch Irises, Ixia, Lake Tuggeraong., Orange Sparaxis, Purple Swamphen, Red Wattlebird, Red-rumped Parrot, Suphur Crested Cockatoo, tulips on October 27, 2018 by germac4.